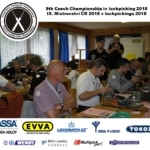 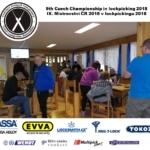 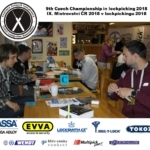 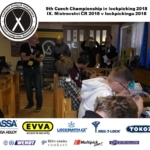 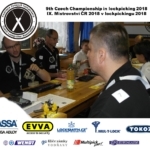 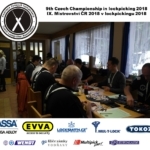 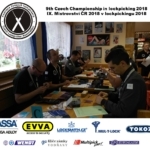 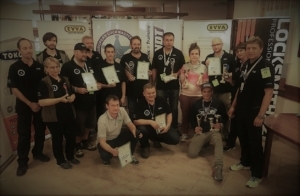 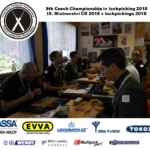 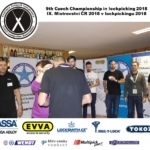 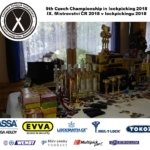 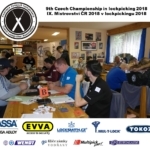 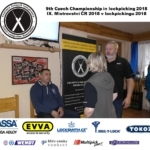 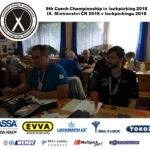 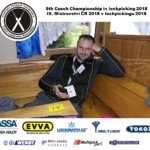 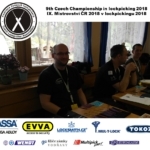 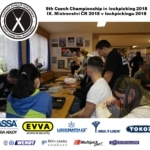 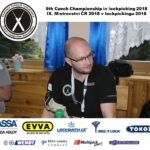 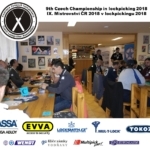 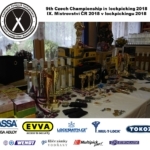 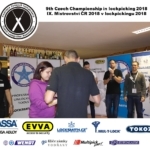 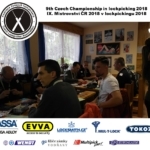 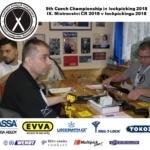 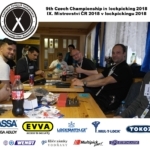 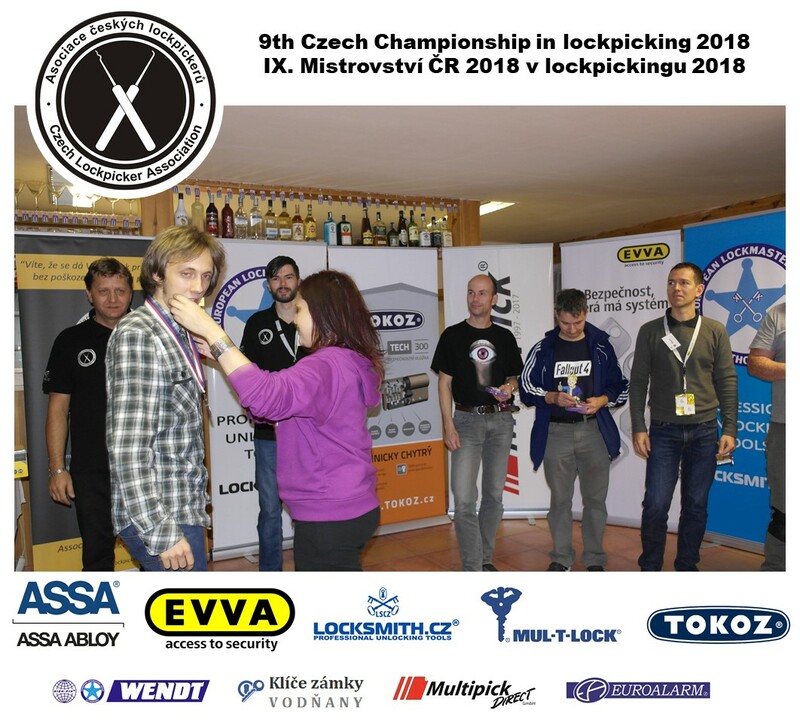 The 9th Czech Championship in Lockpicking is already behind us, let’s review how it all went down. 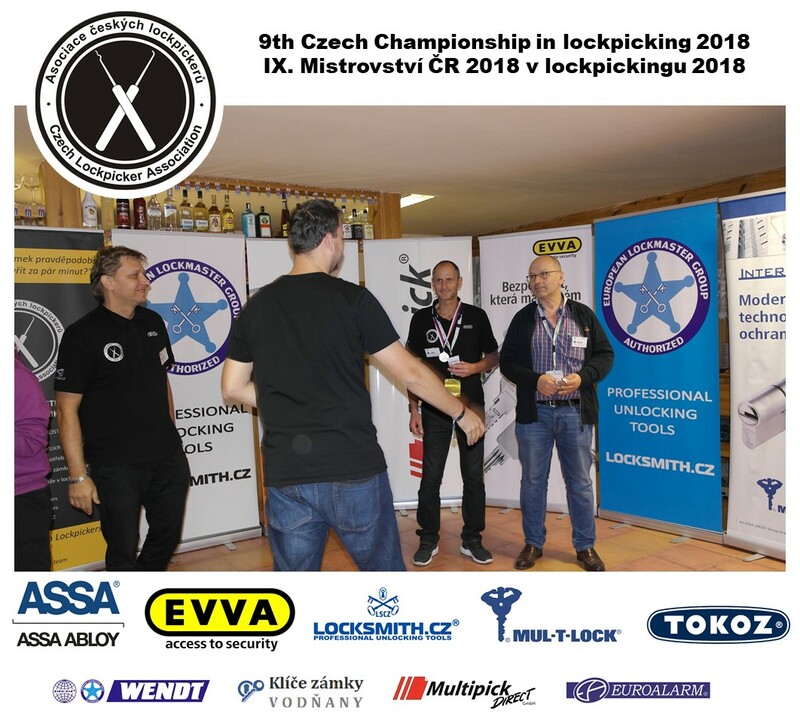 This year’s edition took place on 20 – 21 October 2018 in Nová Živohošť. 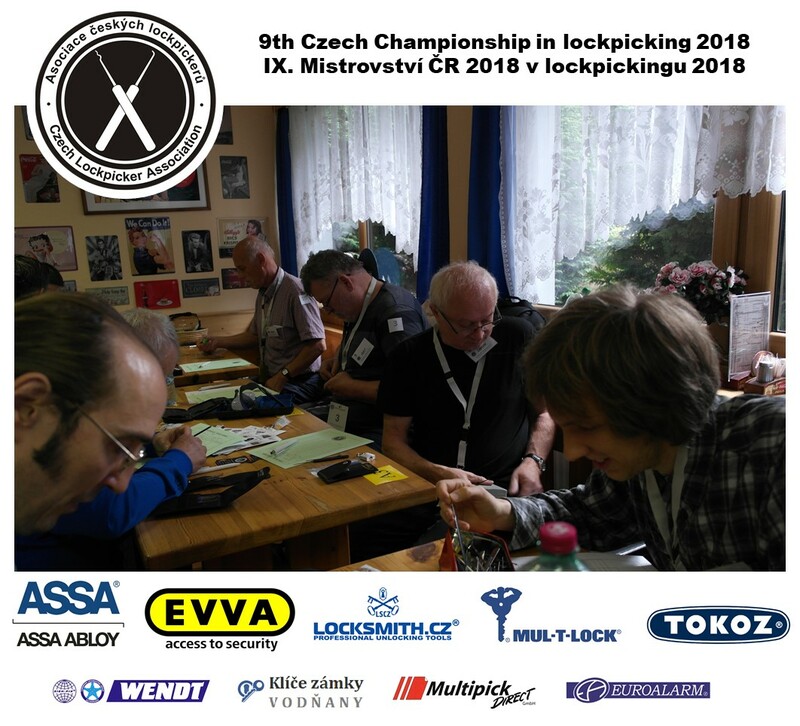 This year we had a total of 29 lockpickers from the Czech Republic, Germany, Austria, Hungary and Italy. 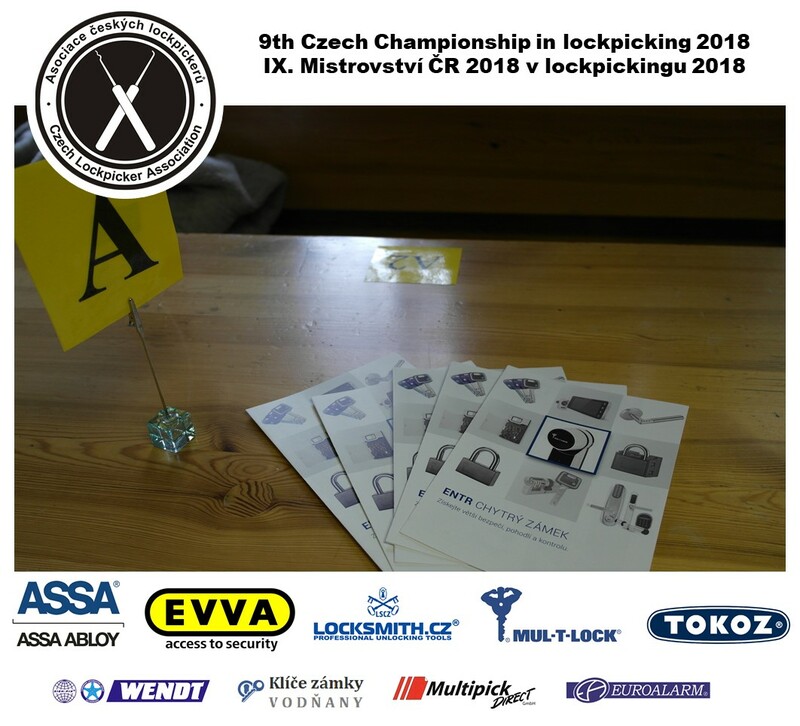 Need to thank our sponsors that provided not only locks for competition but also a number of valuable prizes. 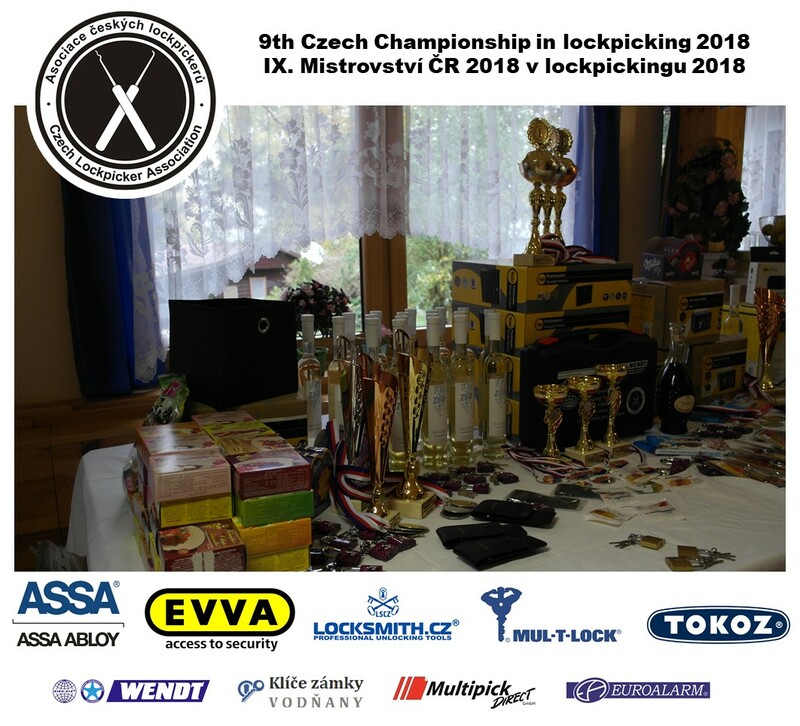 Similarly as in previous year, we competed in four disciplines. 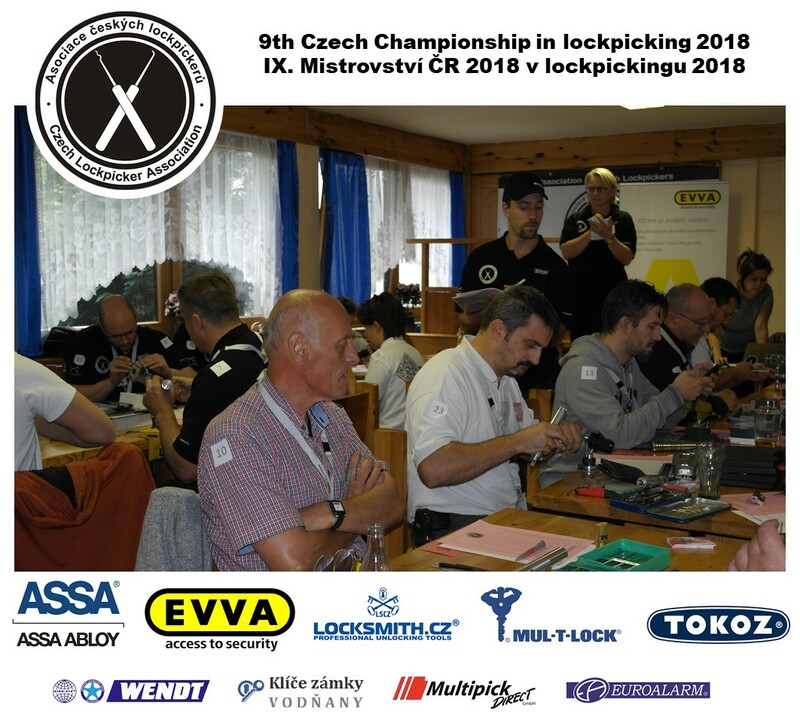 The first discipline was opening of padlocks. 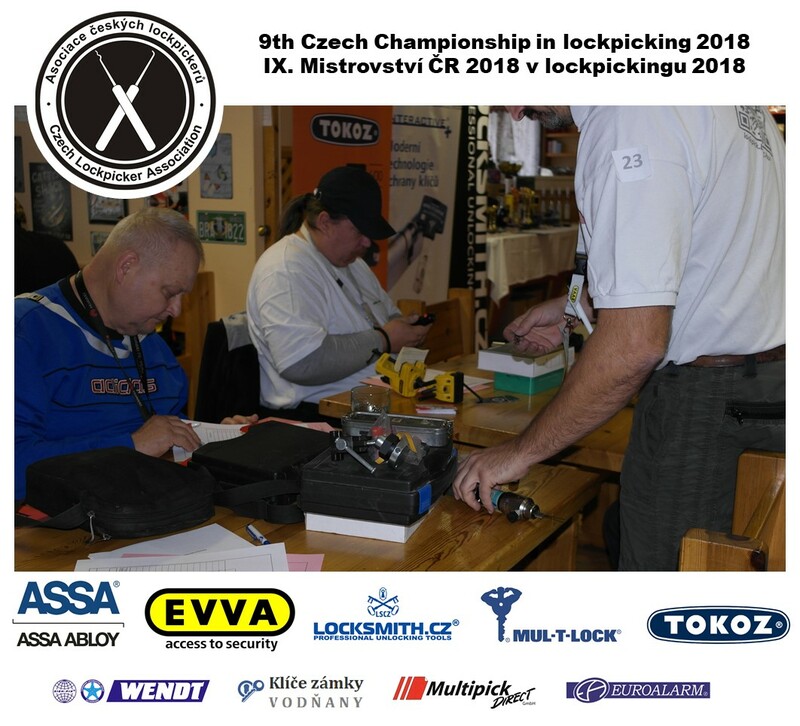 This year’s padlocks were donated mostly by the companies TOKOZ, FAB and Keys and Locks Vodňany. 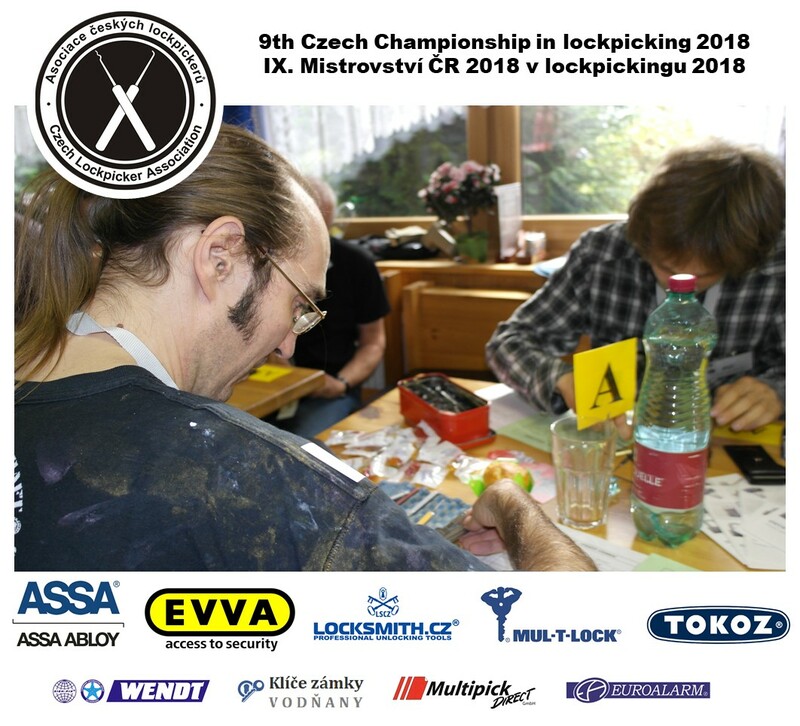 They were mostly simpler models so the contestants more often struggled with the small size of the keyholes rather than the complexity of the locking mechanisms. 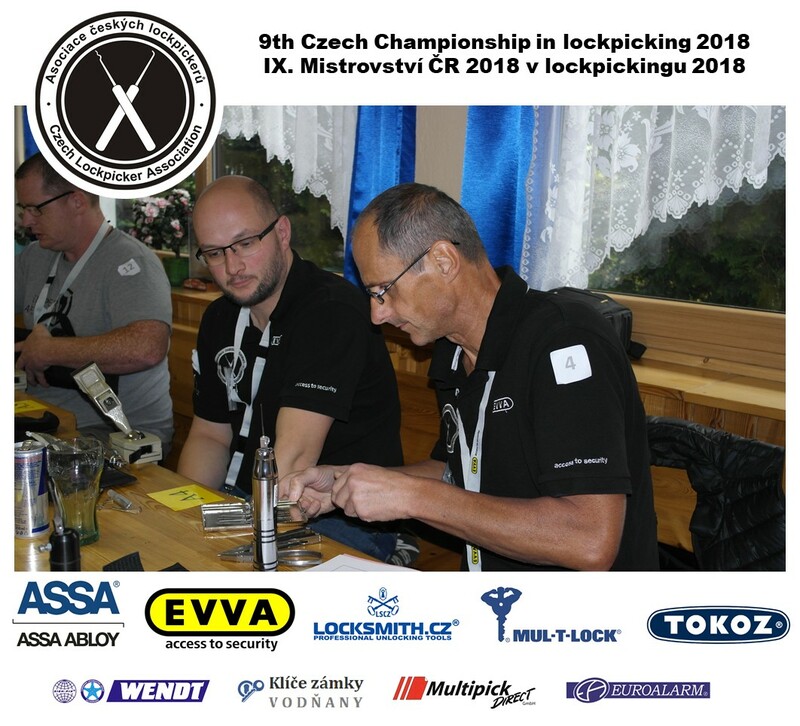 In the discipline of opening euro profile cylinders, each competitor brought his own lock. 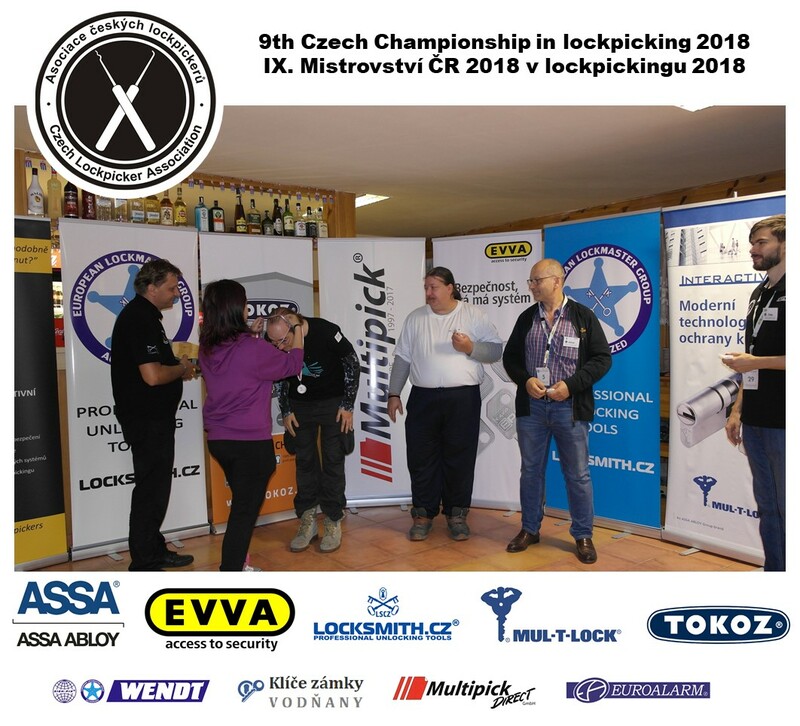 Each contestant had had to open his/her lock in a shortened time limit of 5 minutes before the start, otherwise, they were eliminated from the competition. 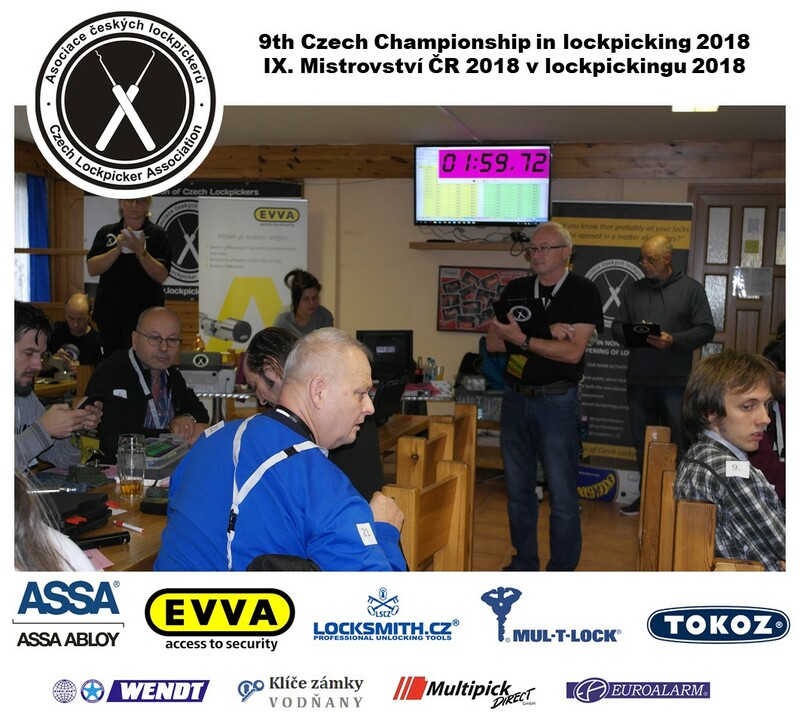 The time limit for the following rounds was 15 minutes. 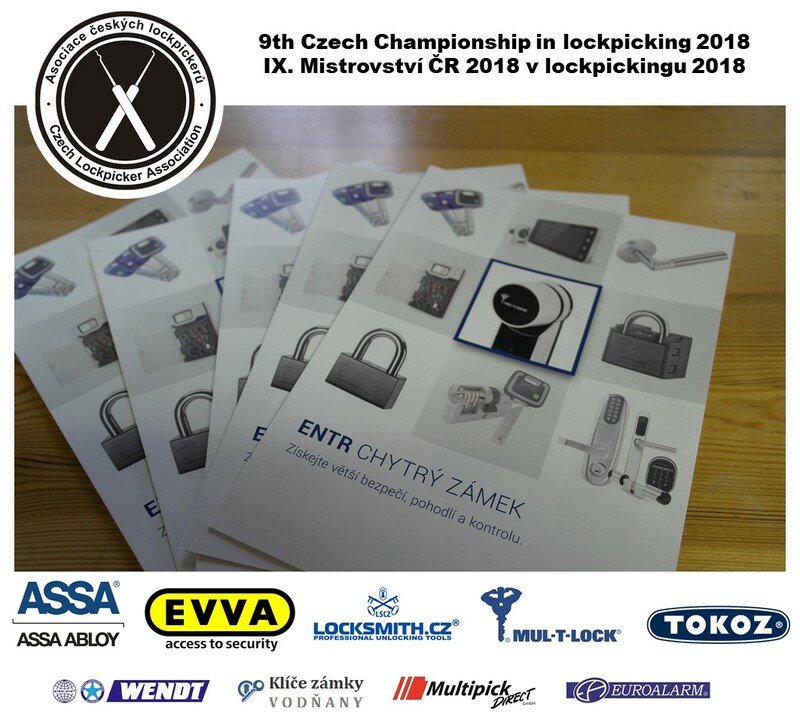 We saw a large variety of locks of various manufacturers including FAB, GeGe, Mul-T-Lock, ISEO, Viro and M&C. 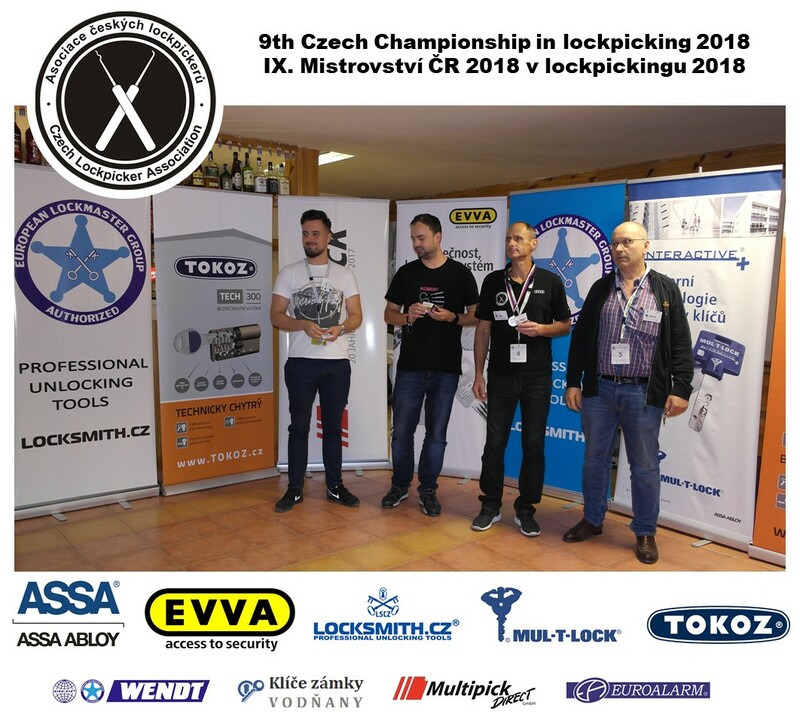 Only 2 locks remained undefeated (by other than their owners): DOM ix brought by the champion of this discipline, Akos Subecz from Hungary and GeGe pExtra by Hugo Platzer from Austria, winner of the B-Finals. 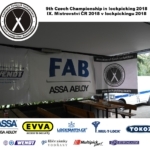 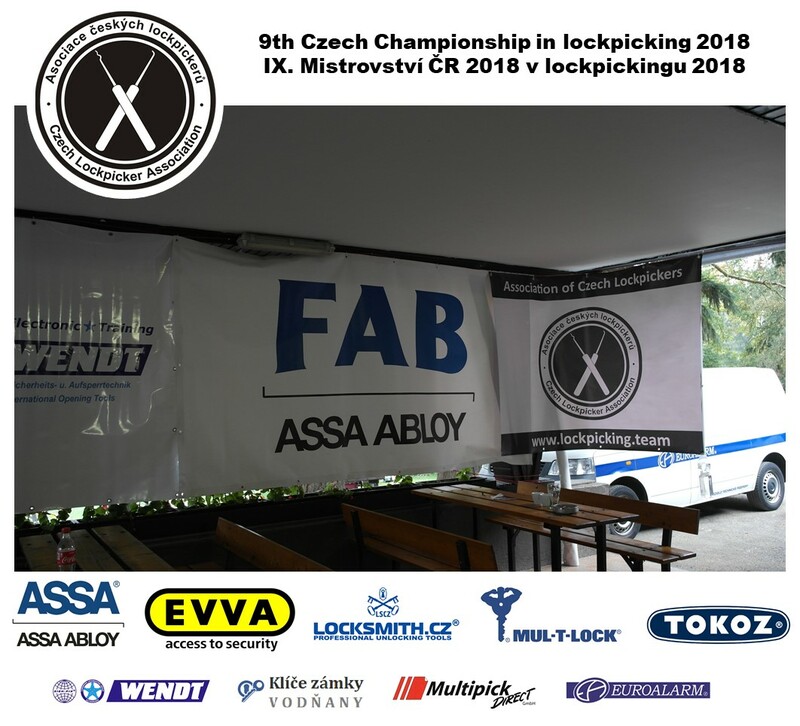 Locks for freestyle were again donated by our sponsors, especially EVVA and FAB. 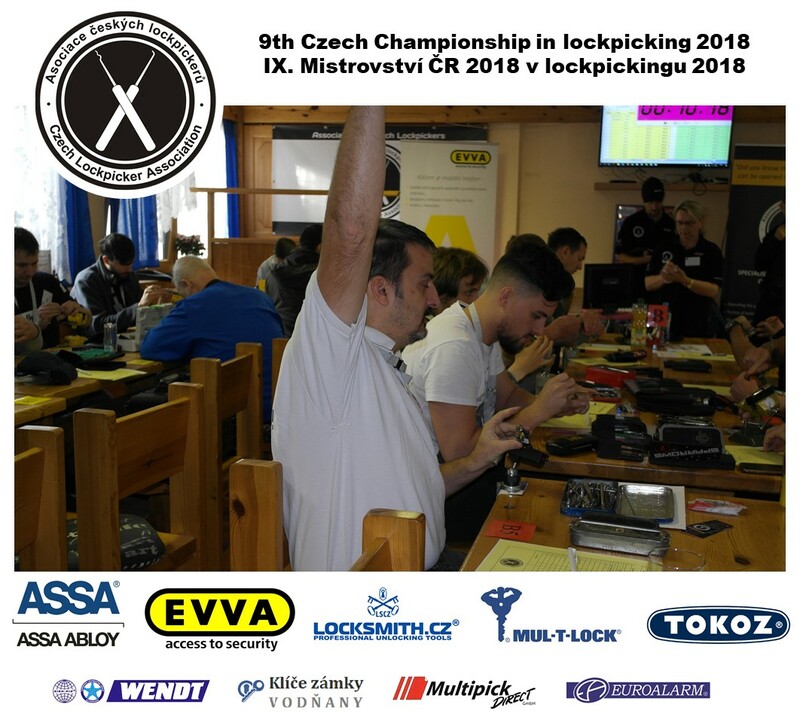 Most of the competition locks were defeated using electric pic guns with the exception of the EVVA HPM EPS padlocks of which only a few were picked using standard picks within the short 5 minutes limit. 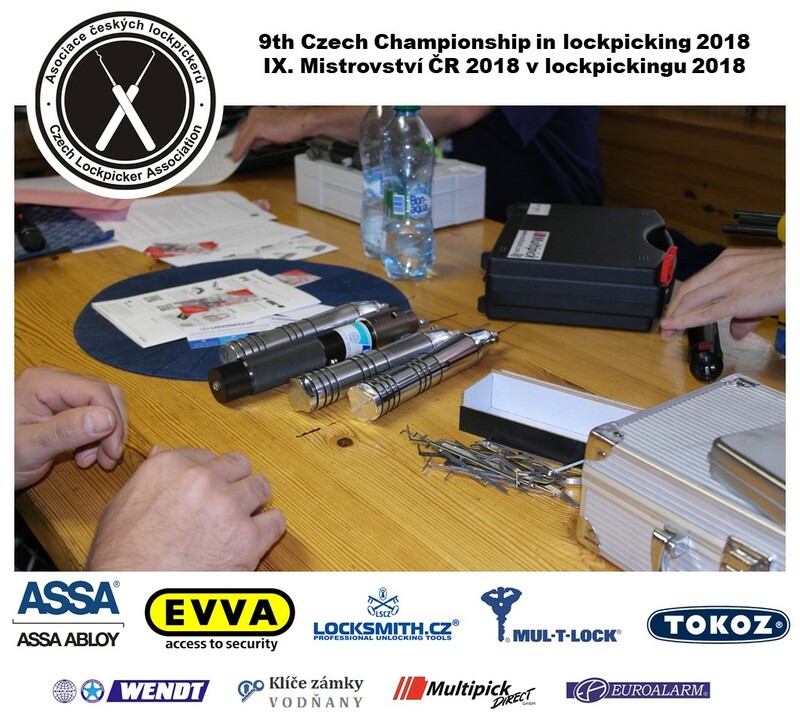 Mul-T-Lock locks were also included in the final rounds; these were also defeated only using standard picks. 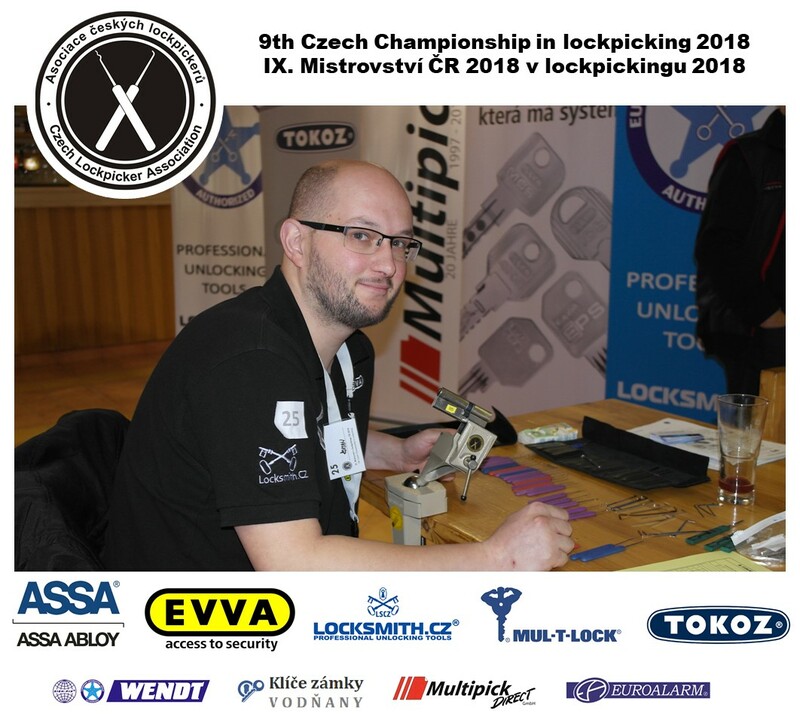 In the blitz (1-minute openings), our Czech representative Miroslav Buchbauer defeated all other lockpickers. 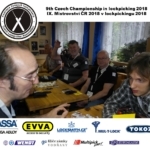 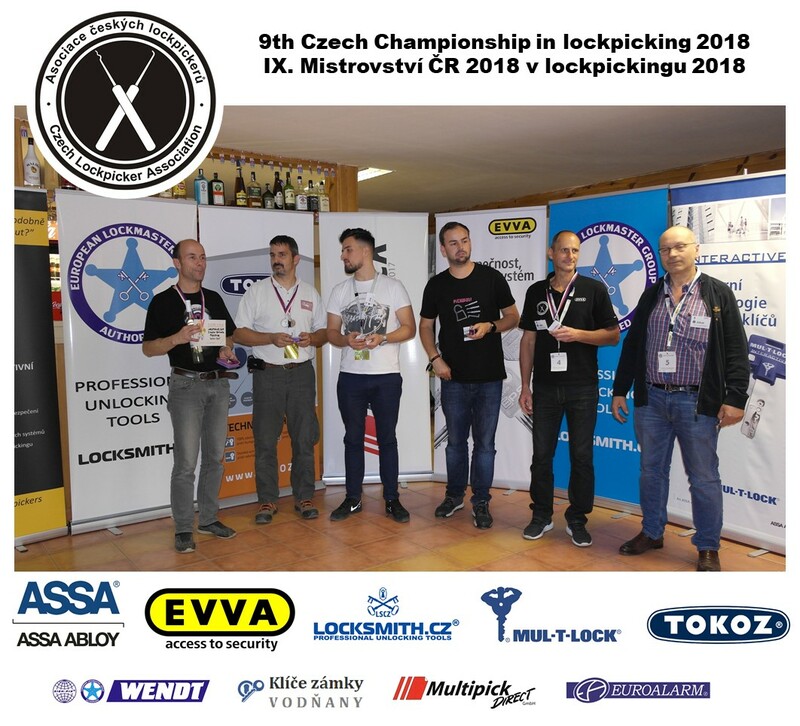 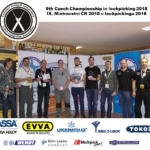 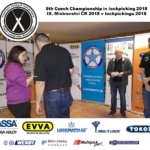 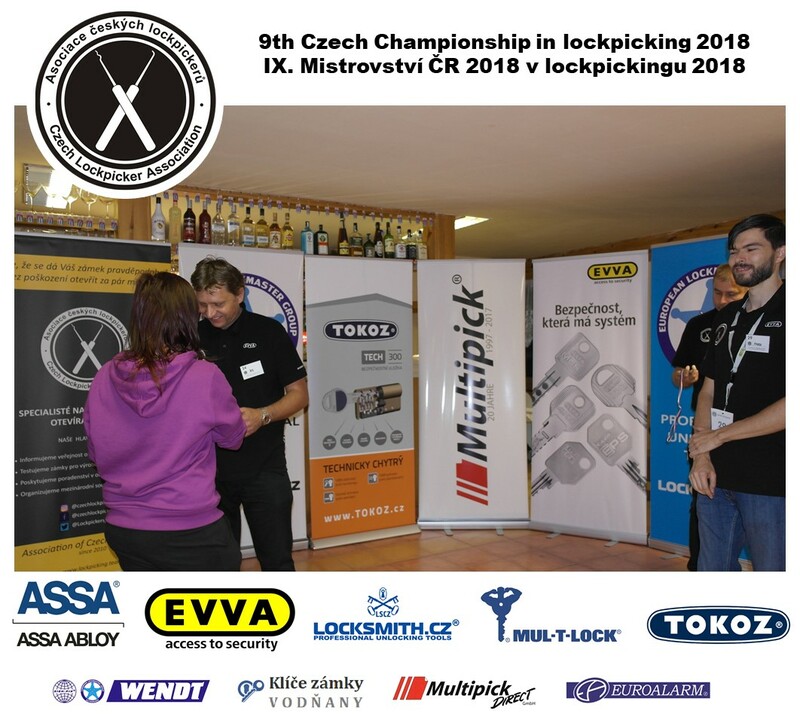 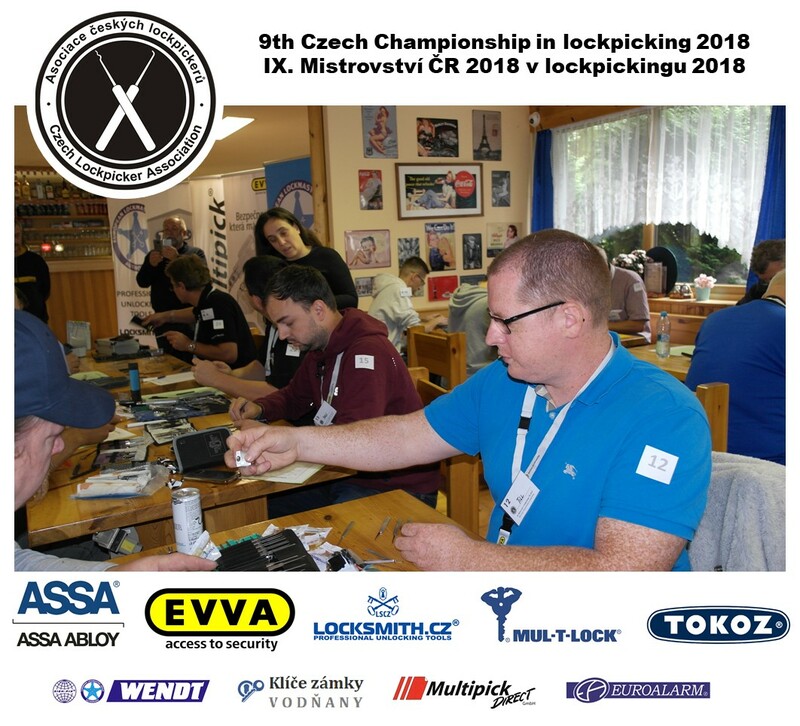 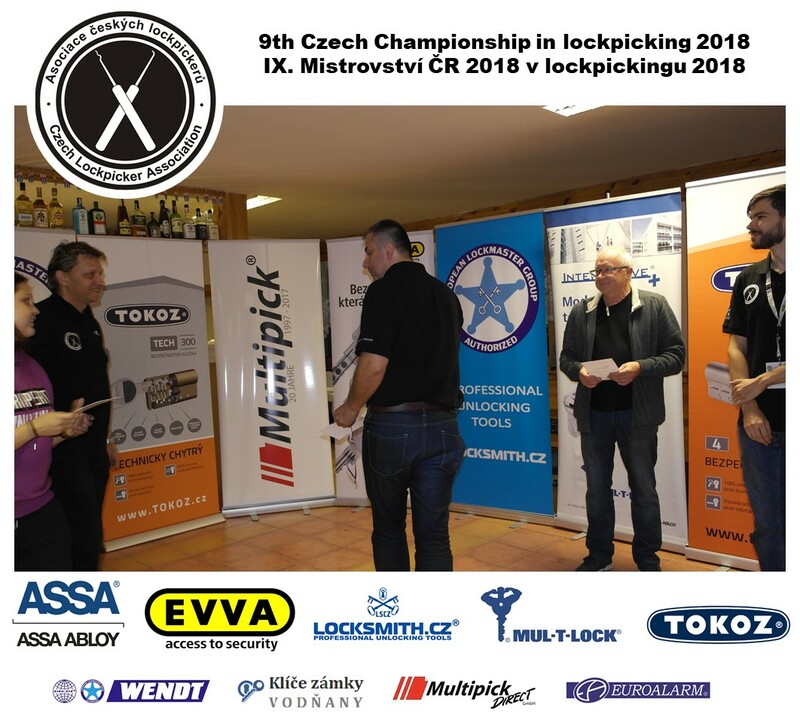 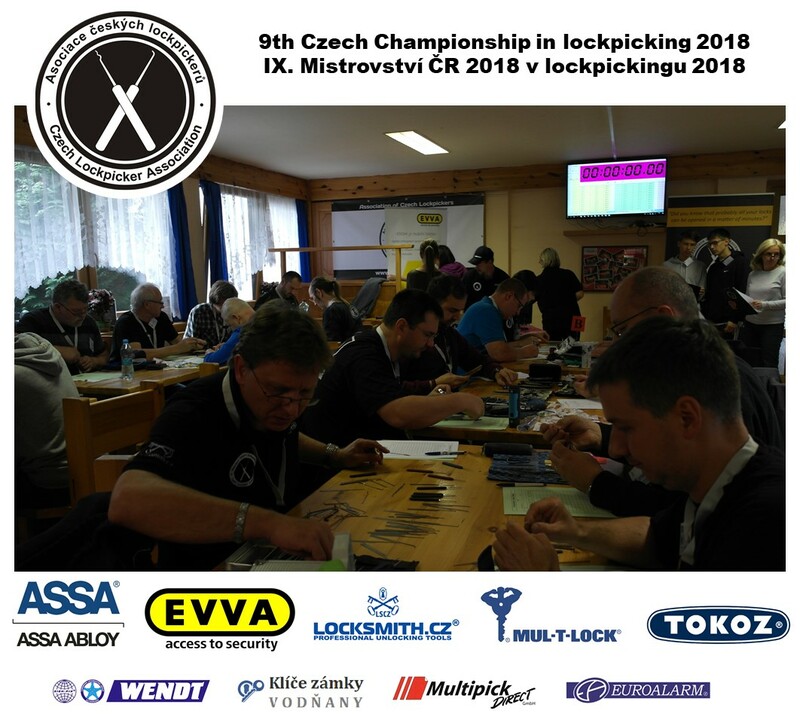 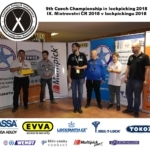 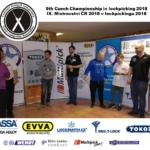 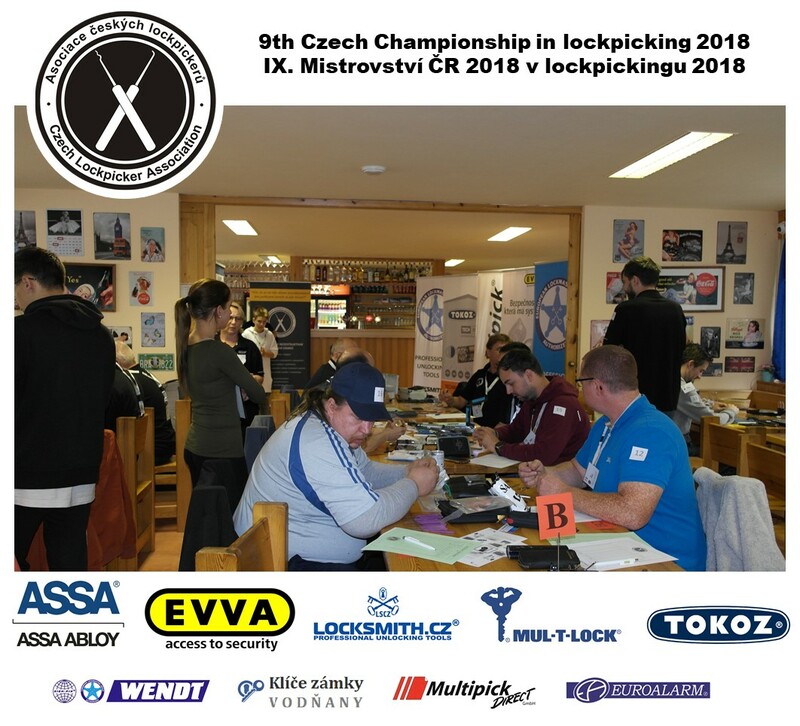 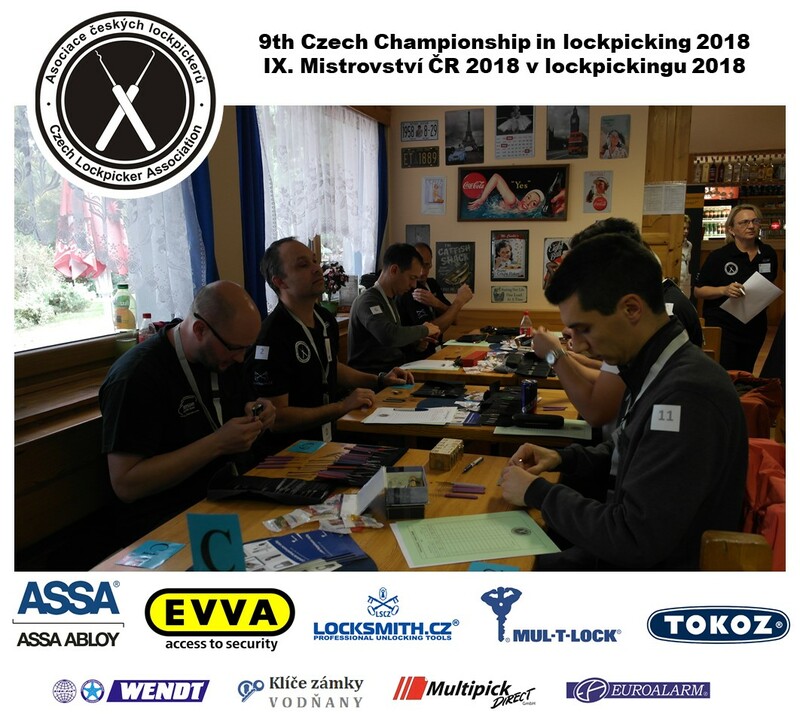 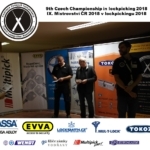 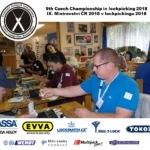 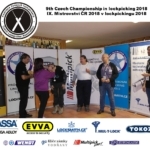 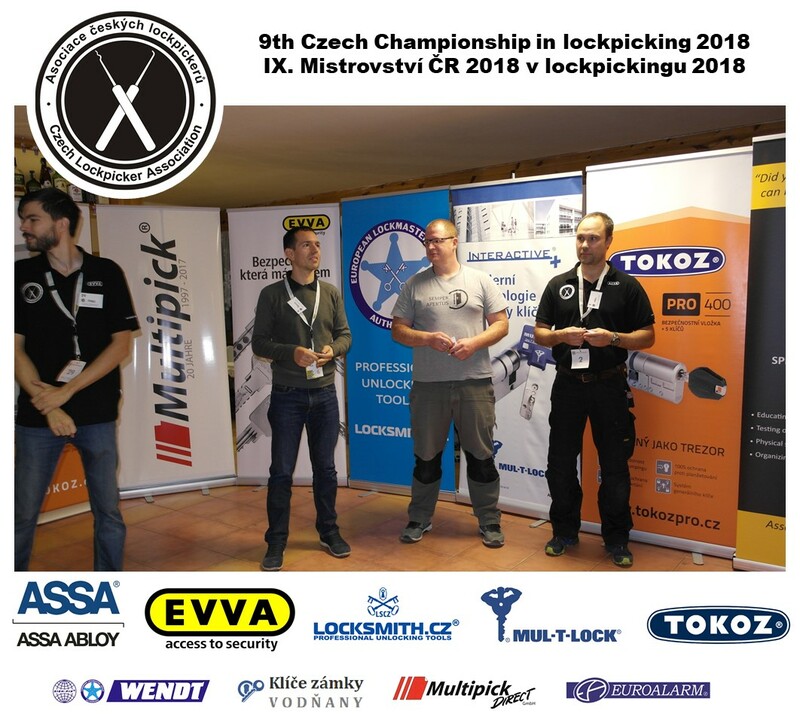 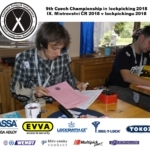 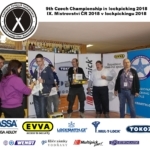 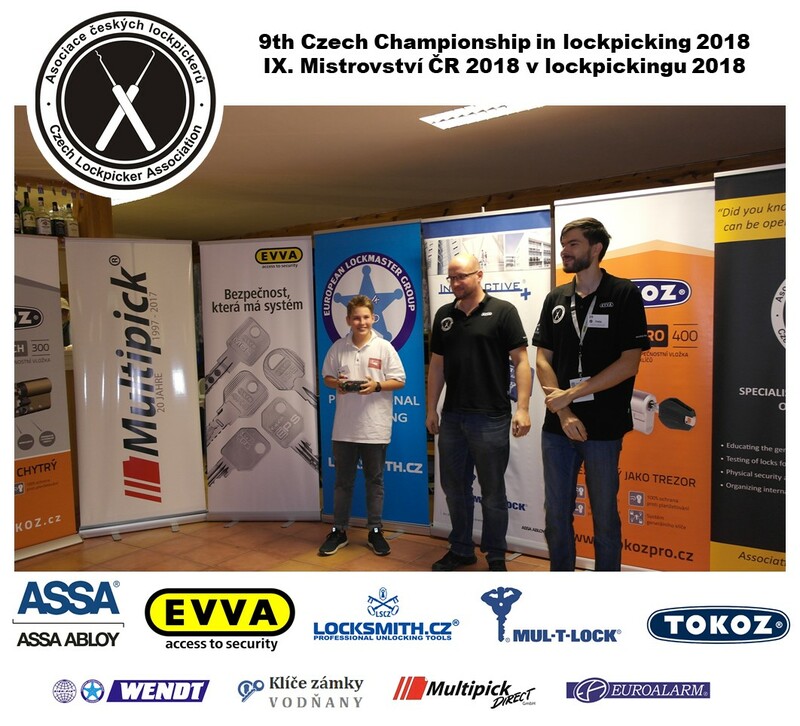 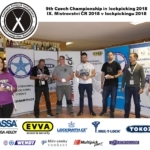 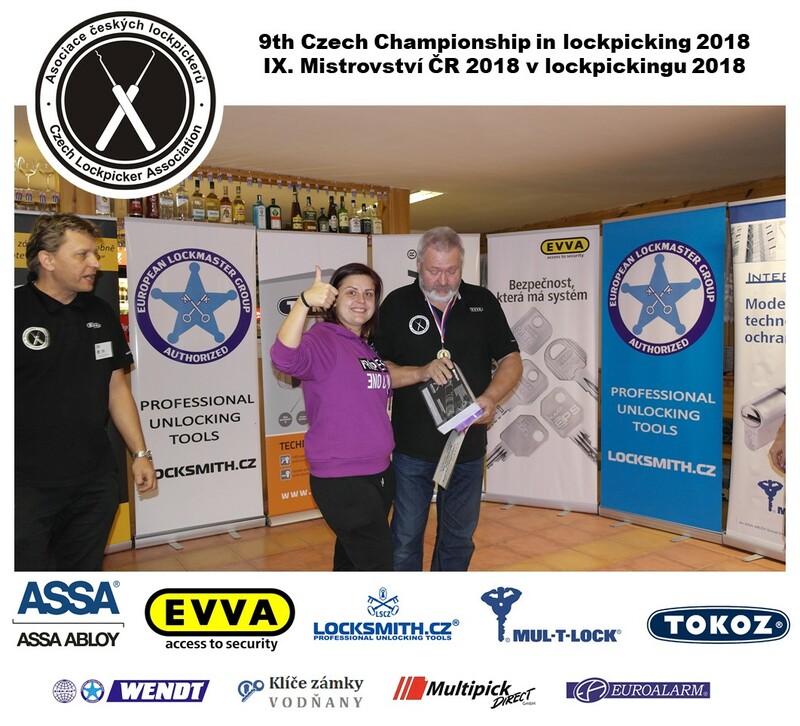 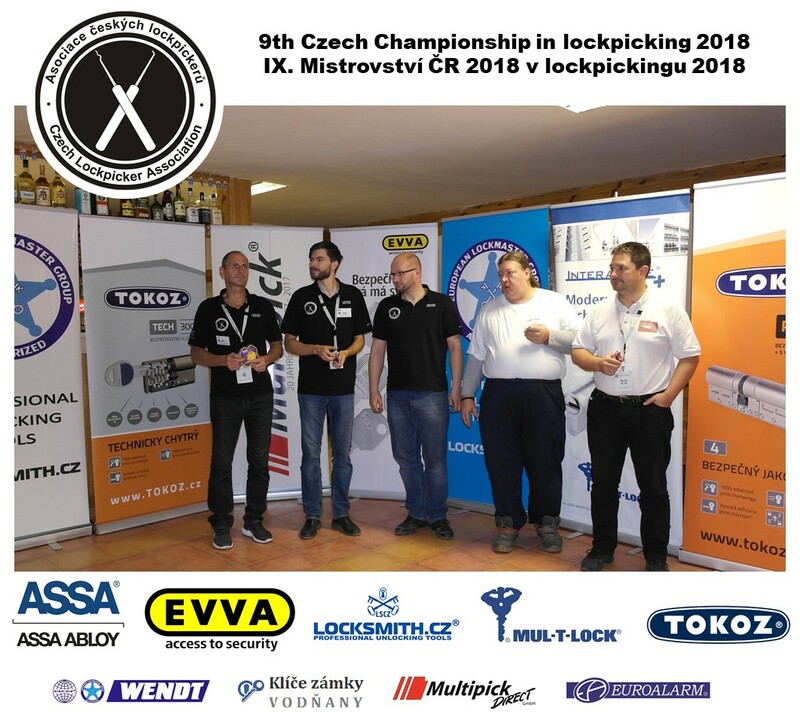 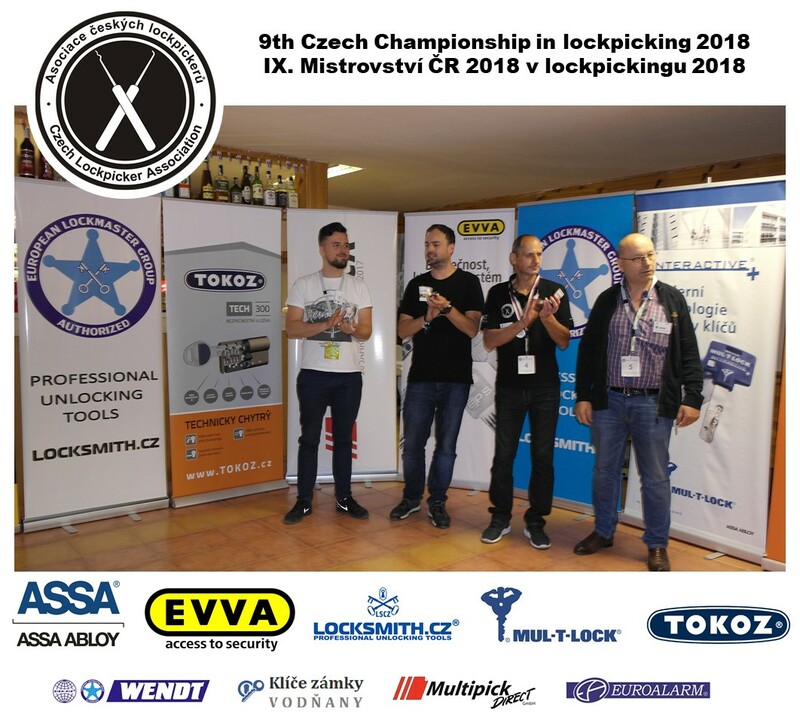 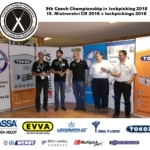 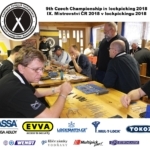 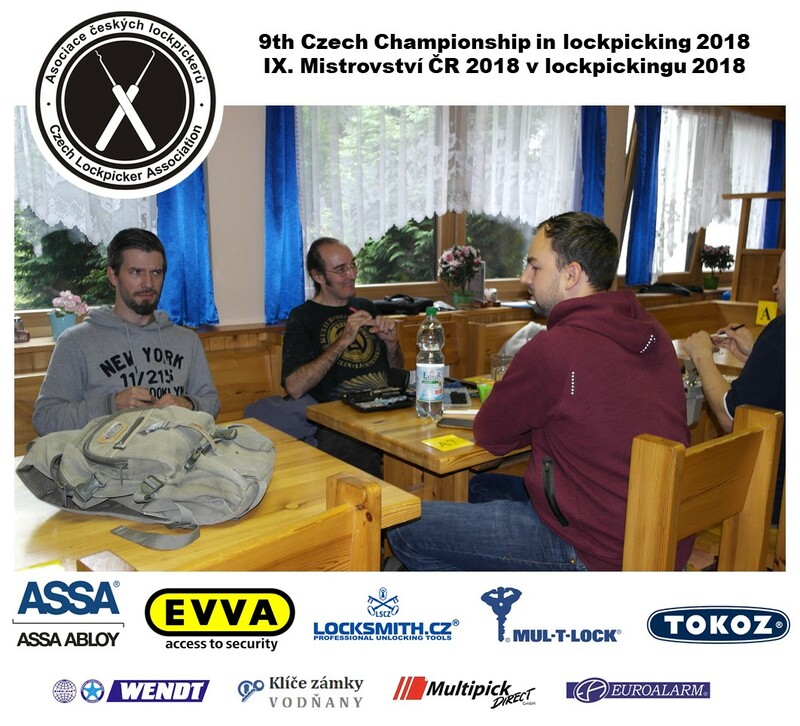 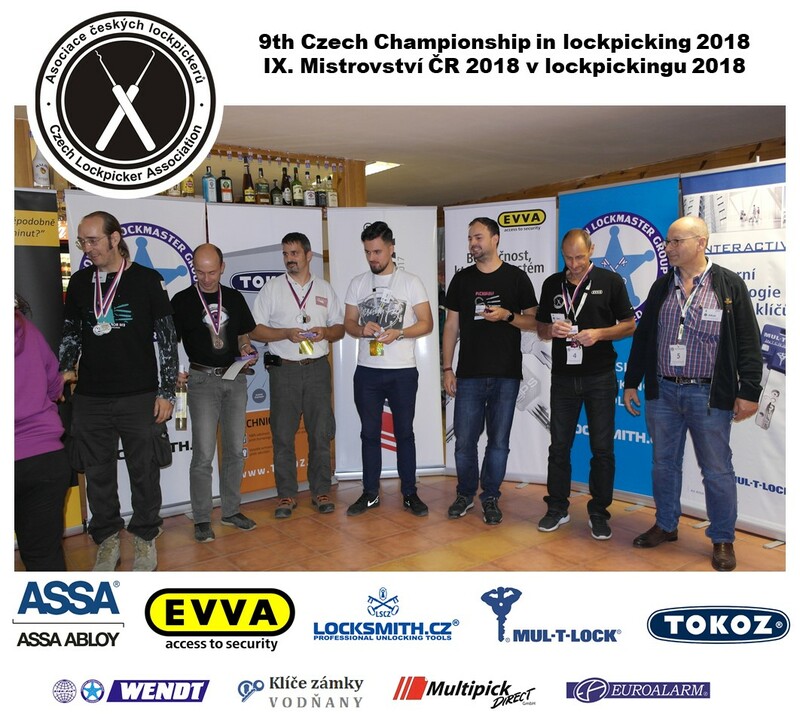 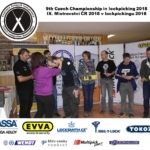 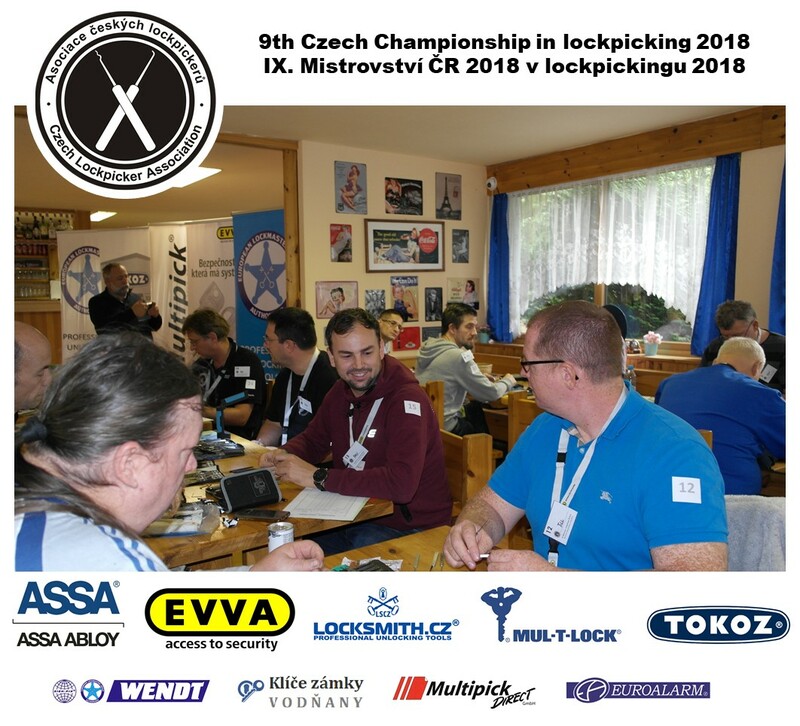 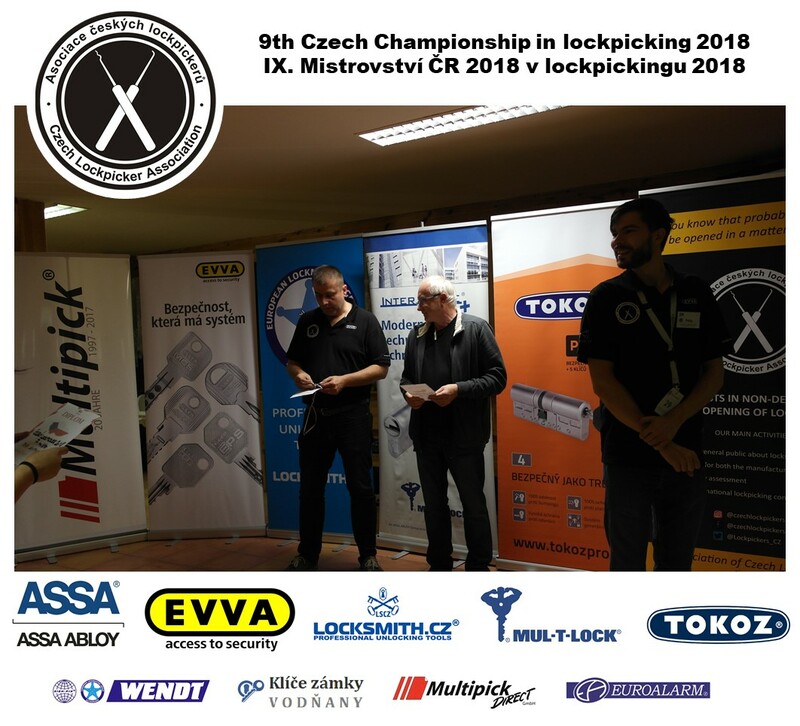 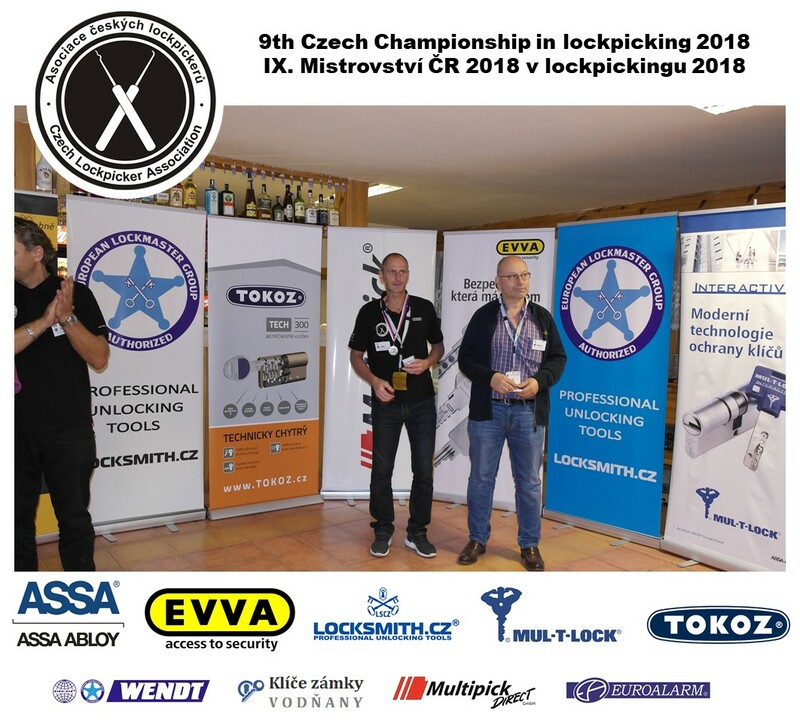 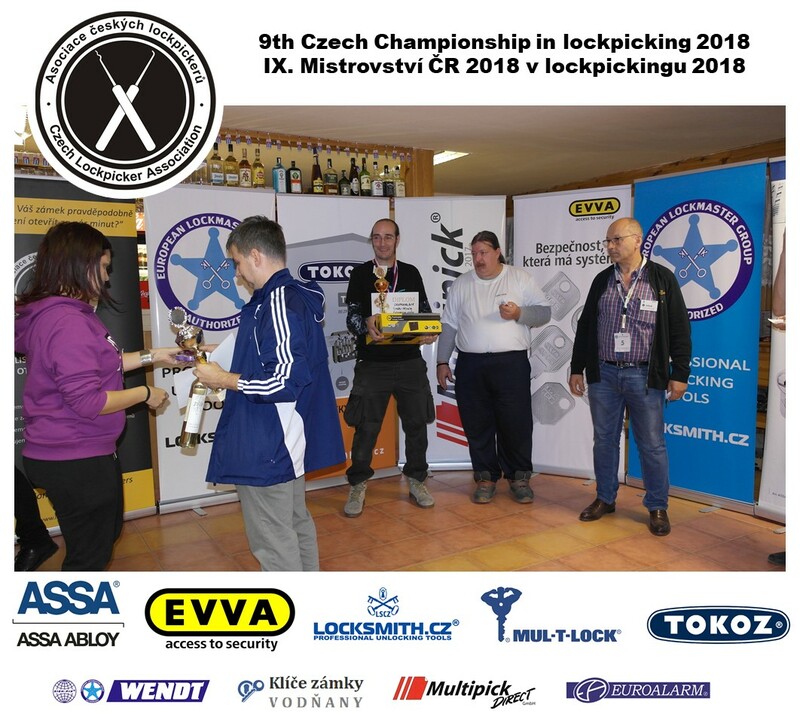 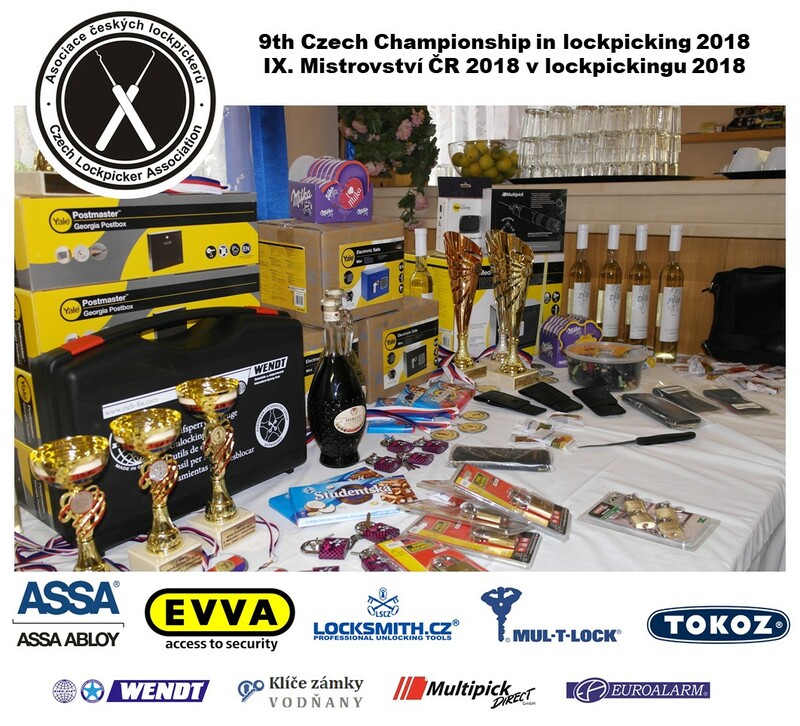 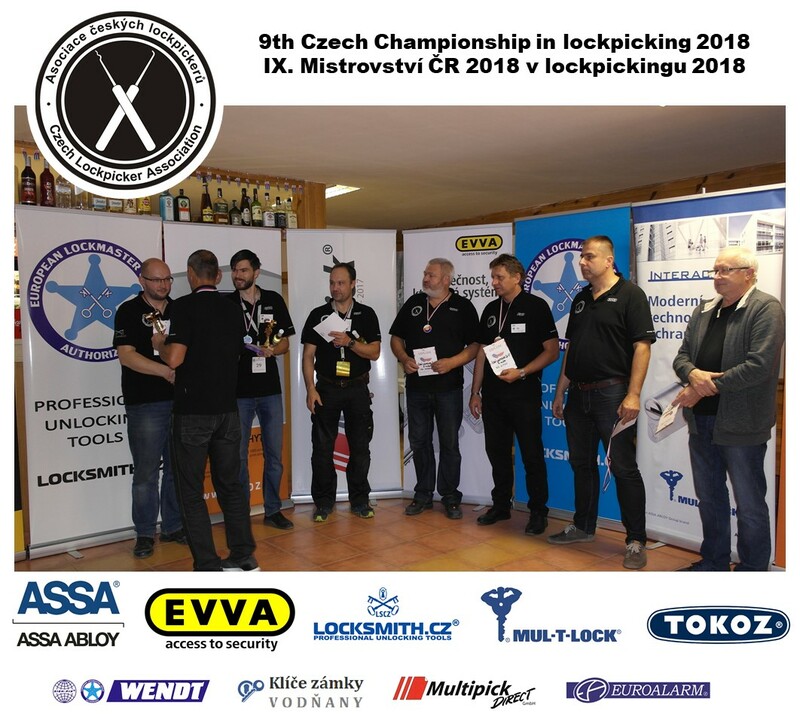 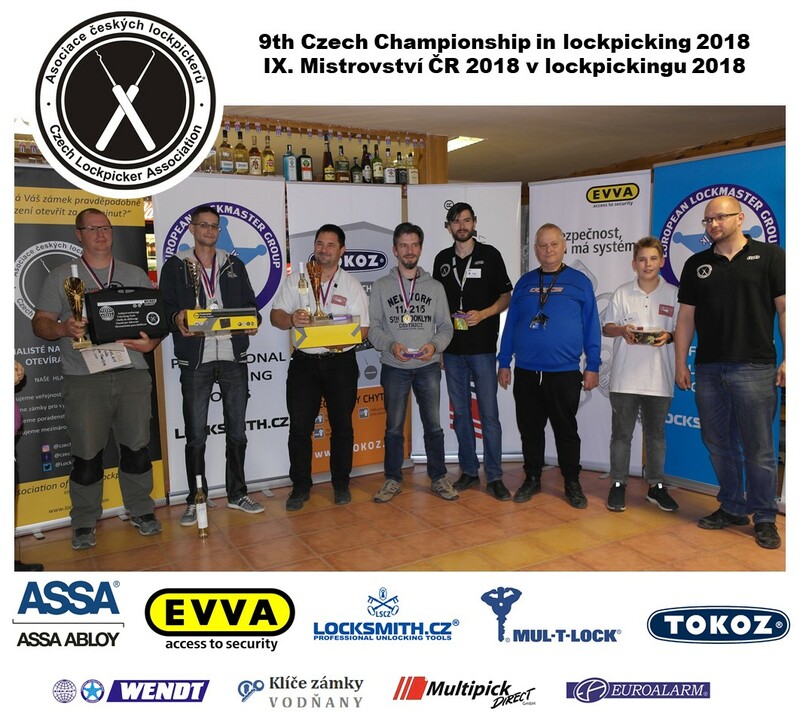 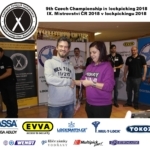 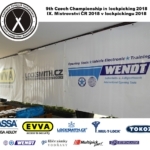 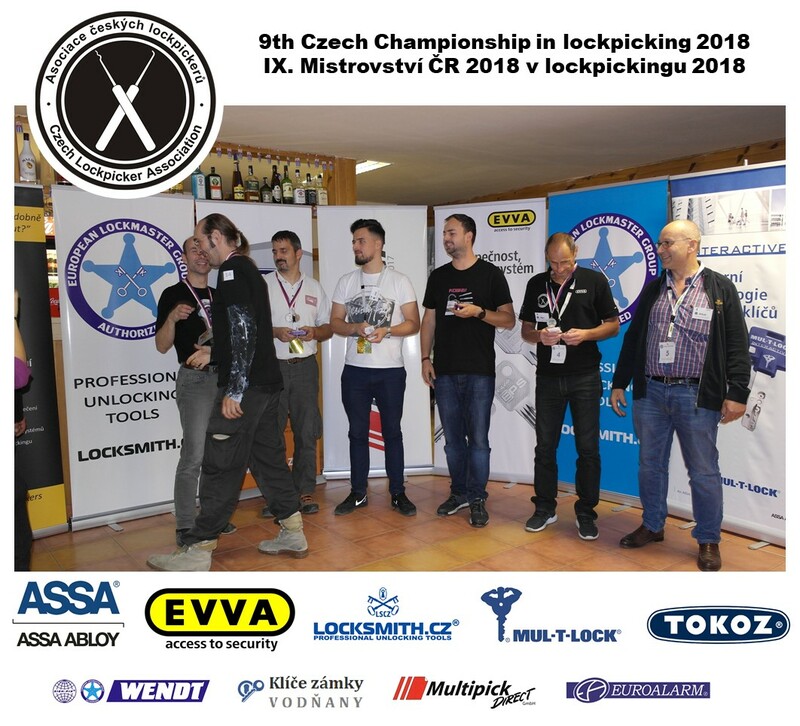 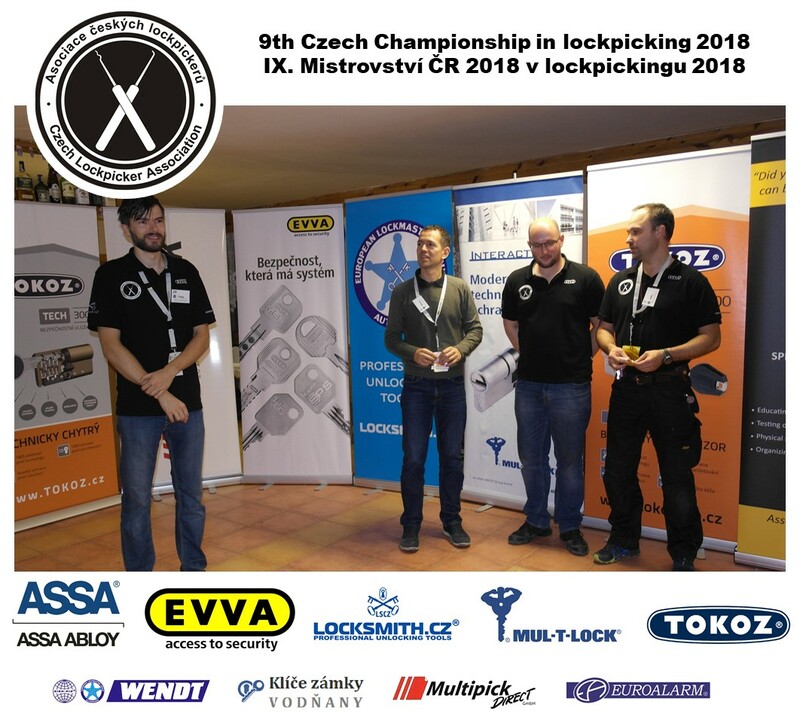 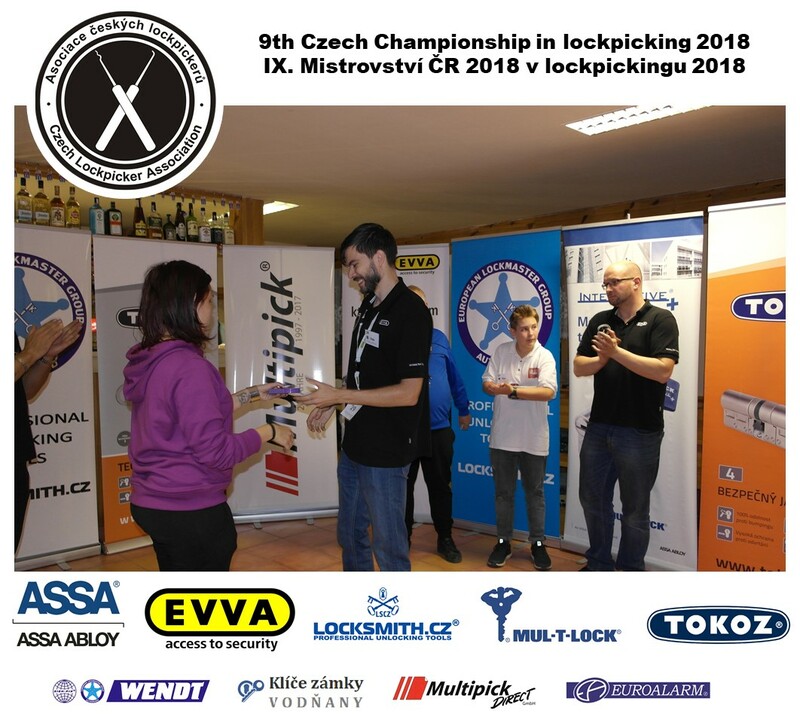 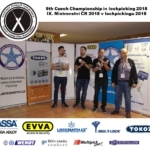 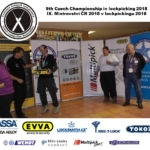 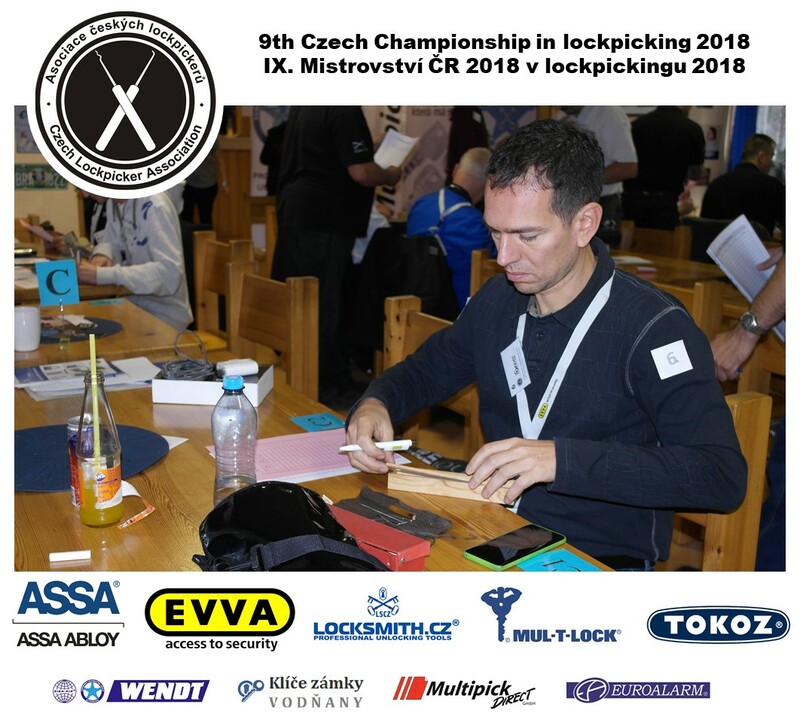 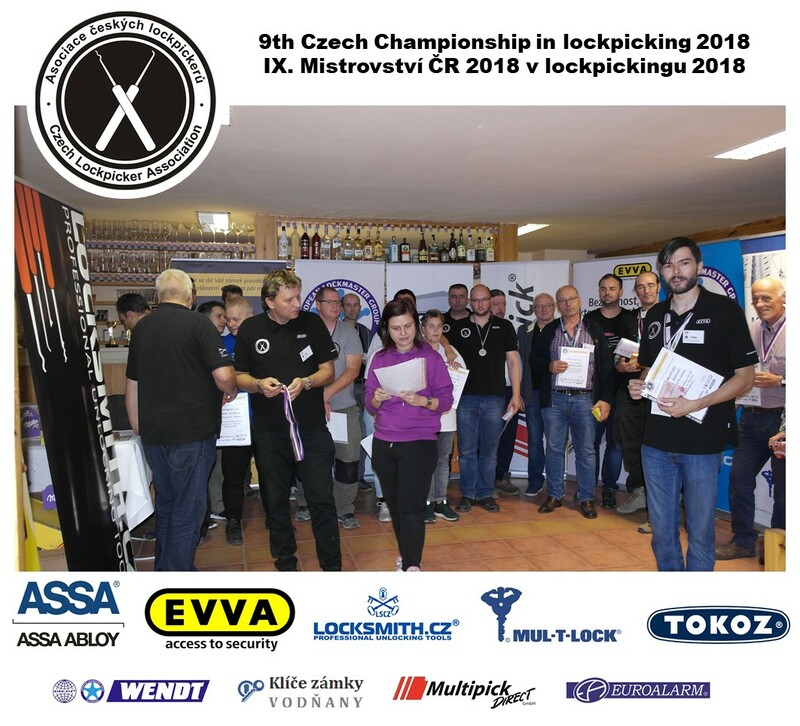 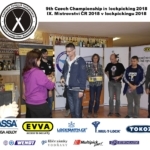 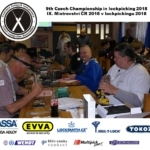 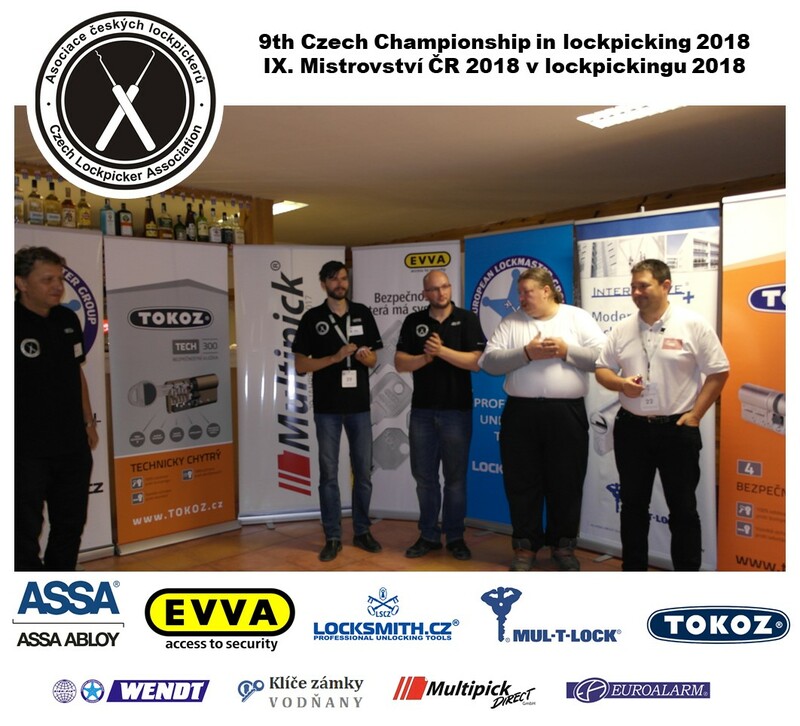 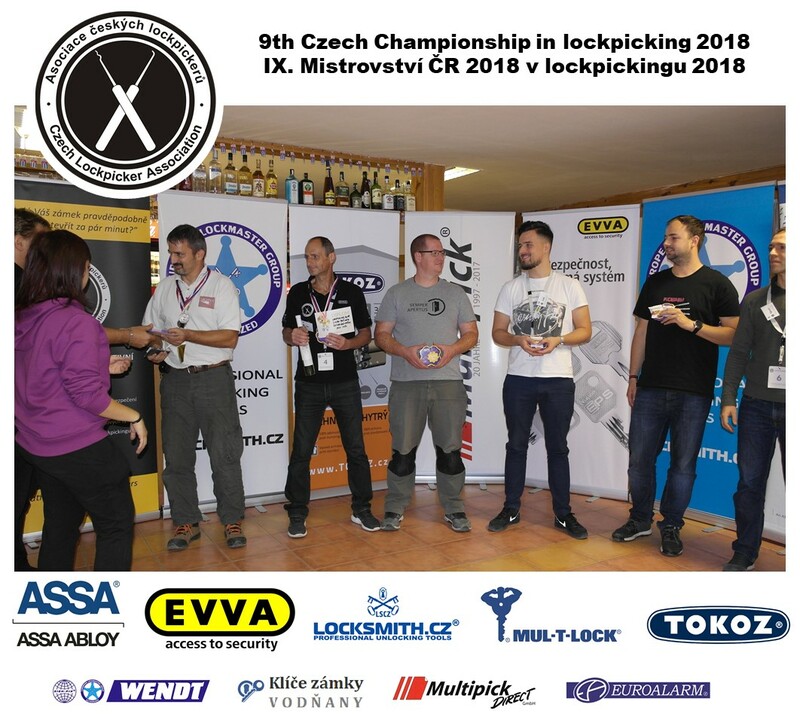 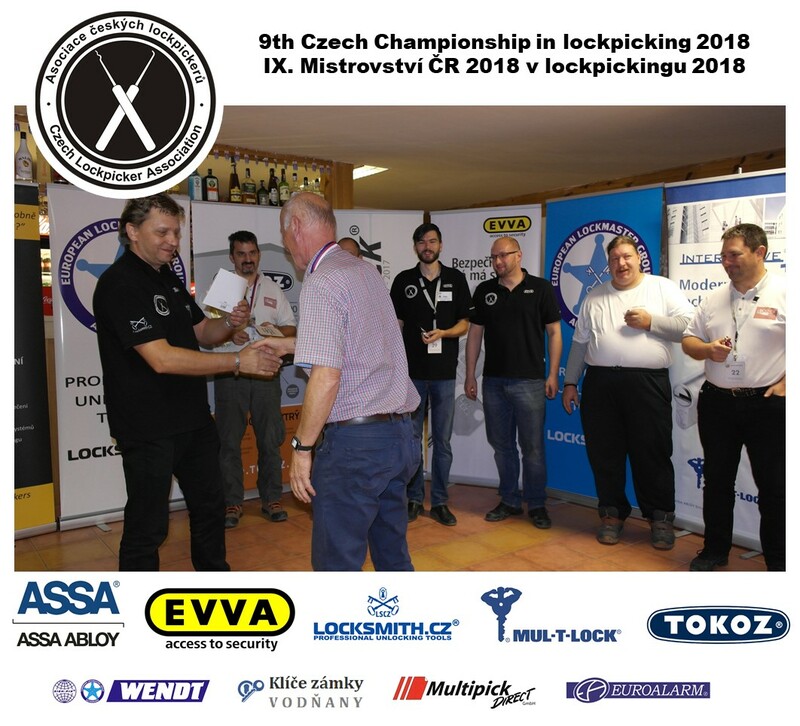 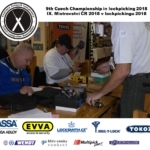 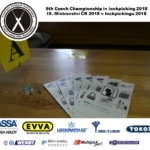 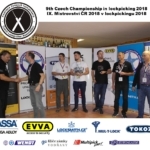 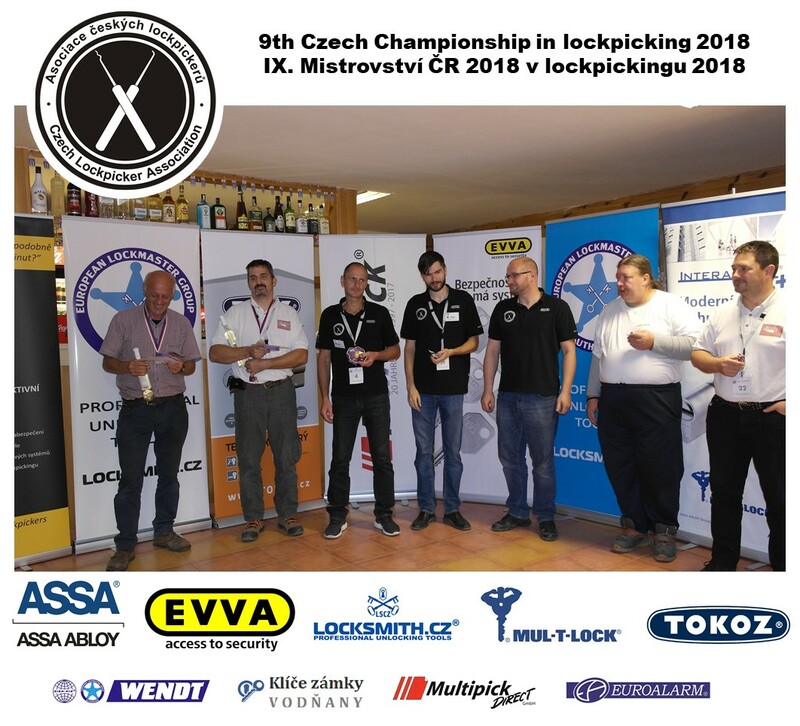 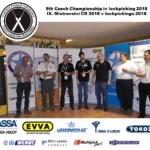 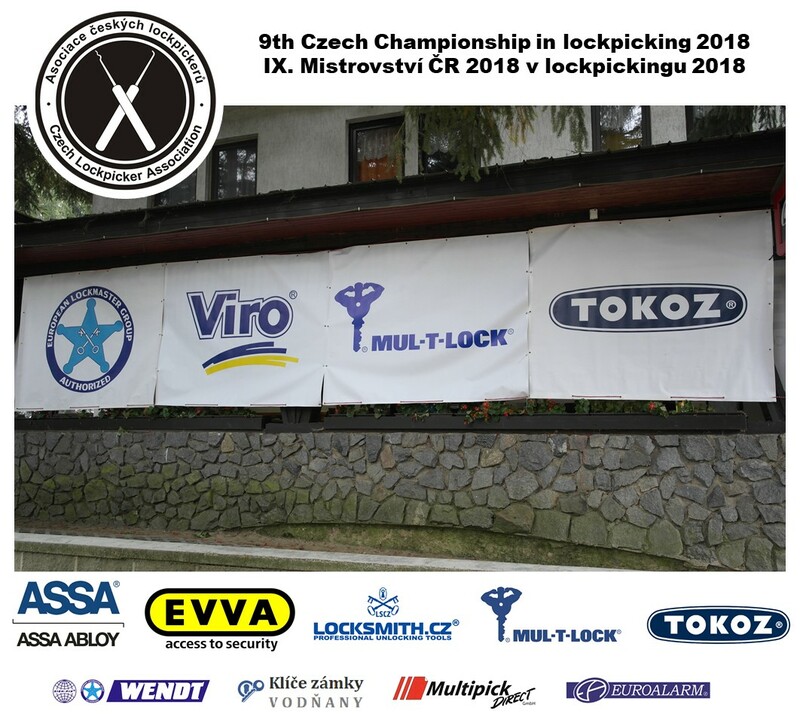 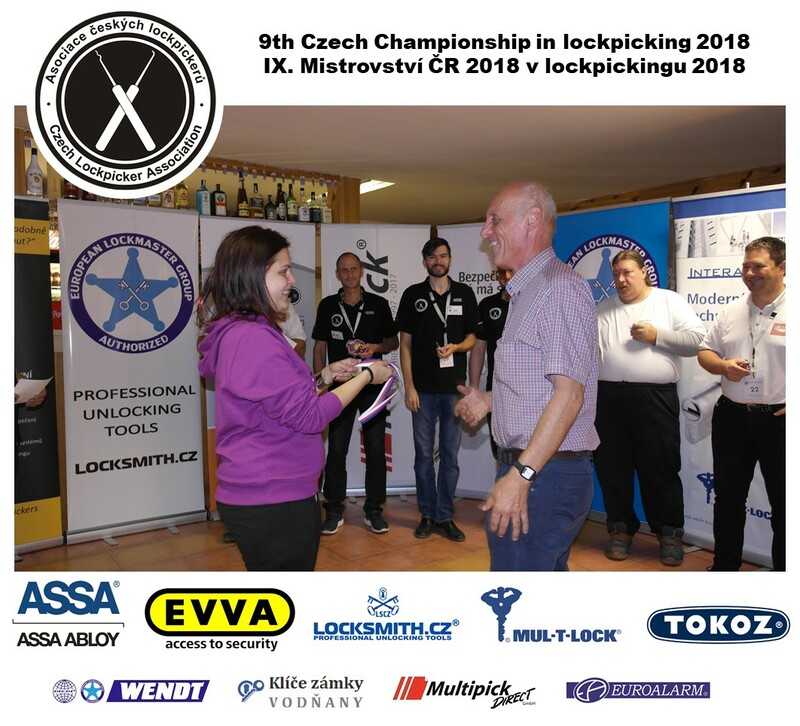 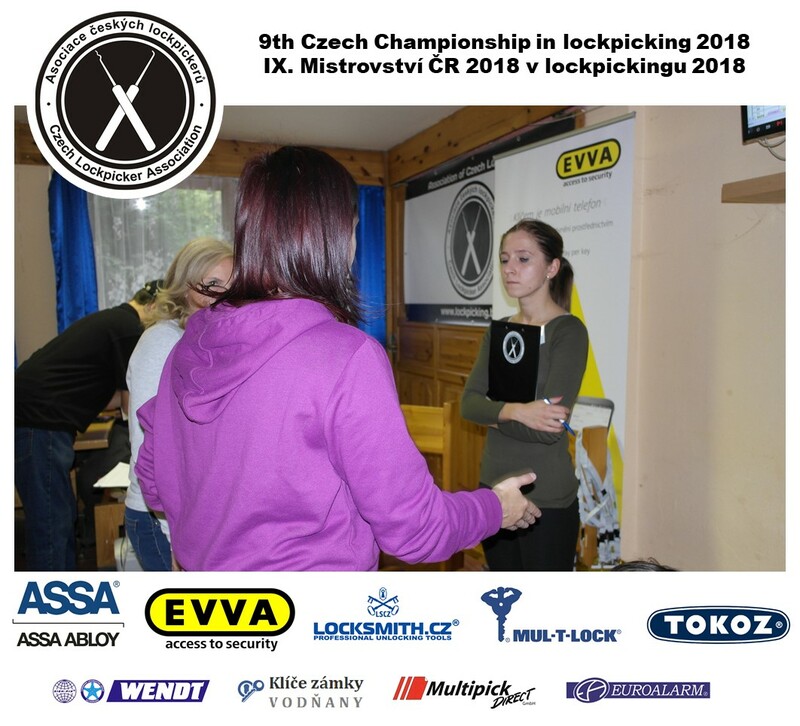 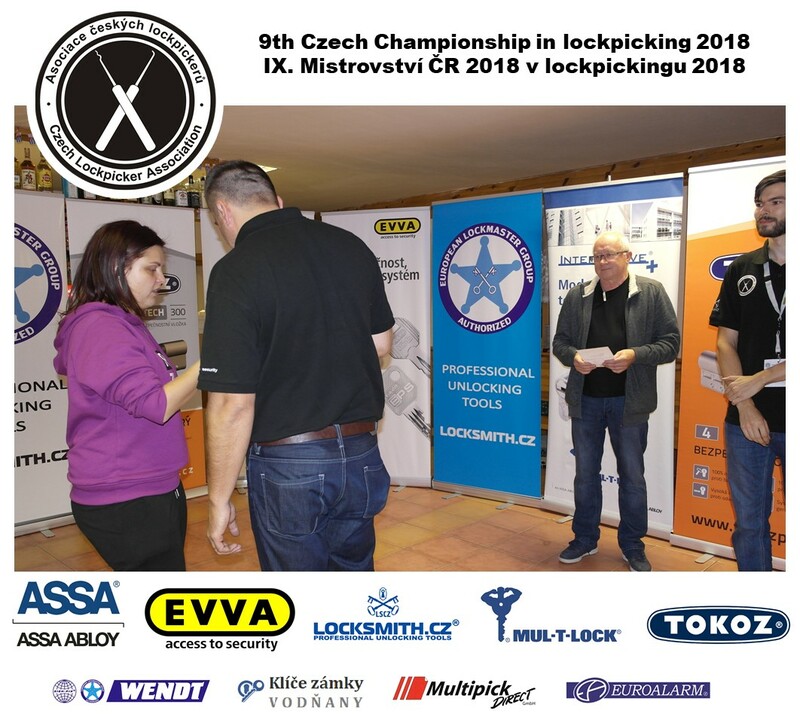 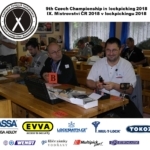 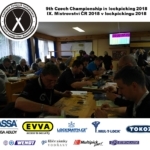 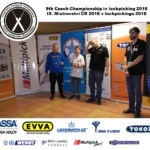 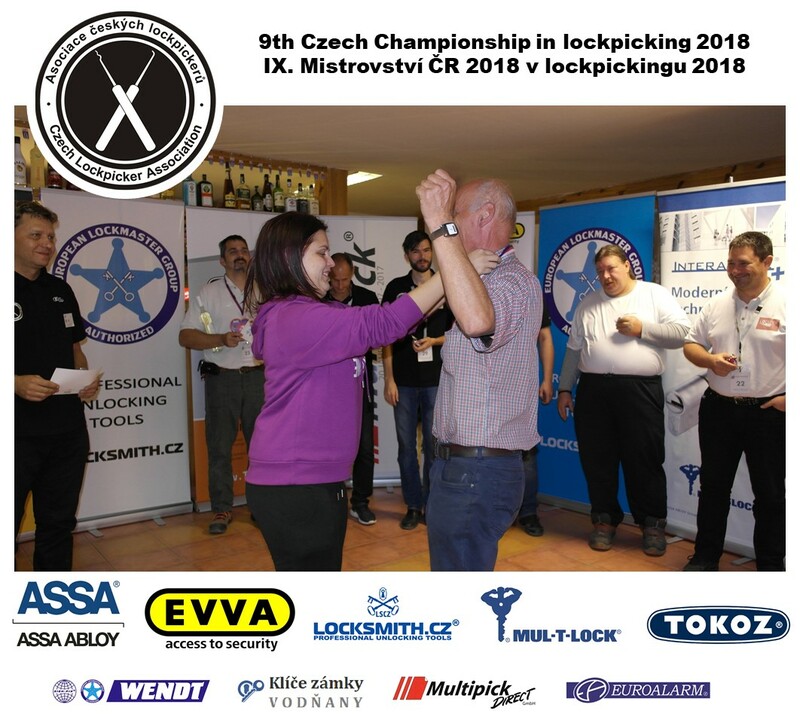 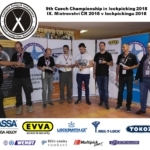 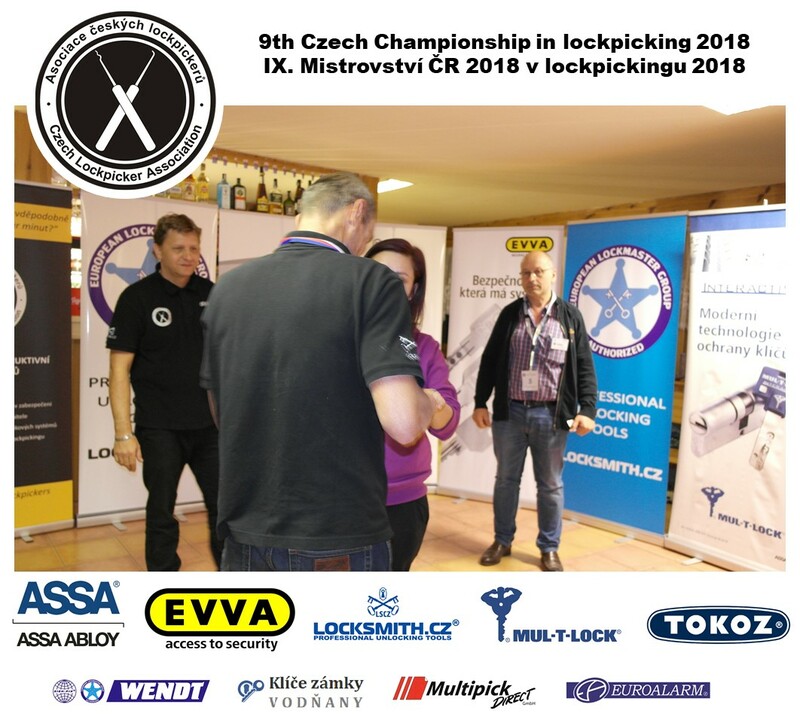 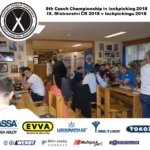 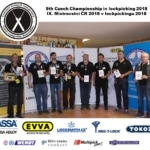 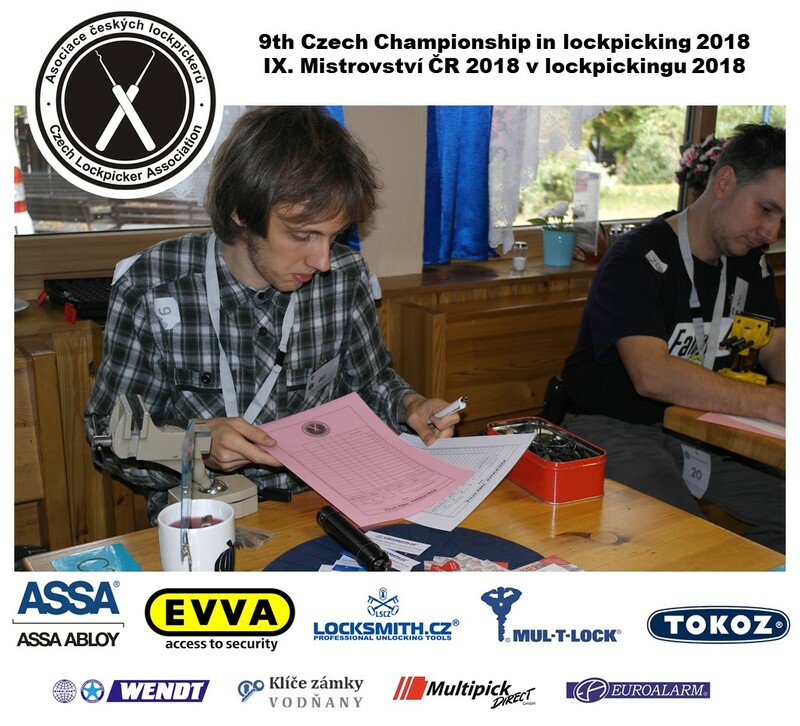 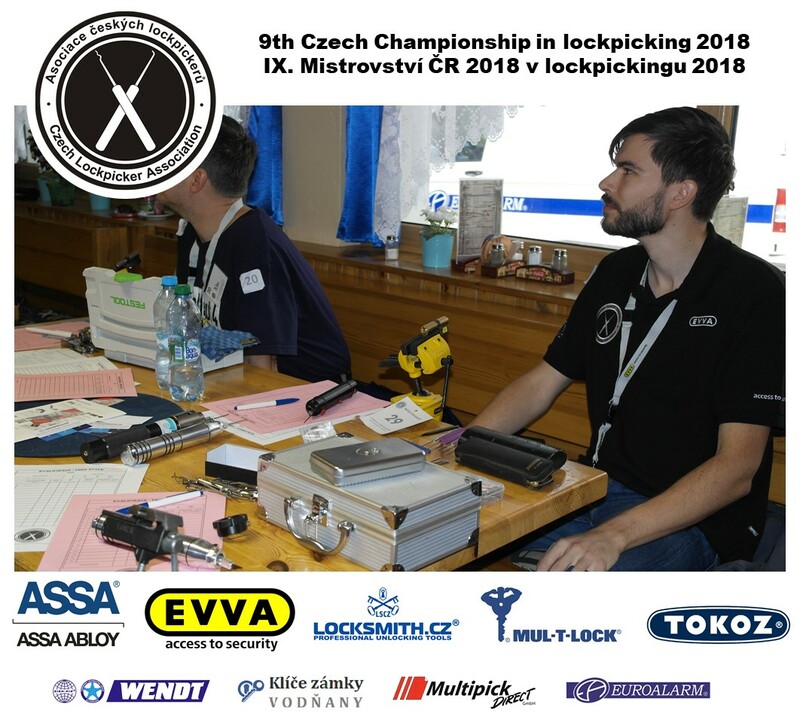 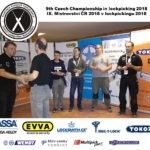 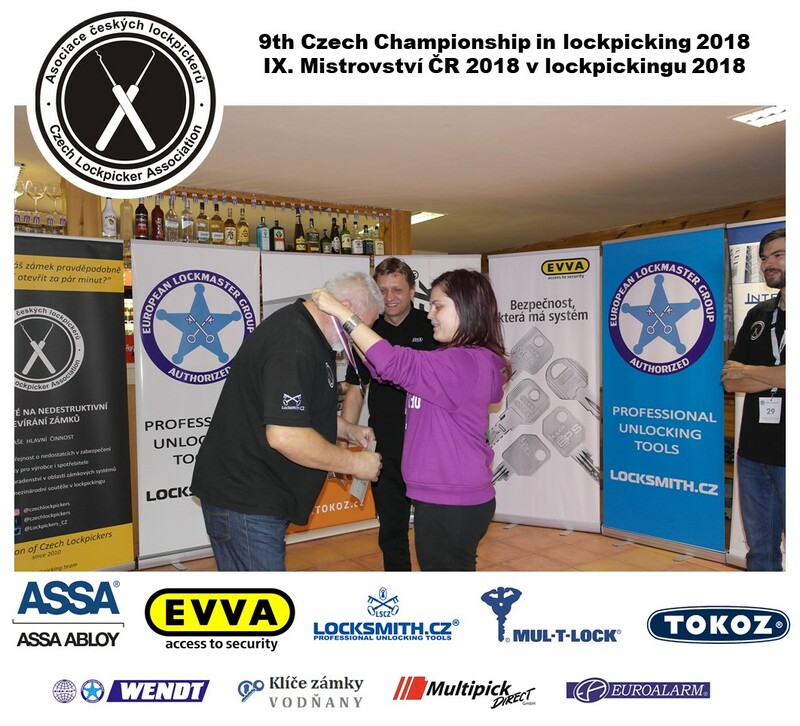 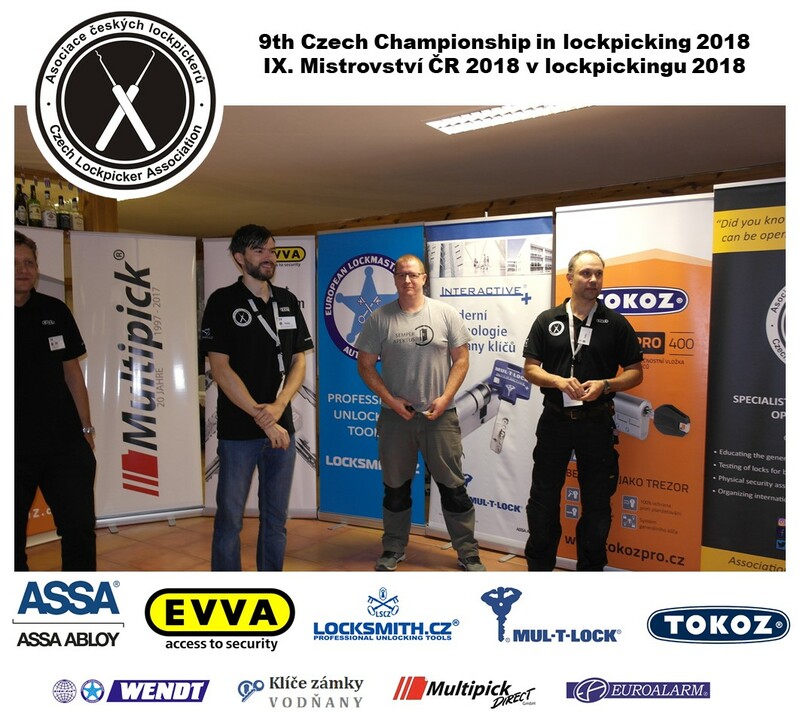 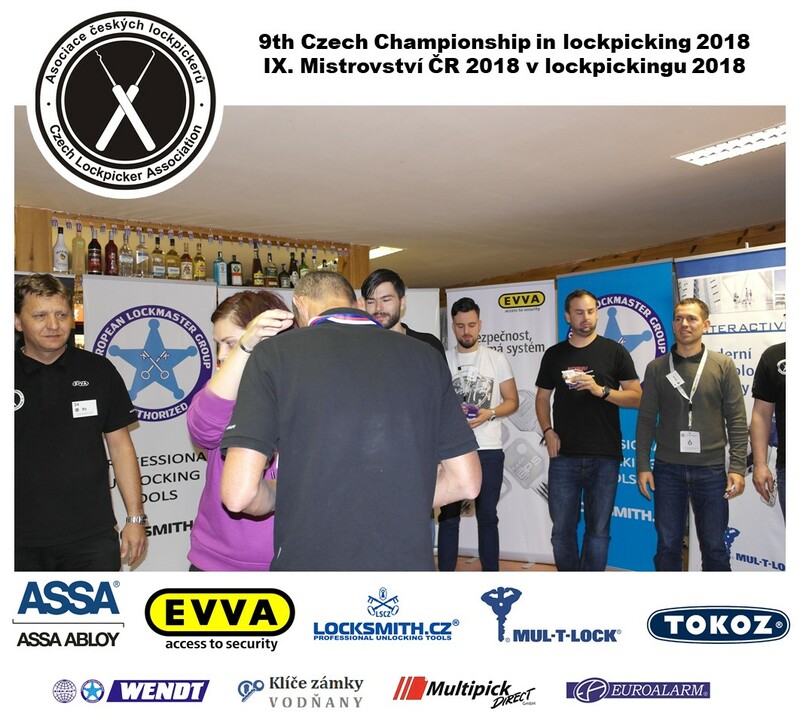 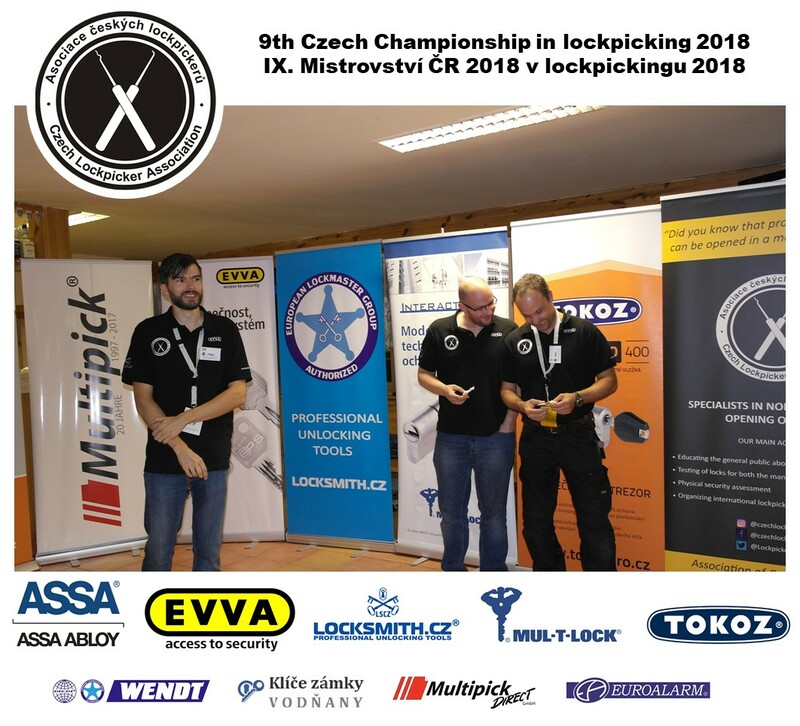 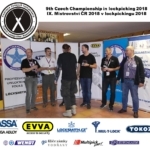 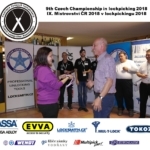 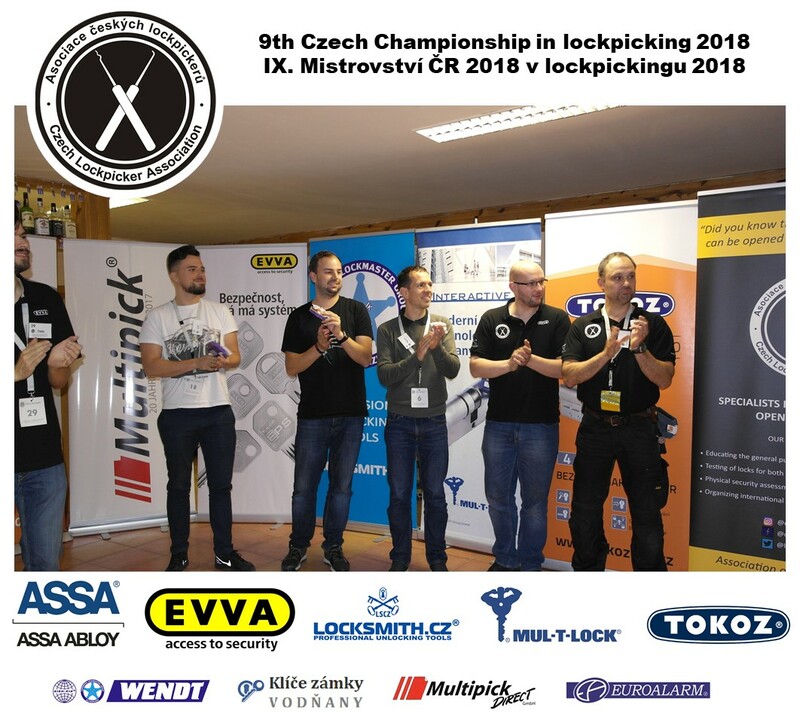 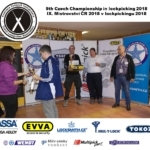 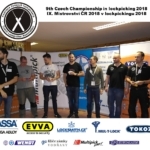 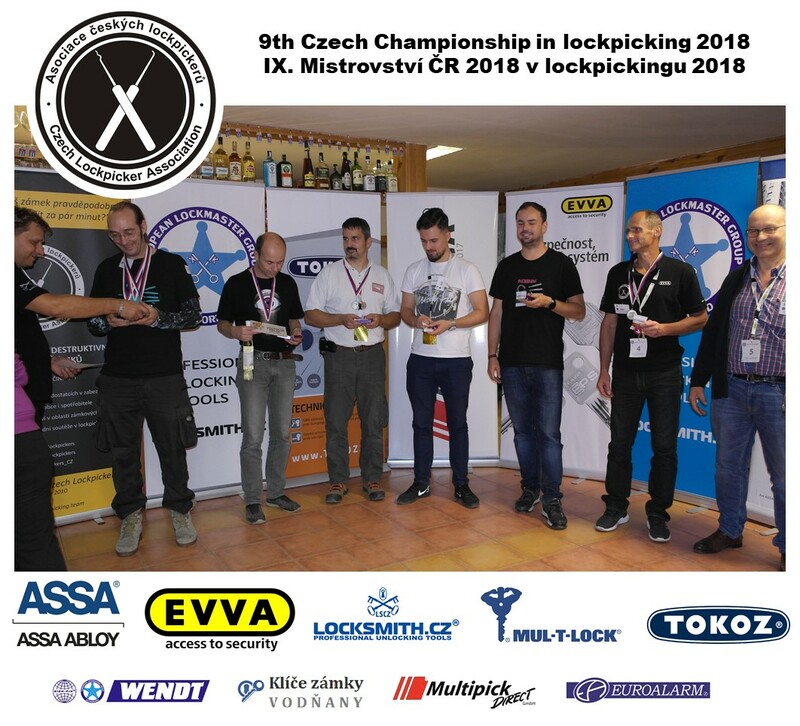 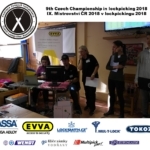 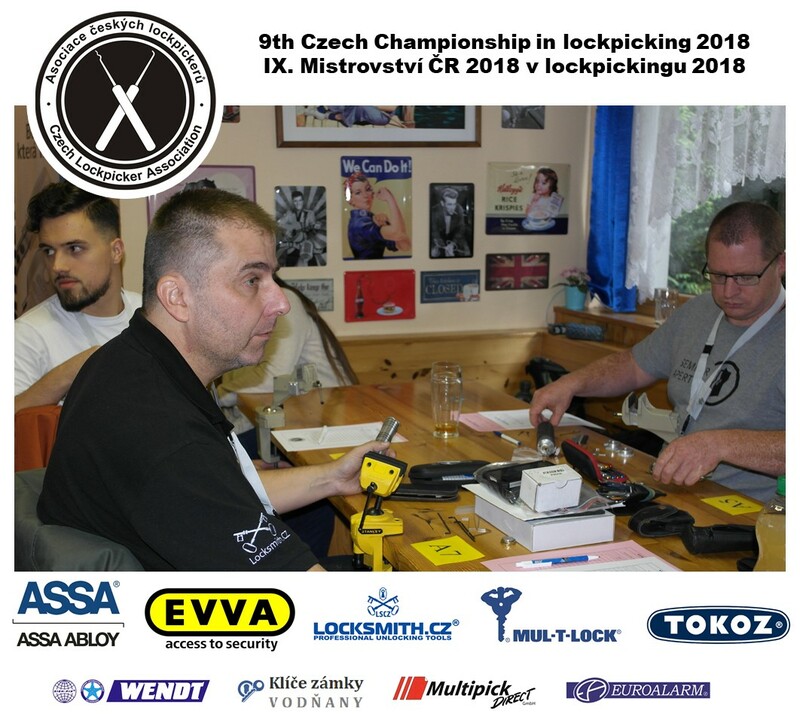 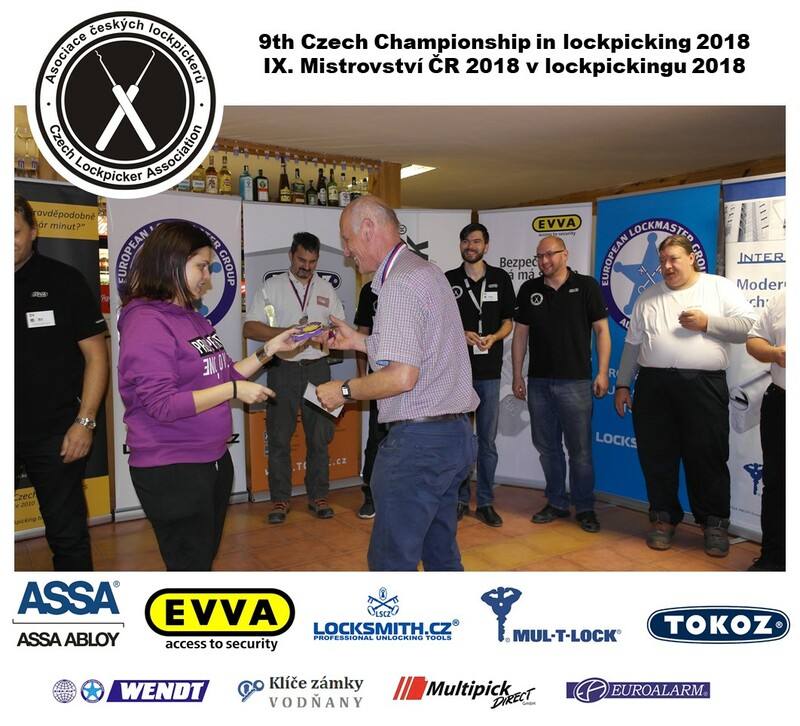 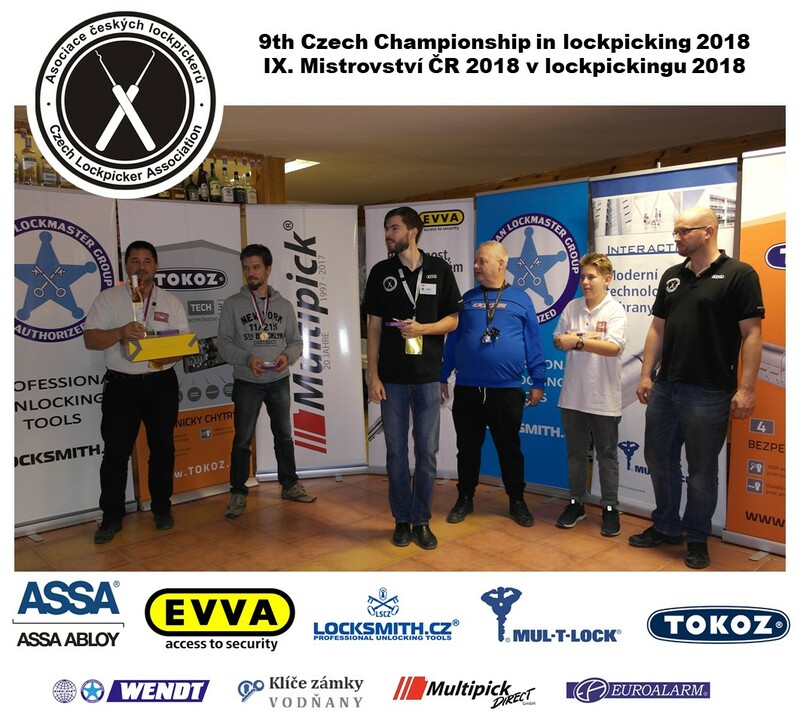 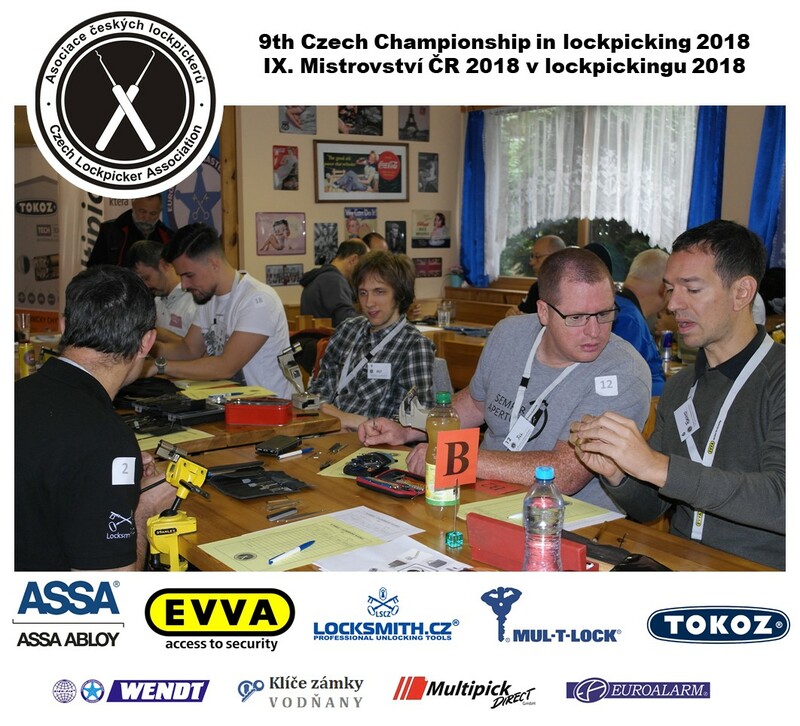 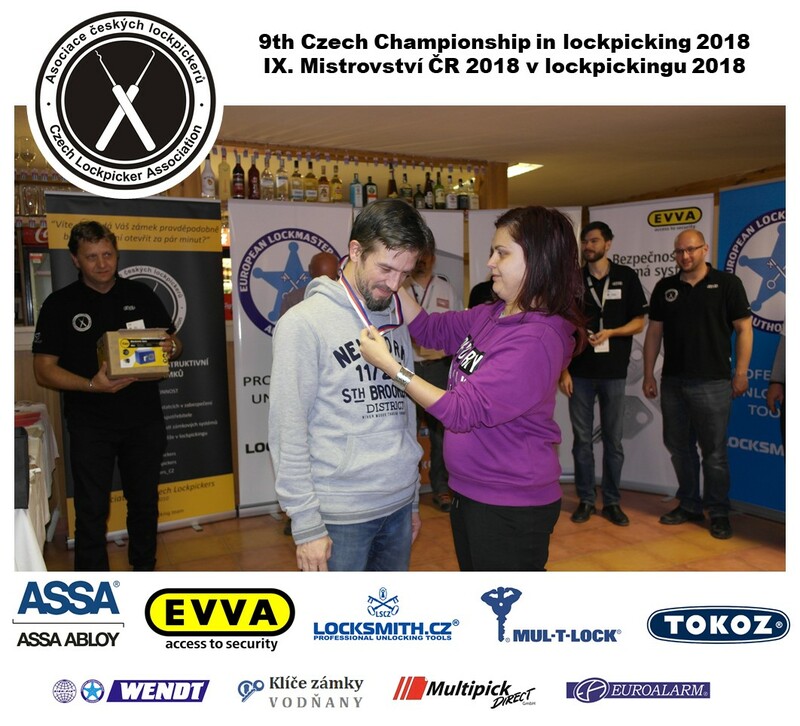 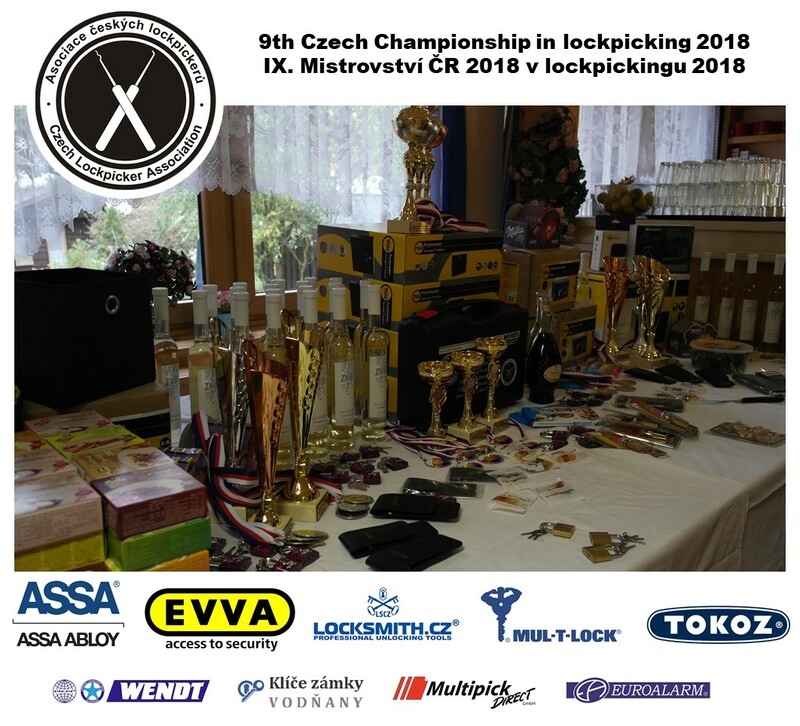 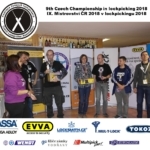 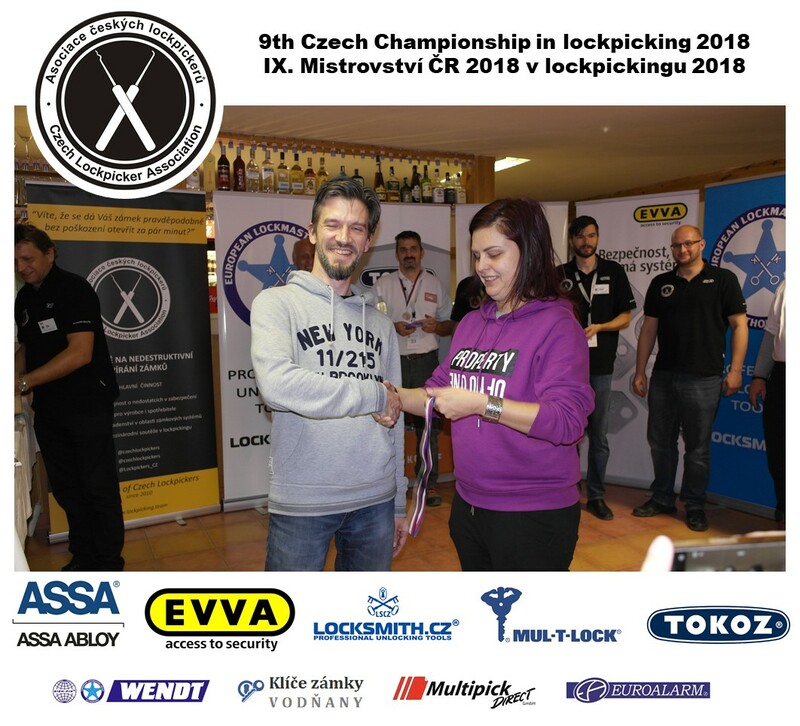 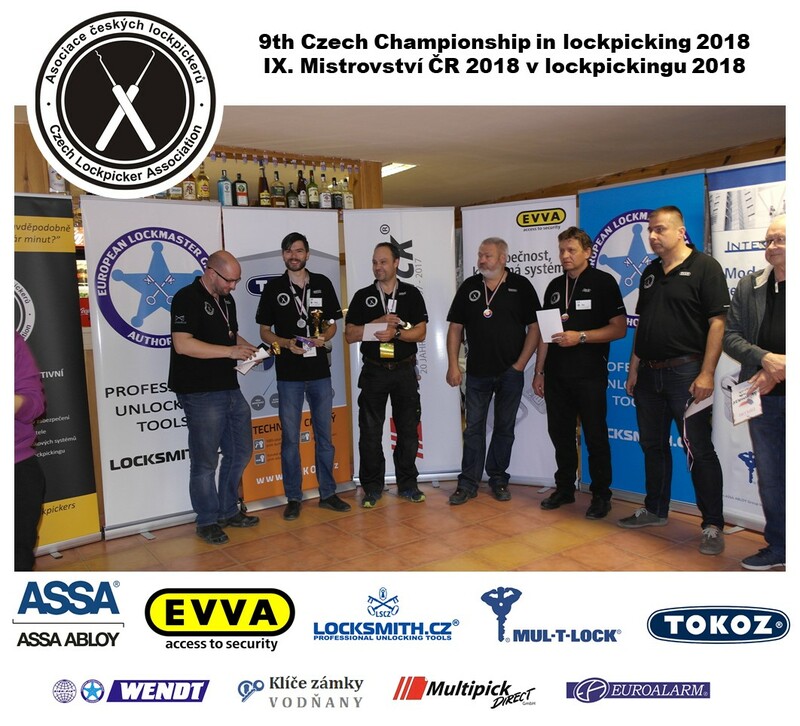 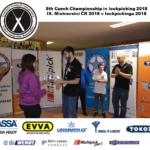 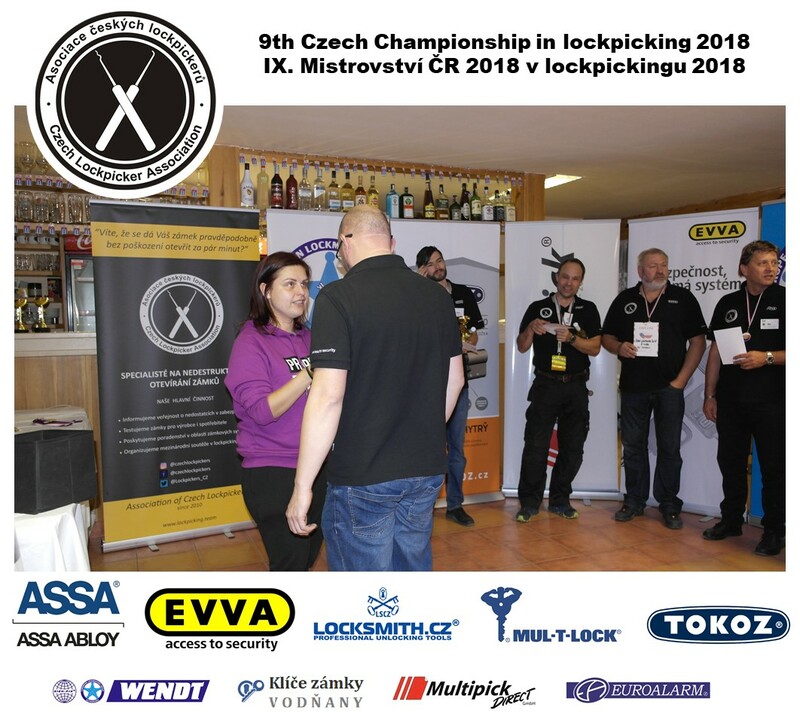 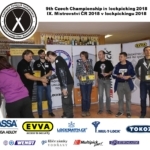 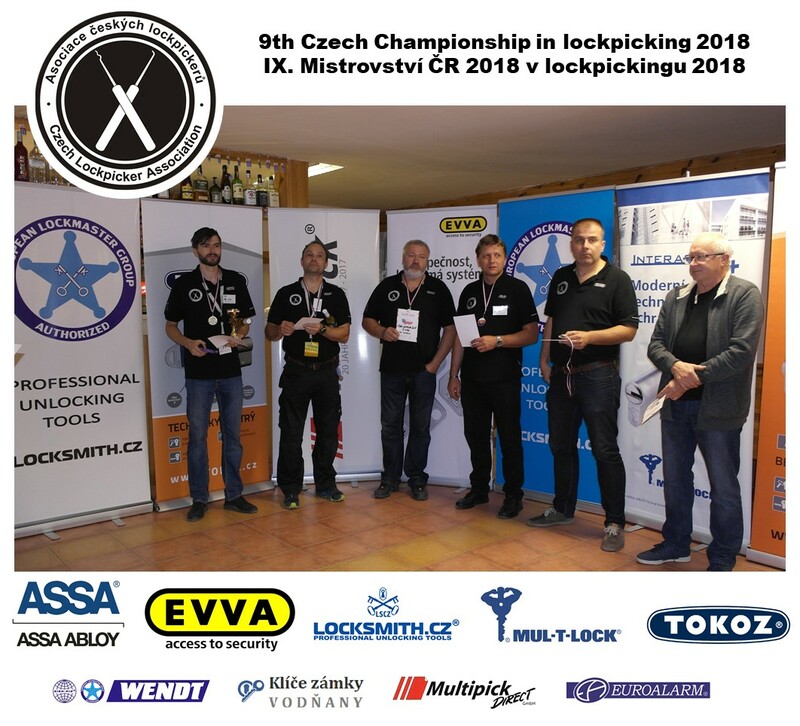 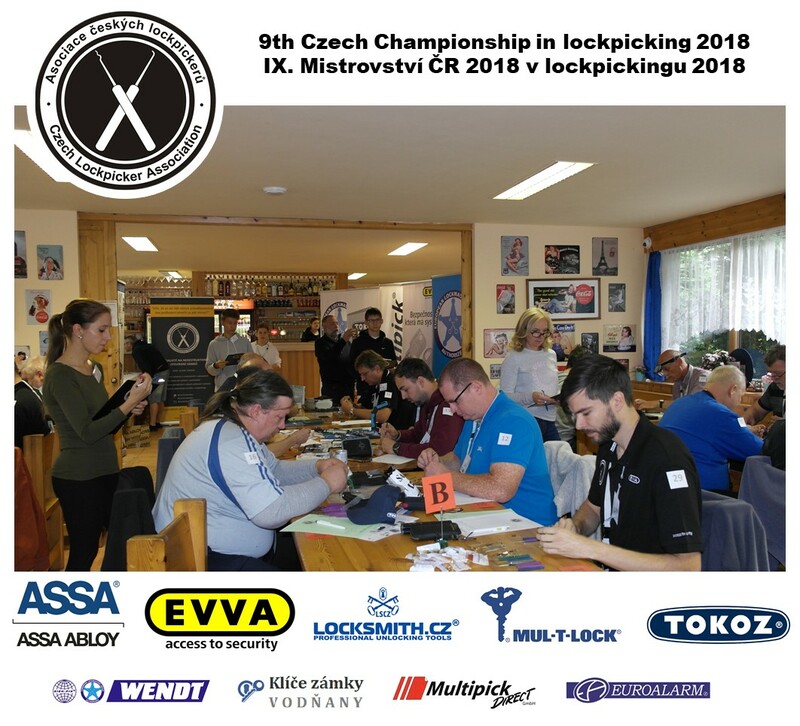 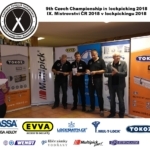 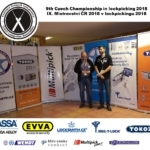 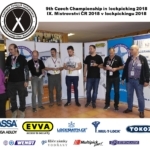 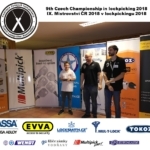 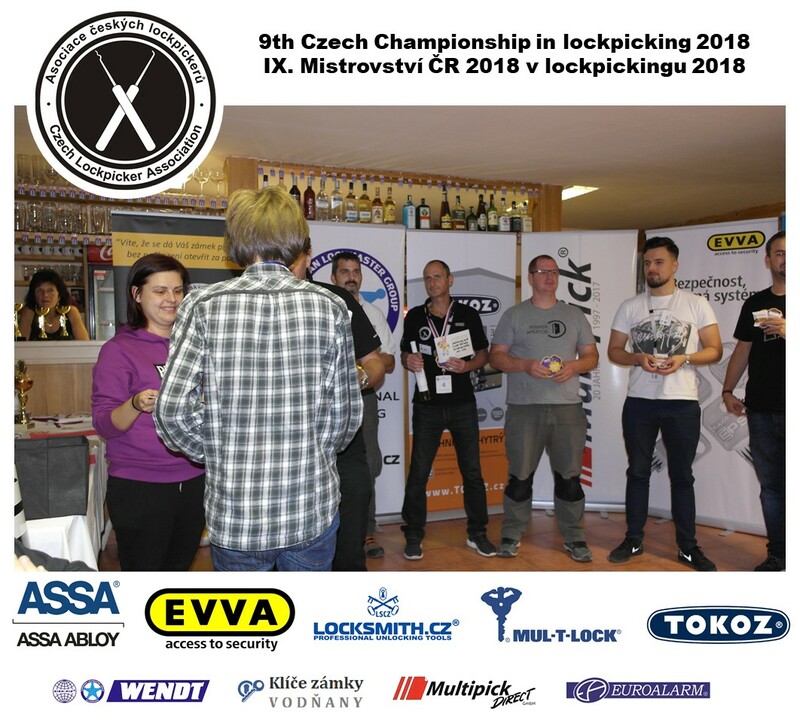 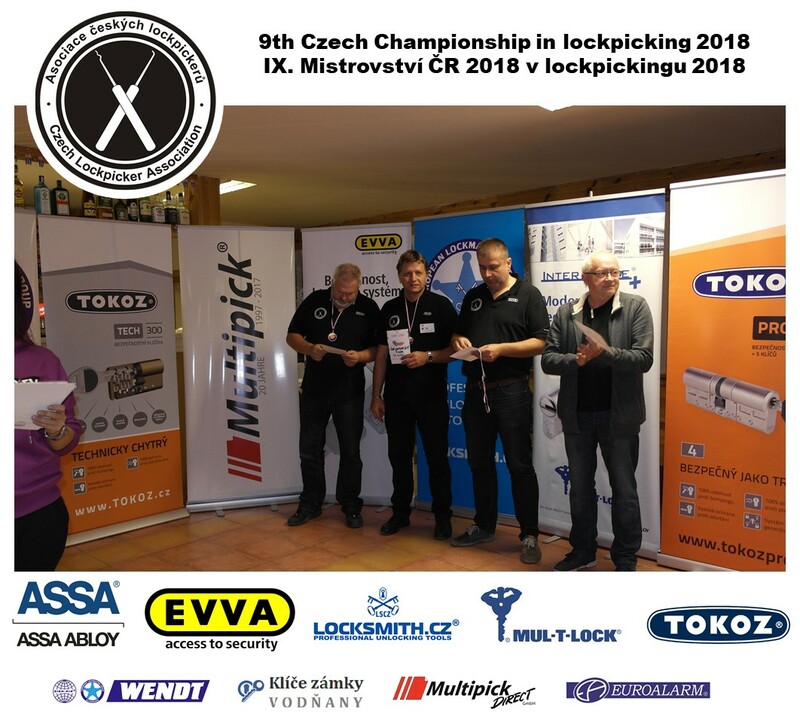 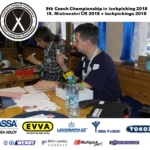 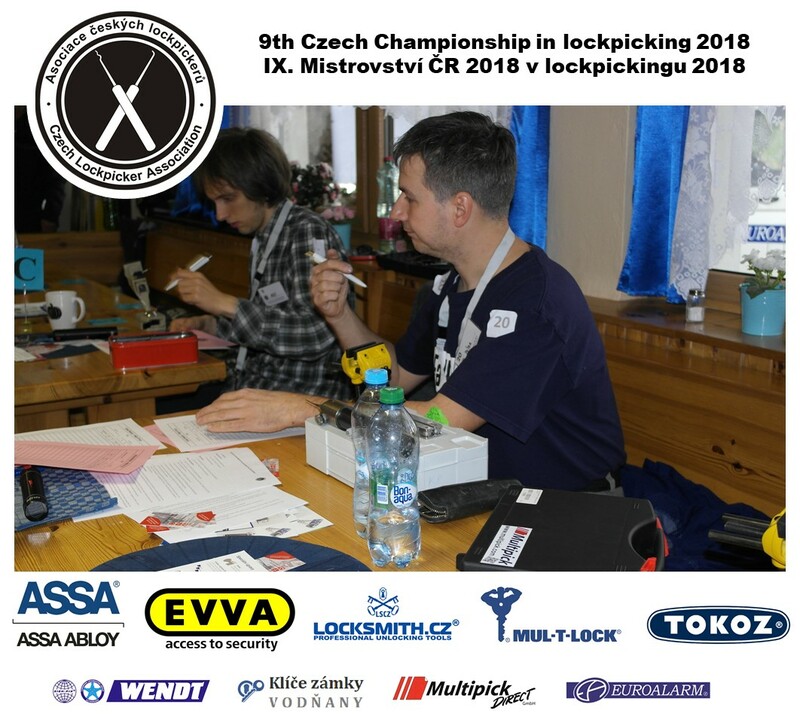 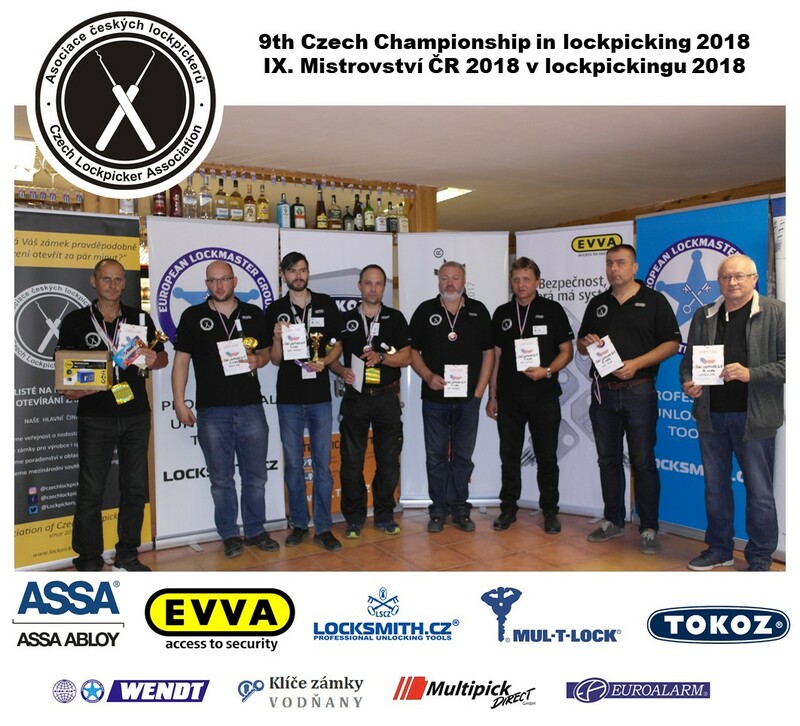 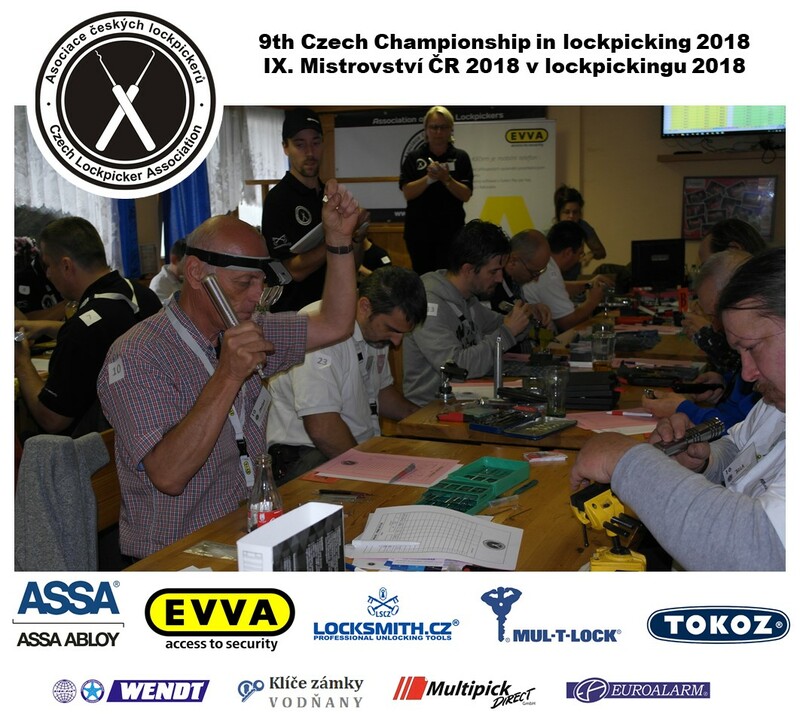 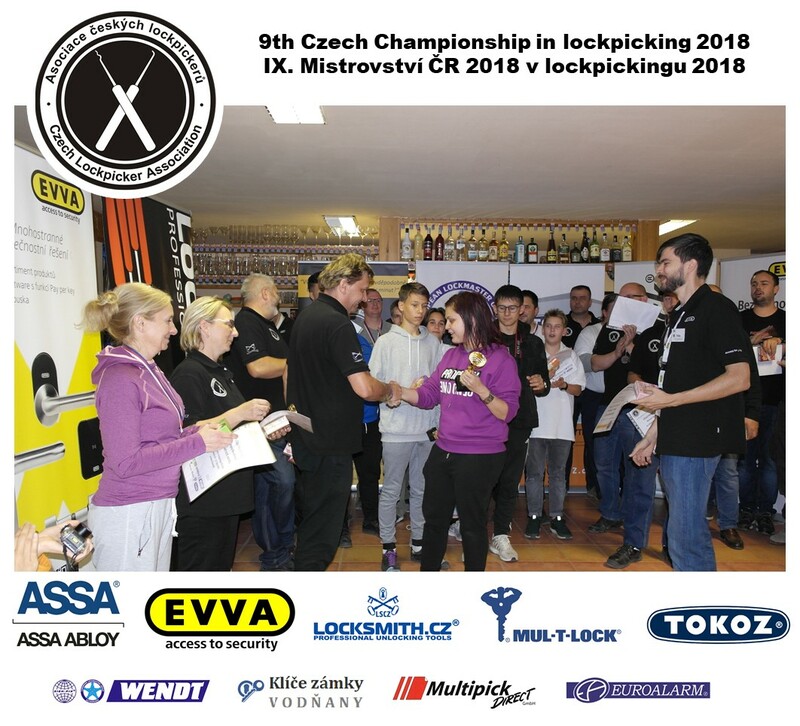 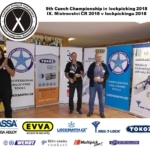 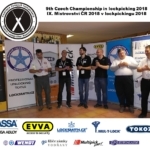 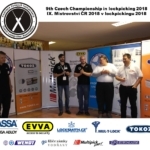 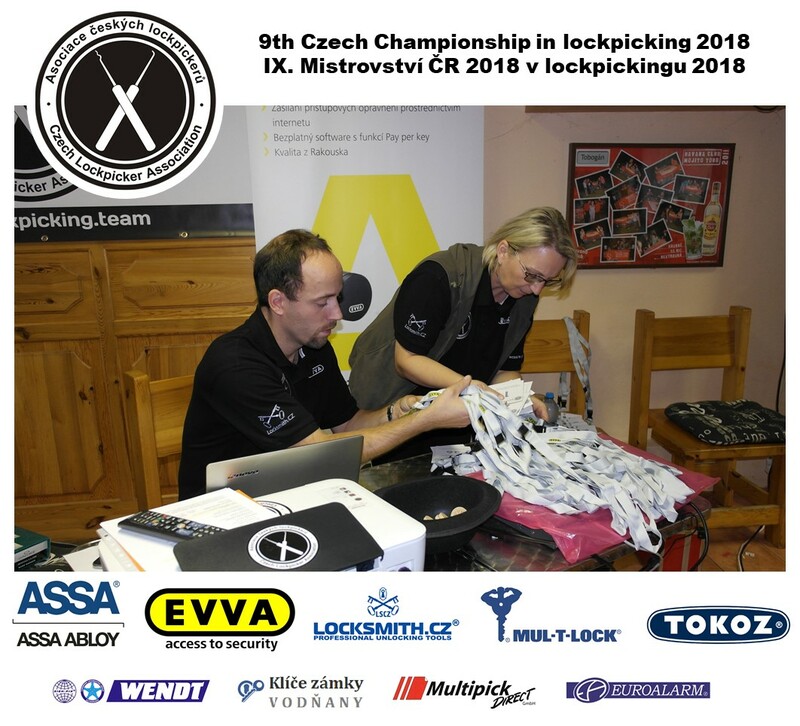 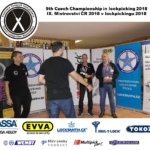 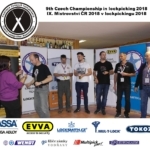 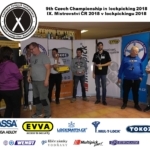 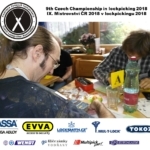 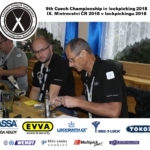 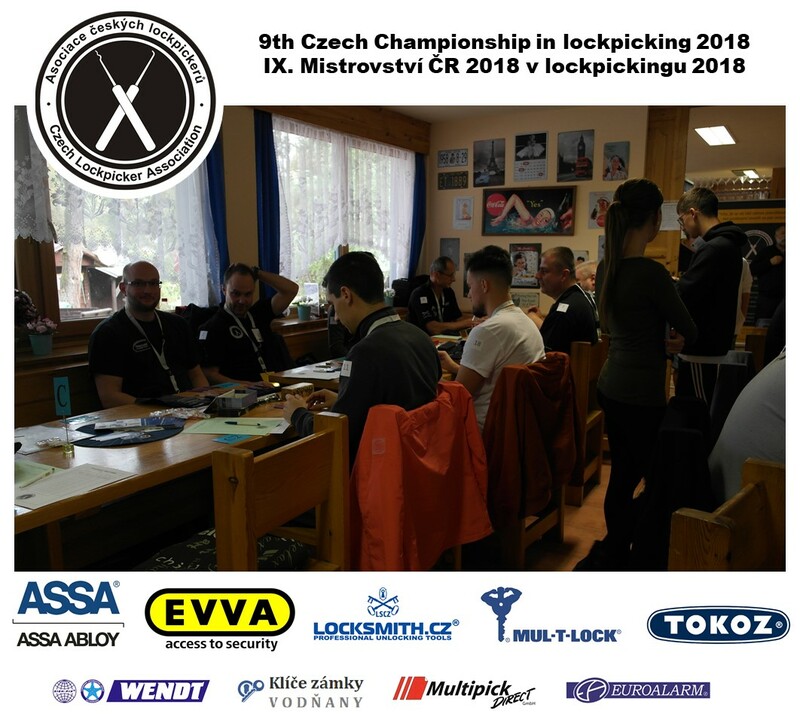 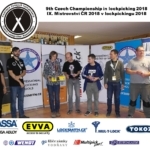 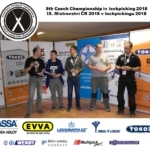 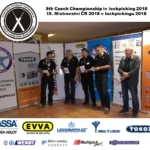 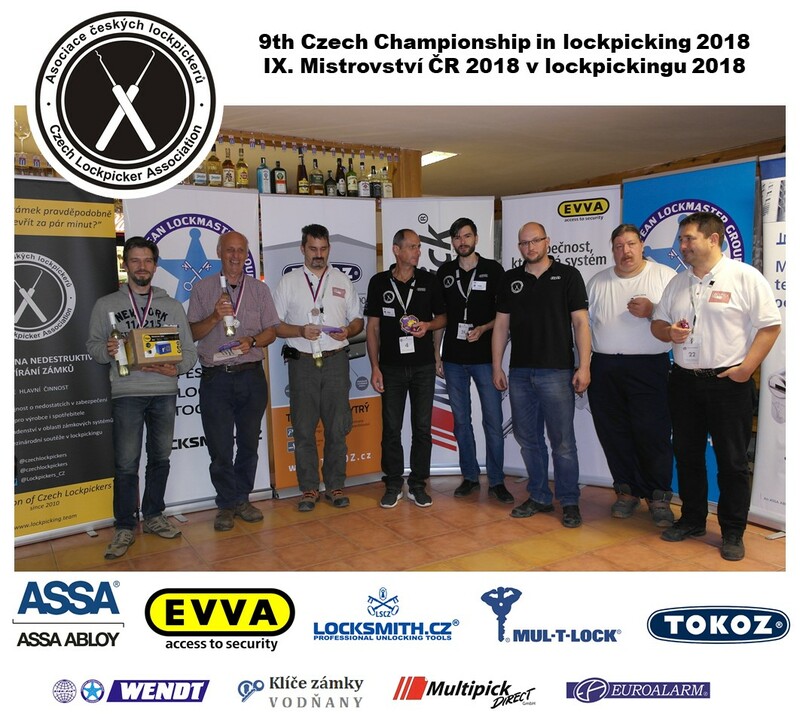 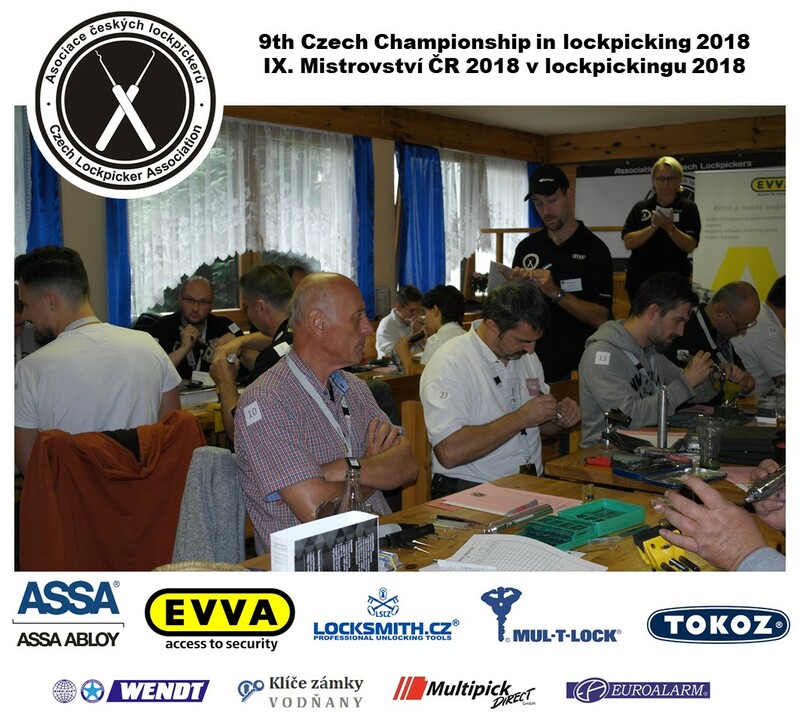 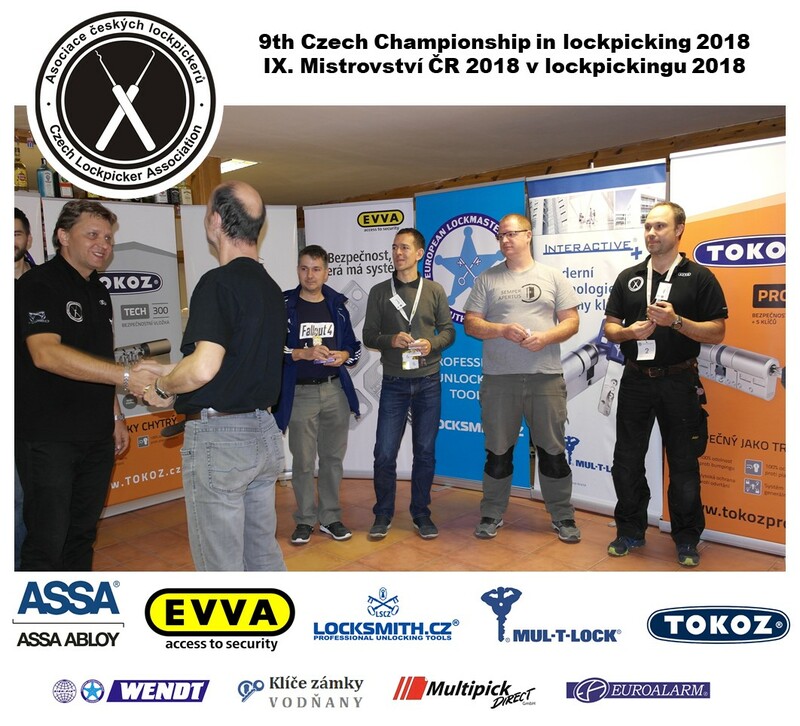 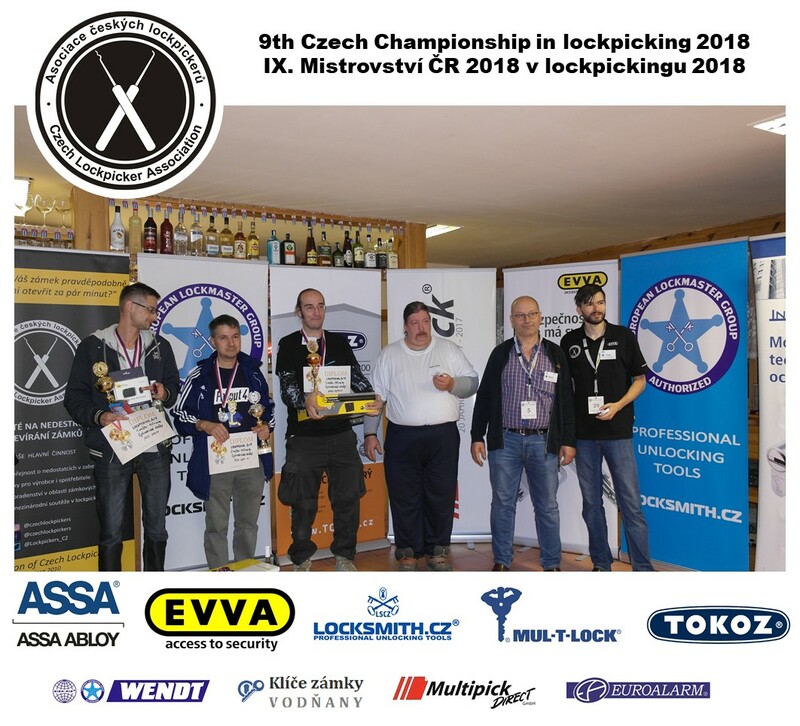 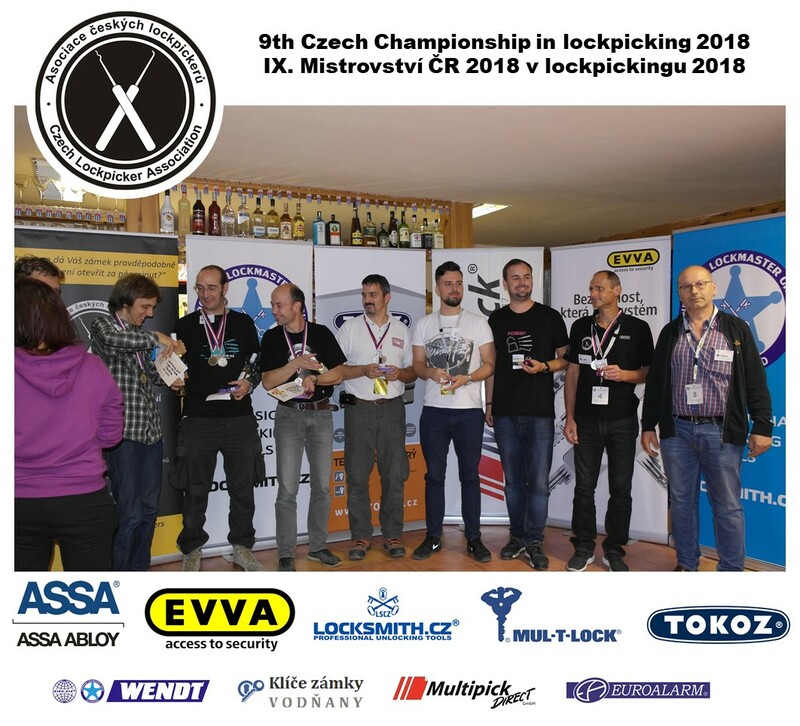 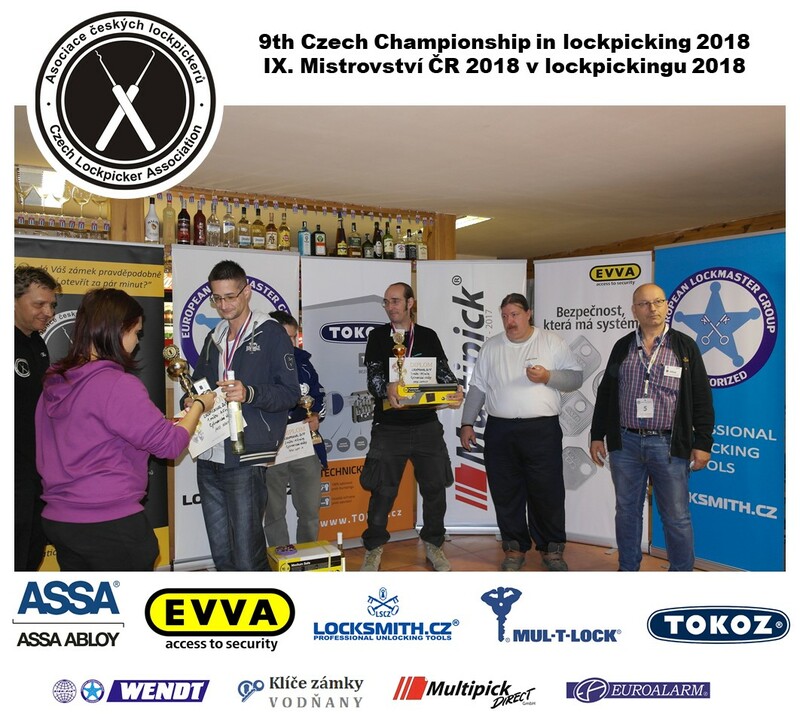 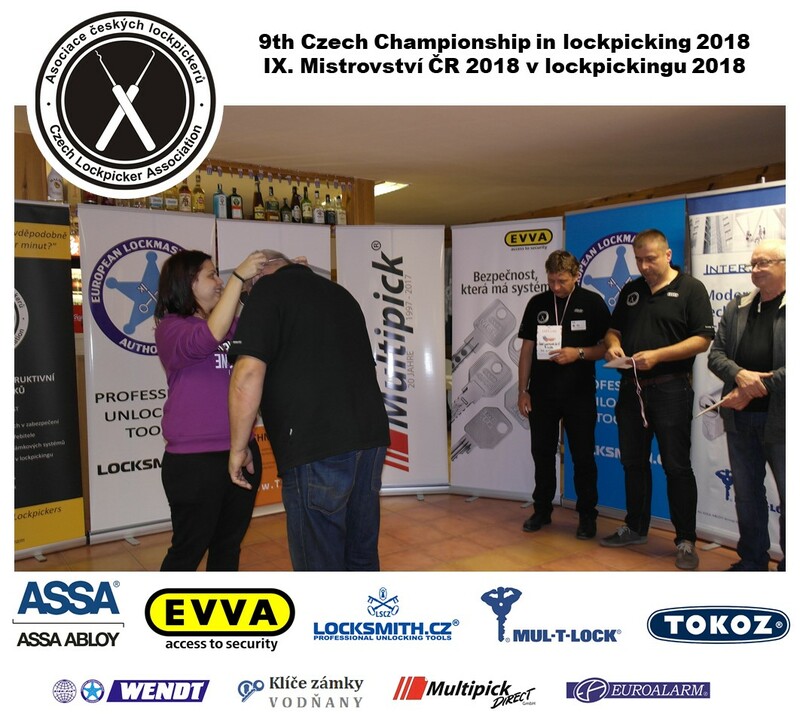 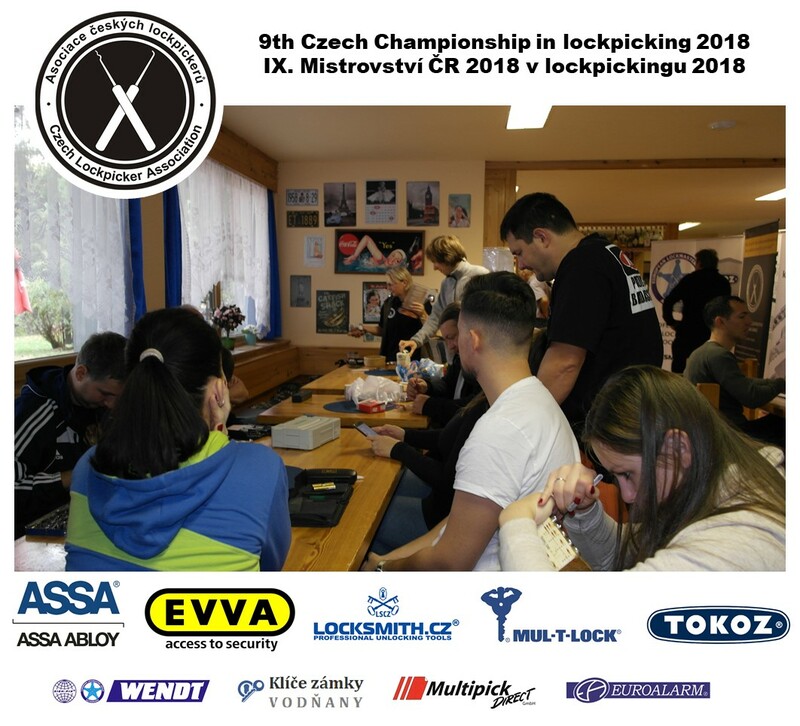 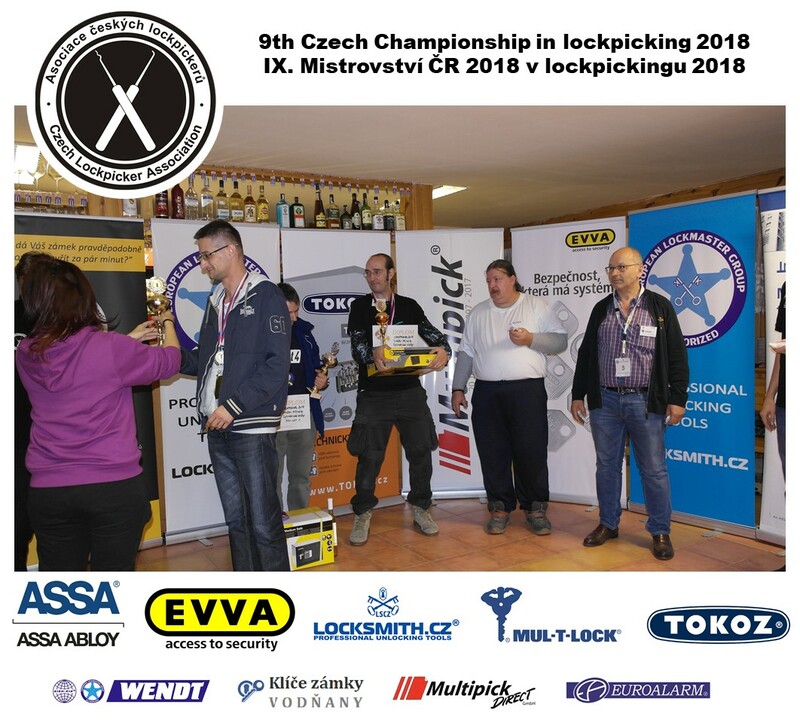 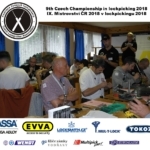 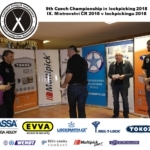 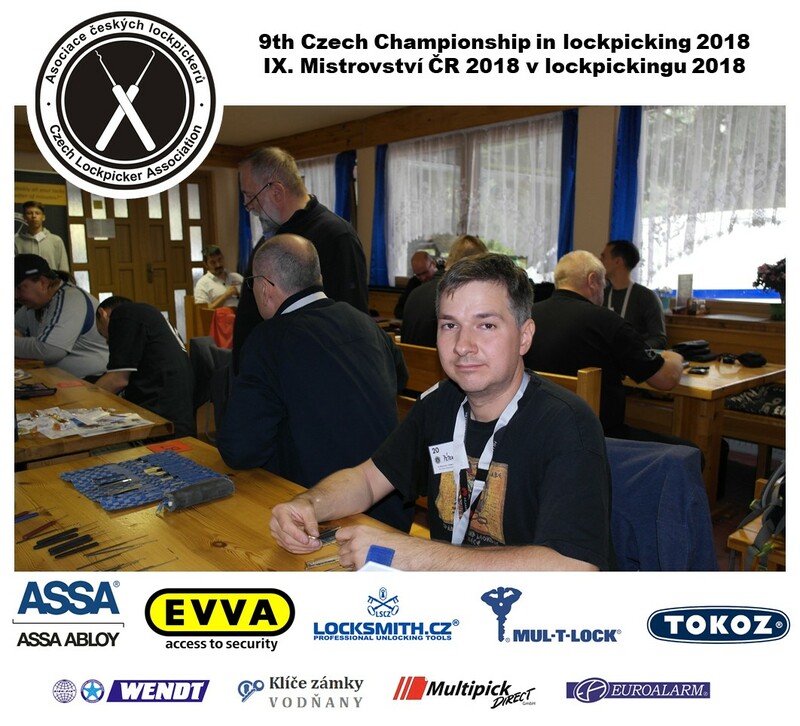 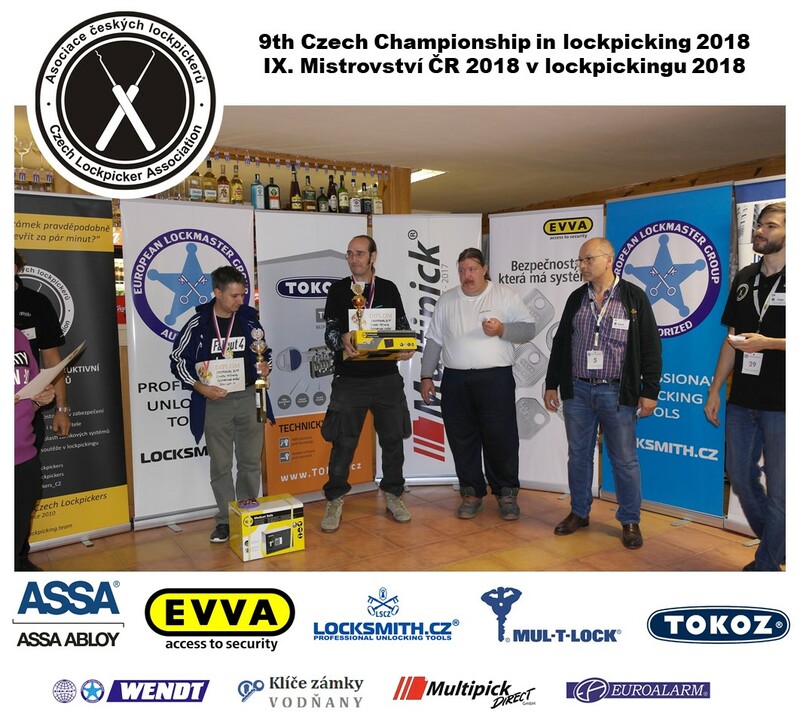 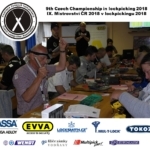 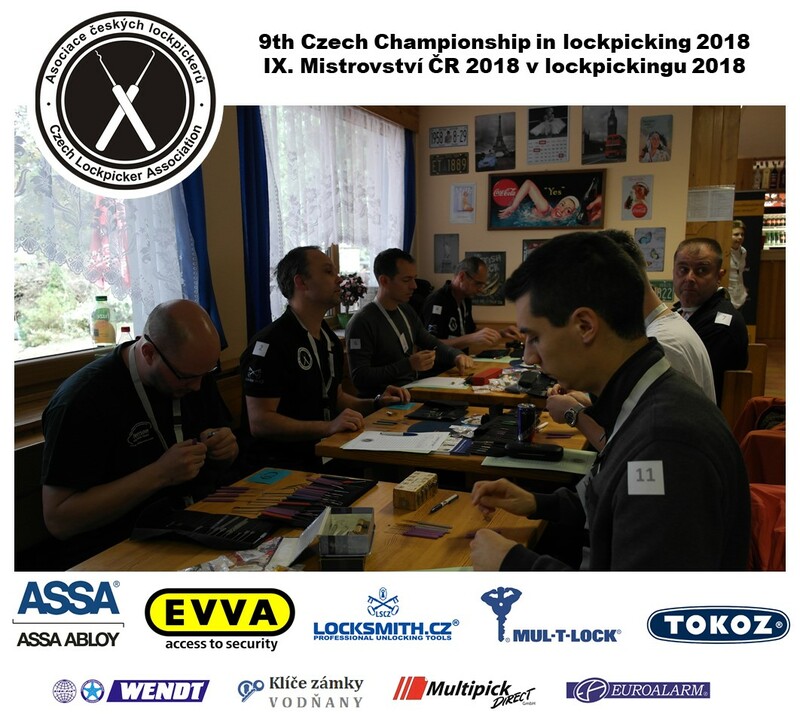 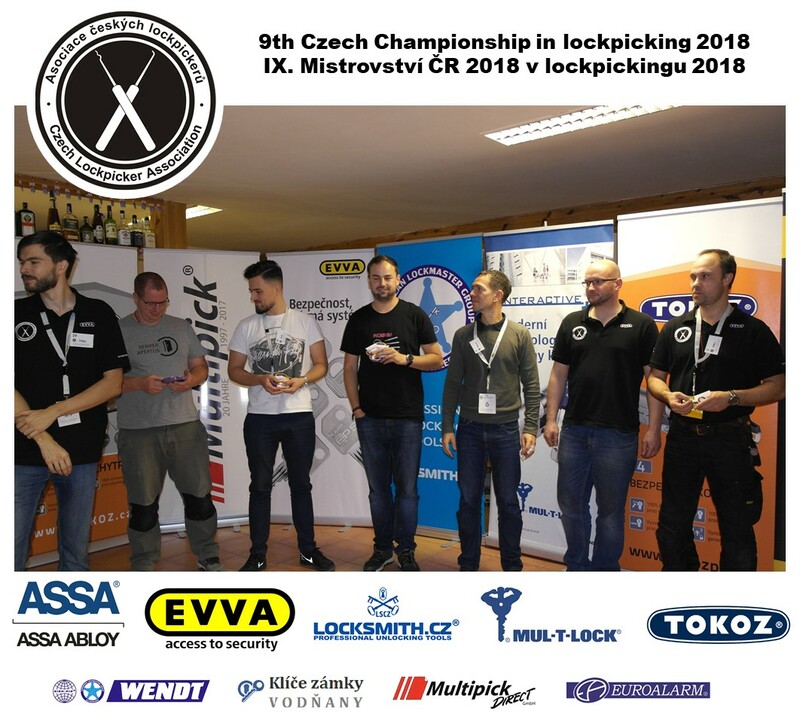 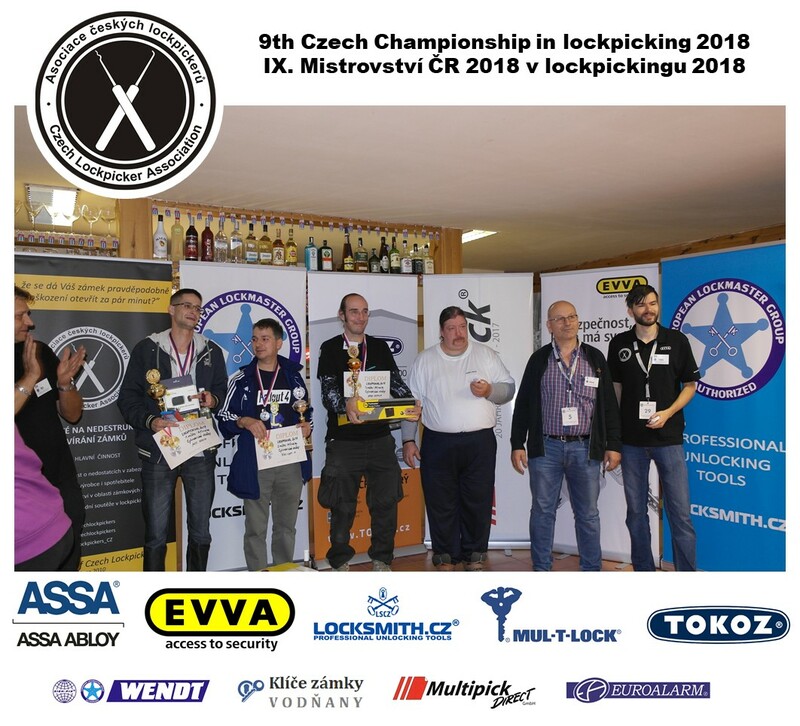 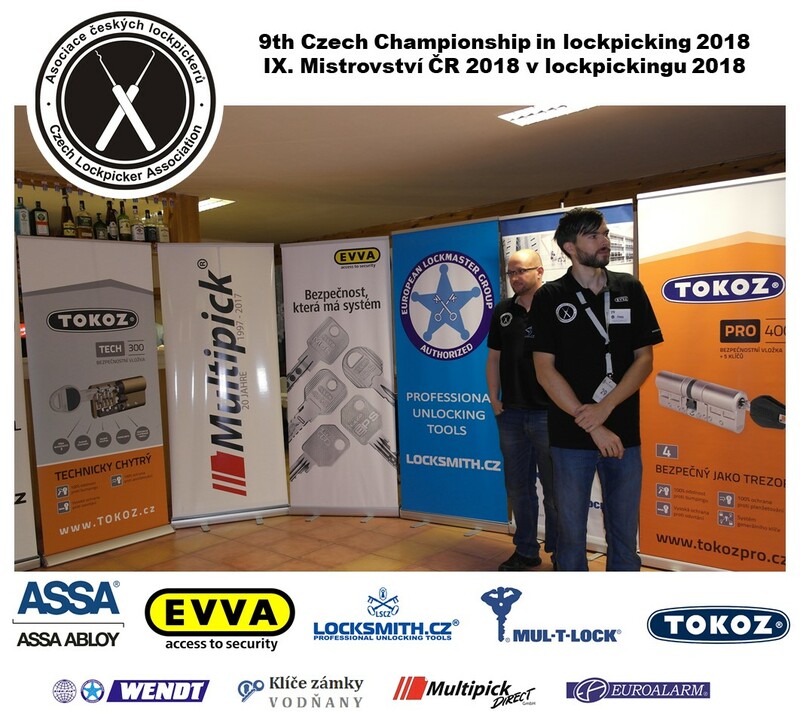 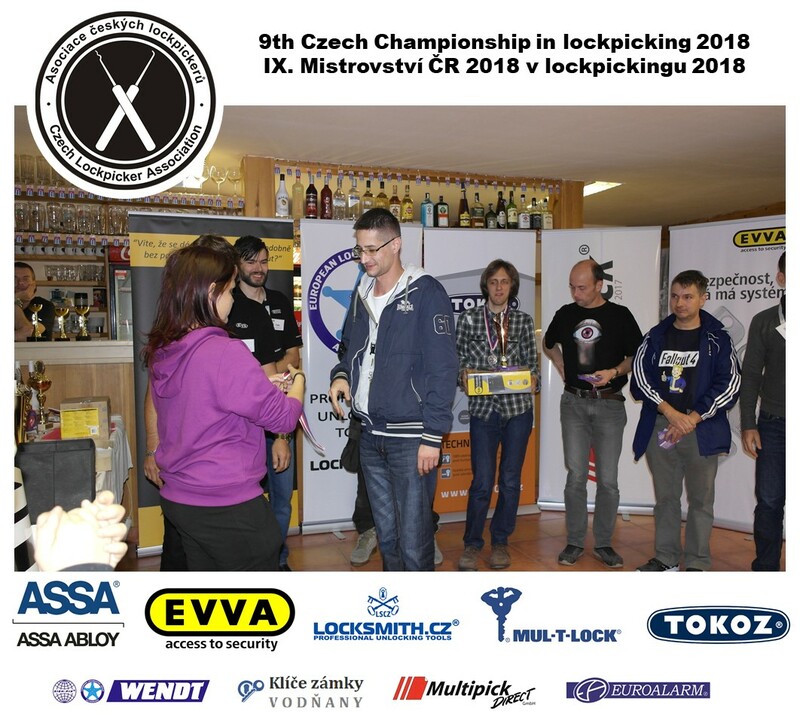 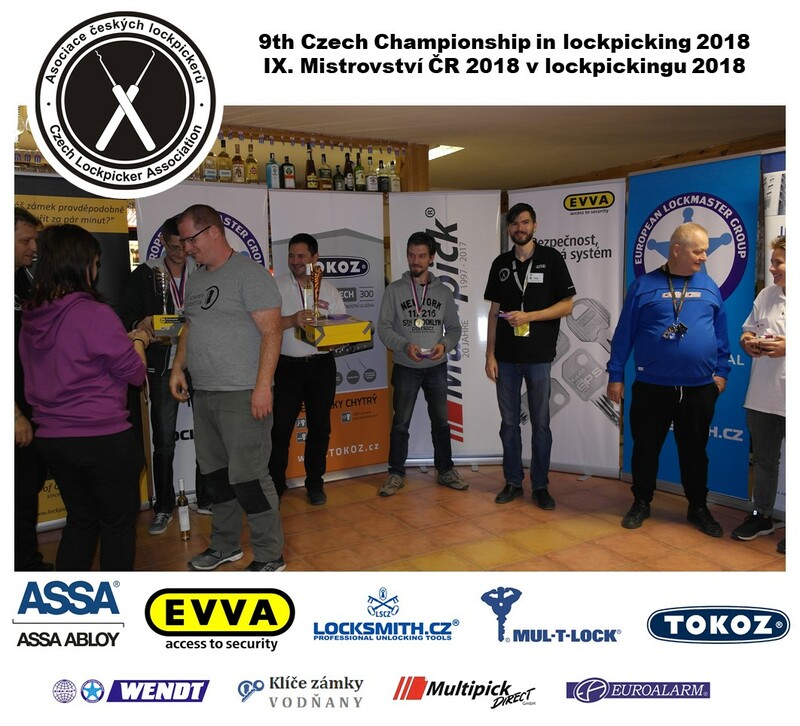 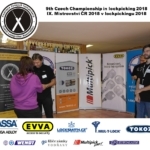 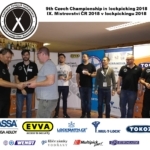 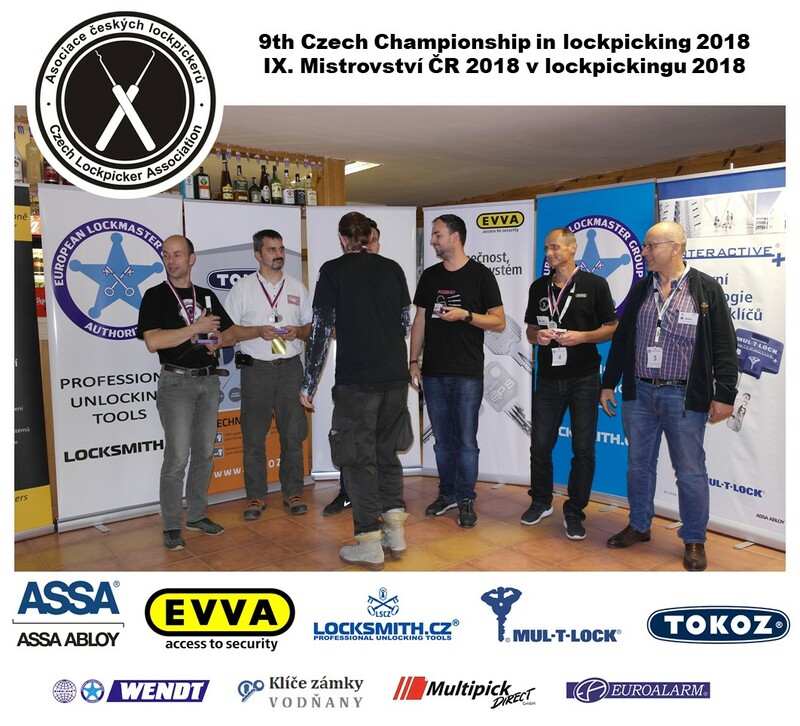 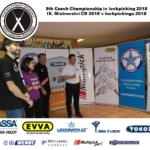 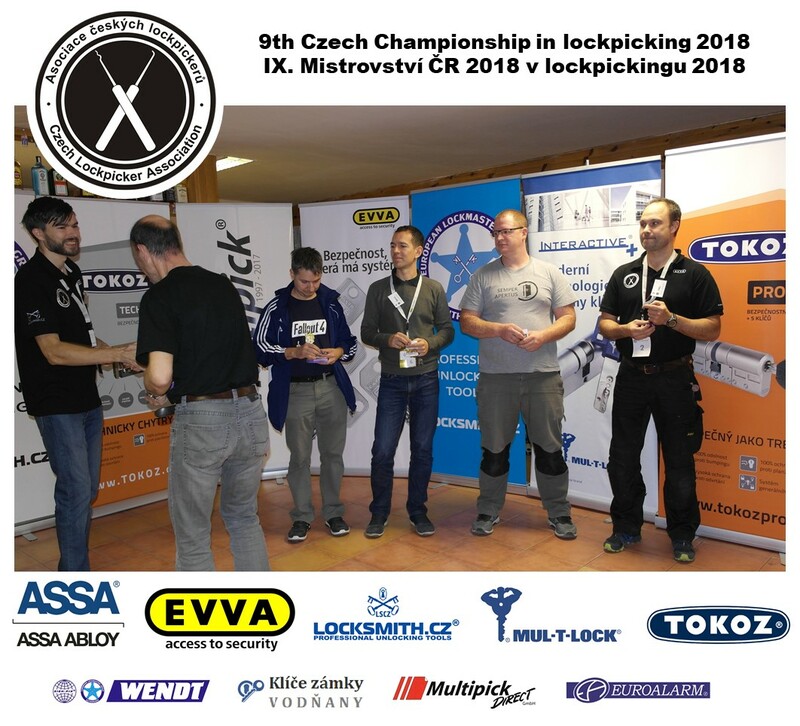 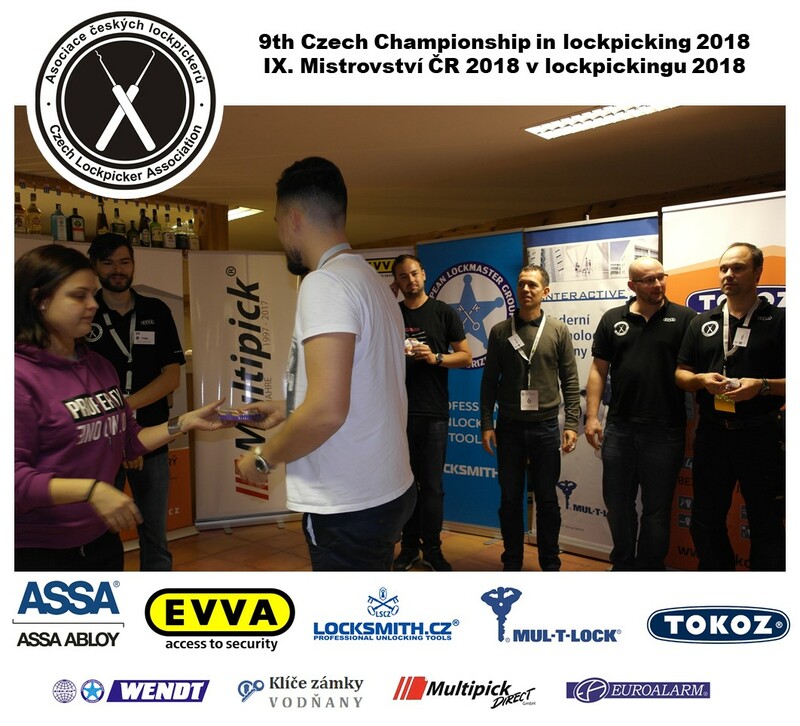 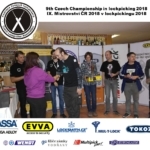 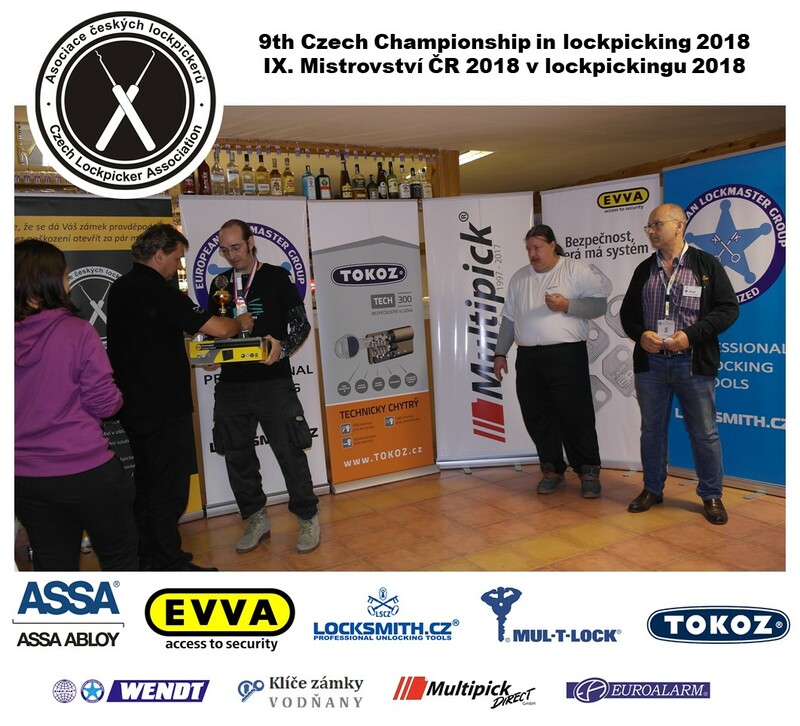 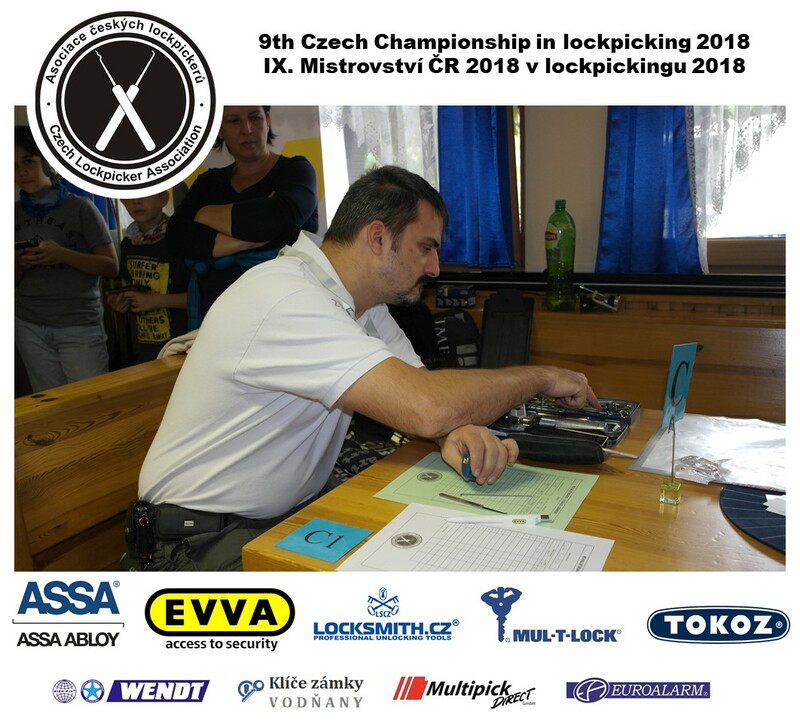 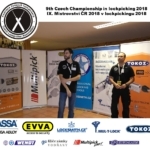 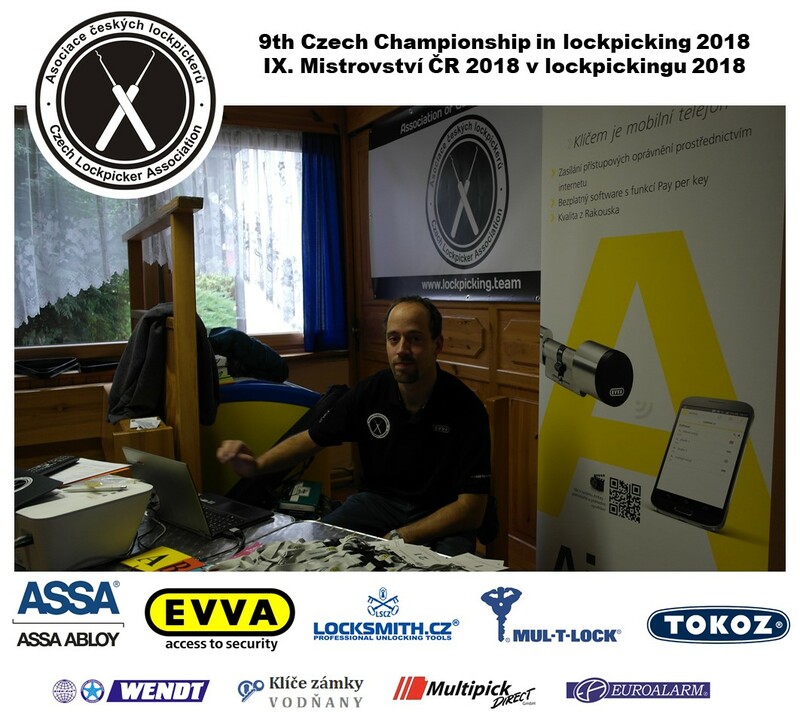 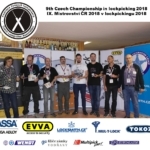 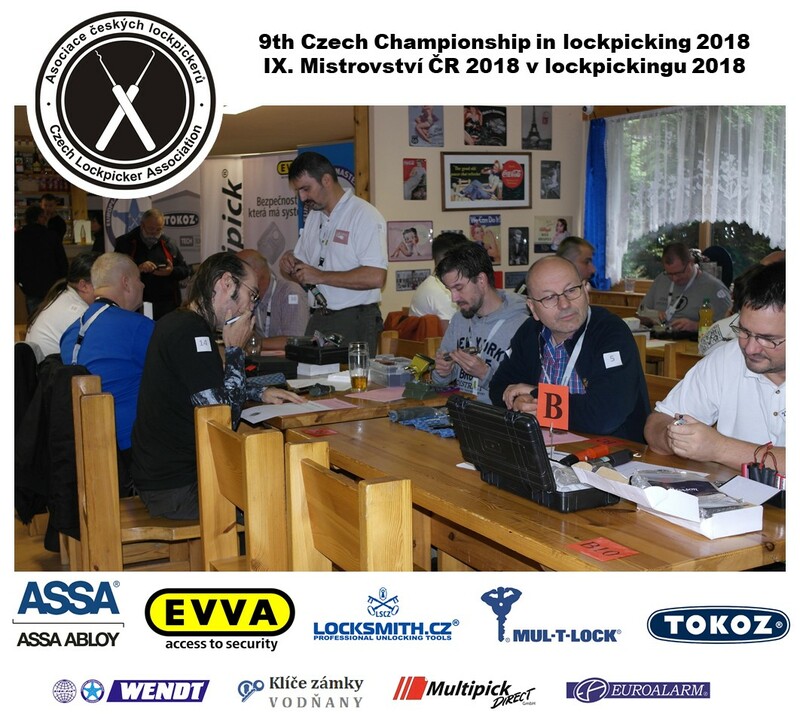 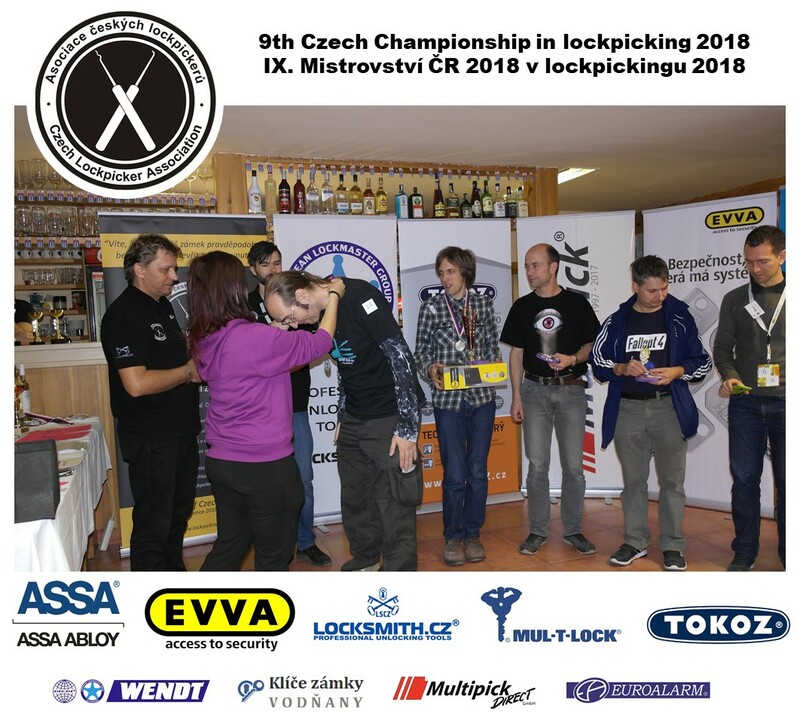 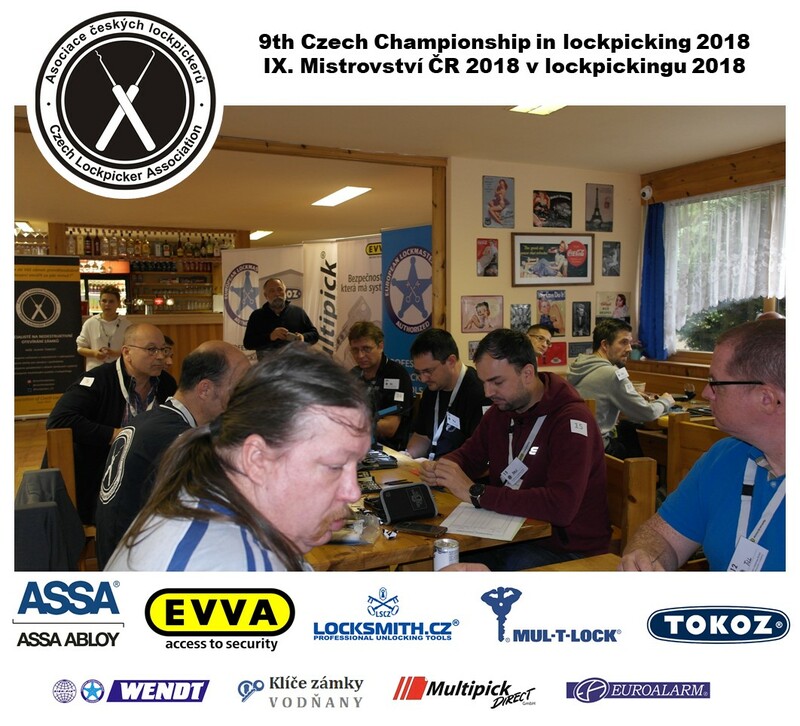 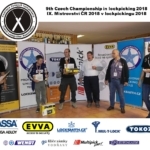 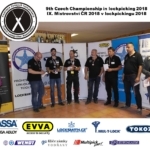 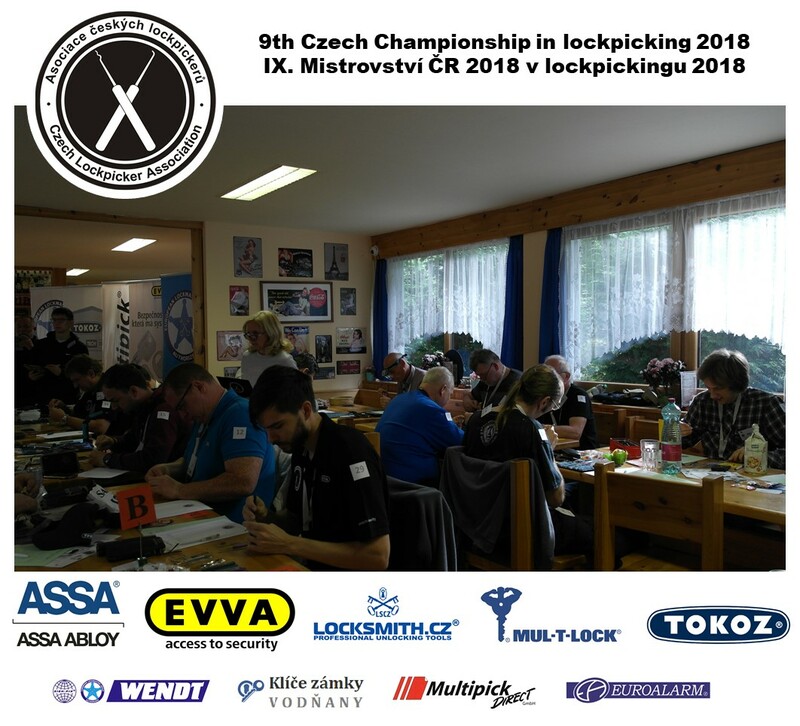 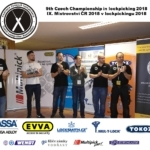 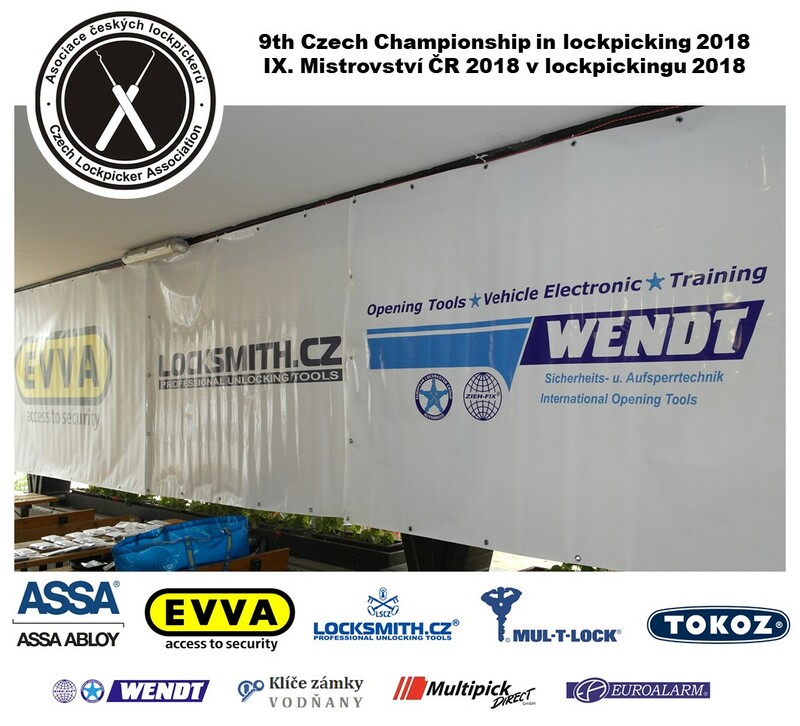 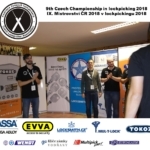 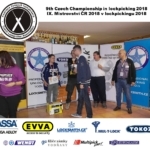 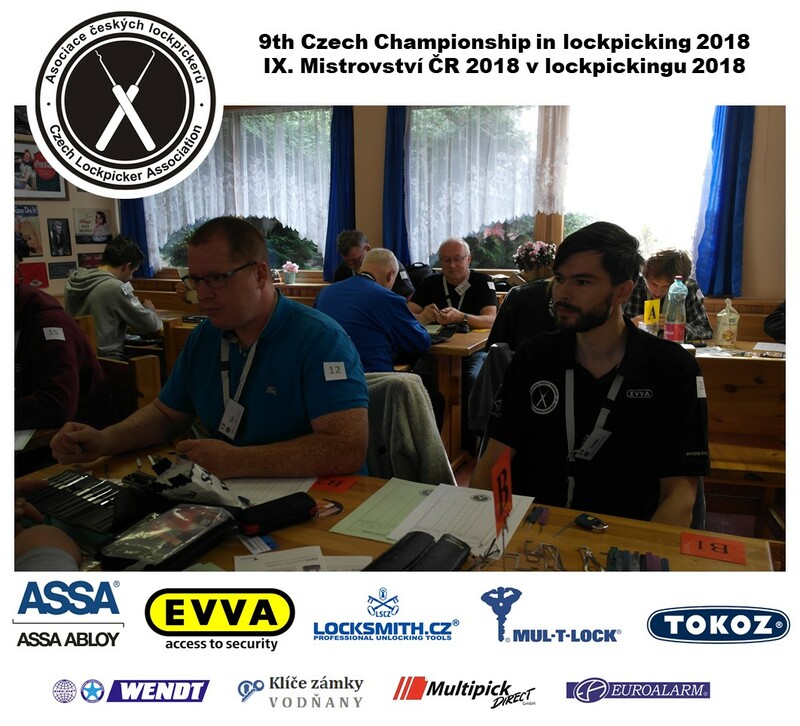 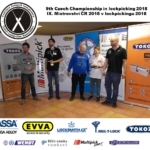 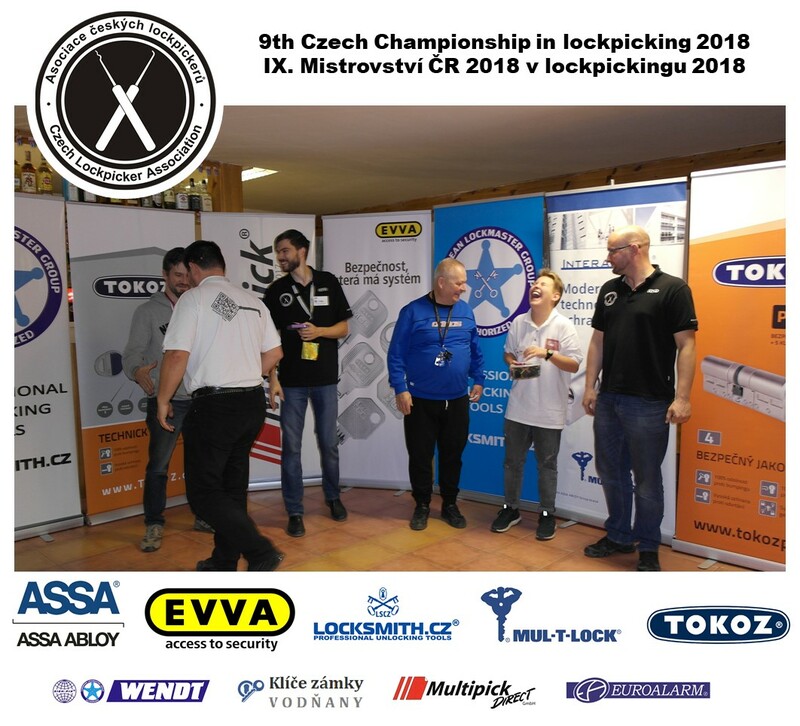 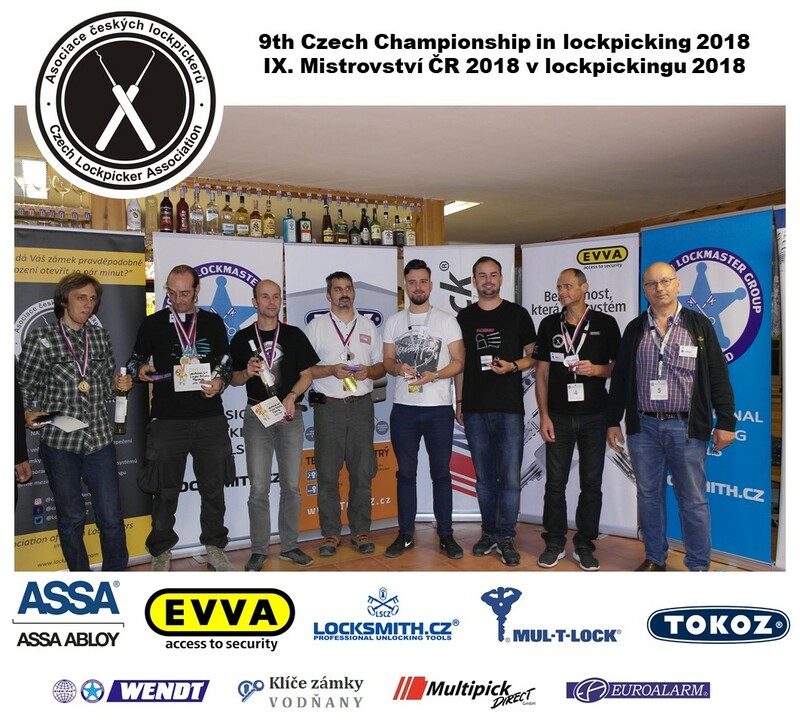 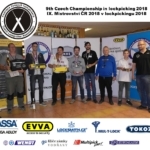 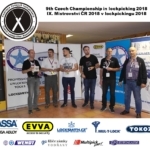 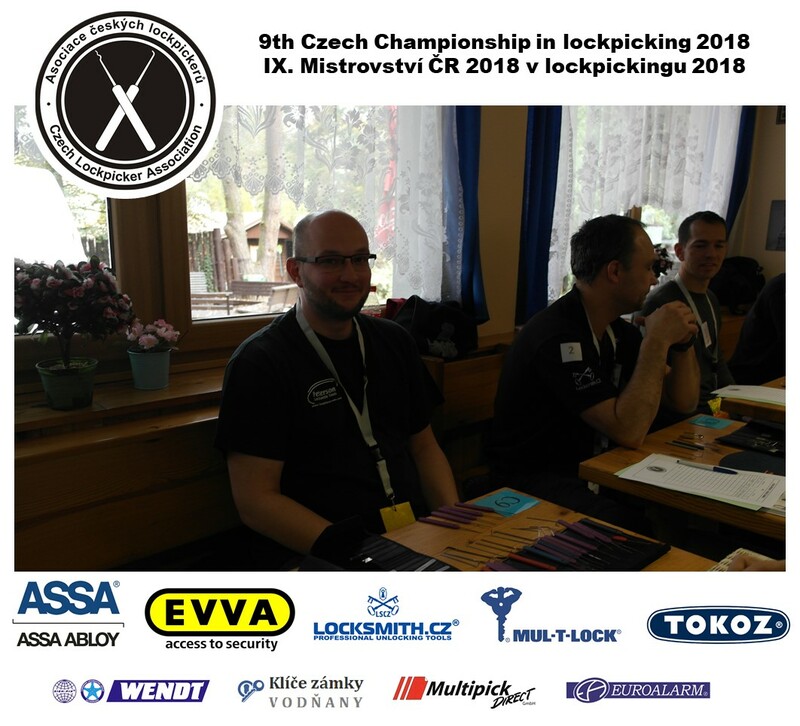 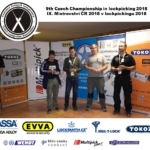 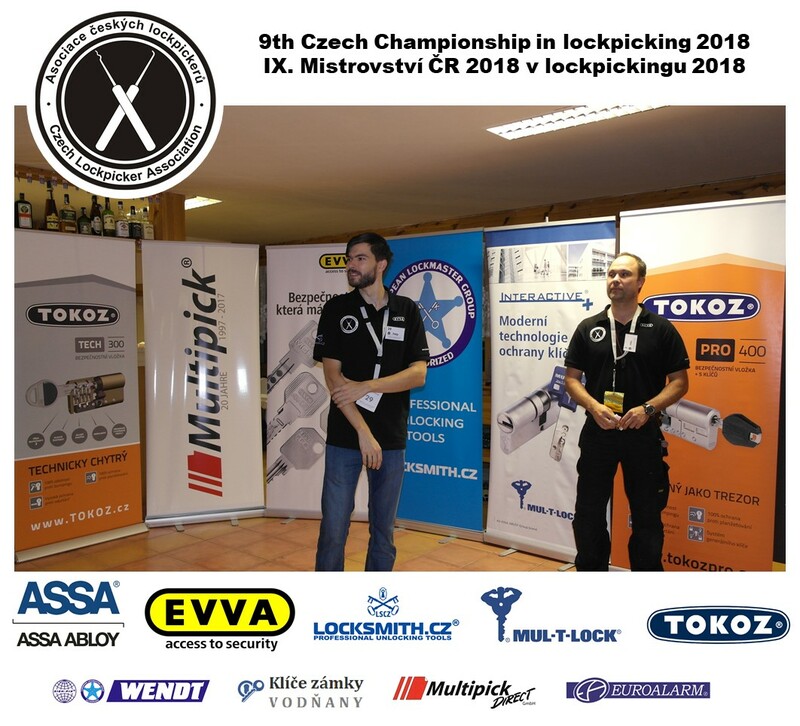 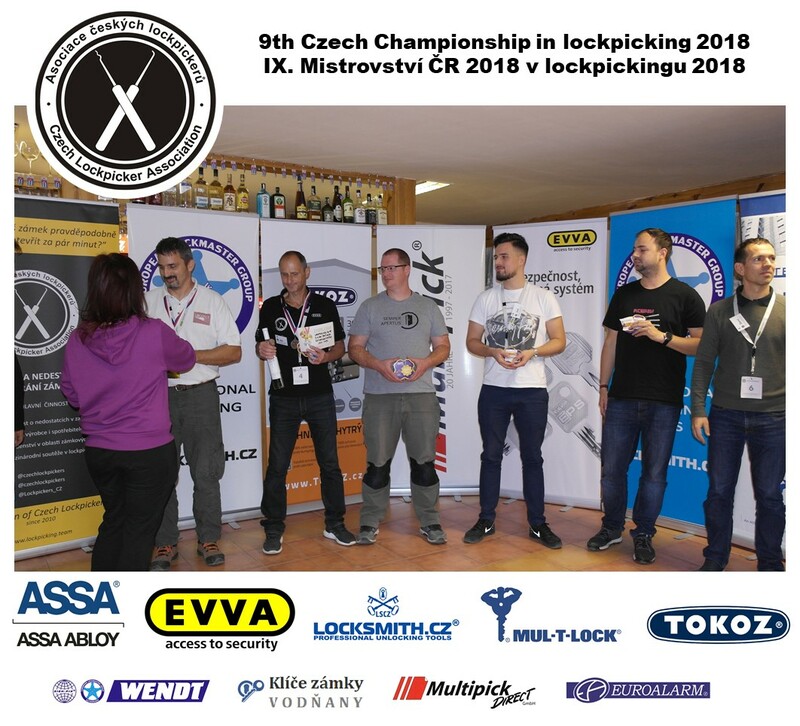 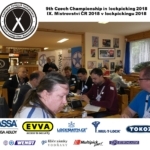 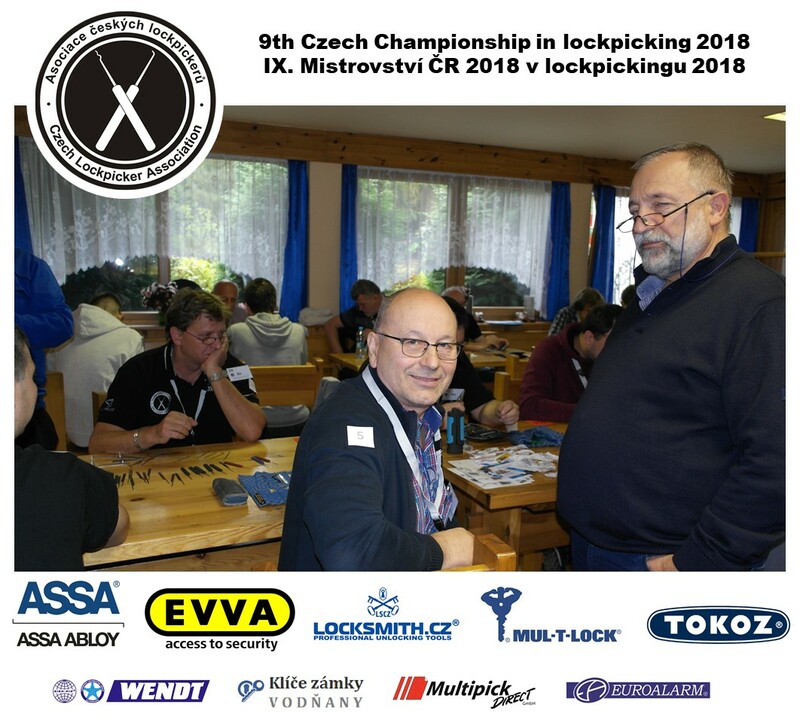 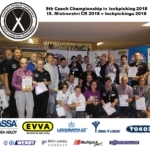 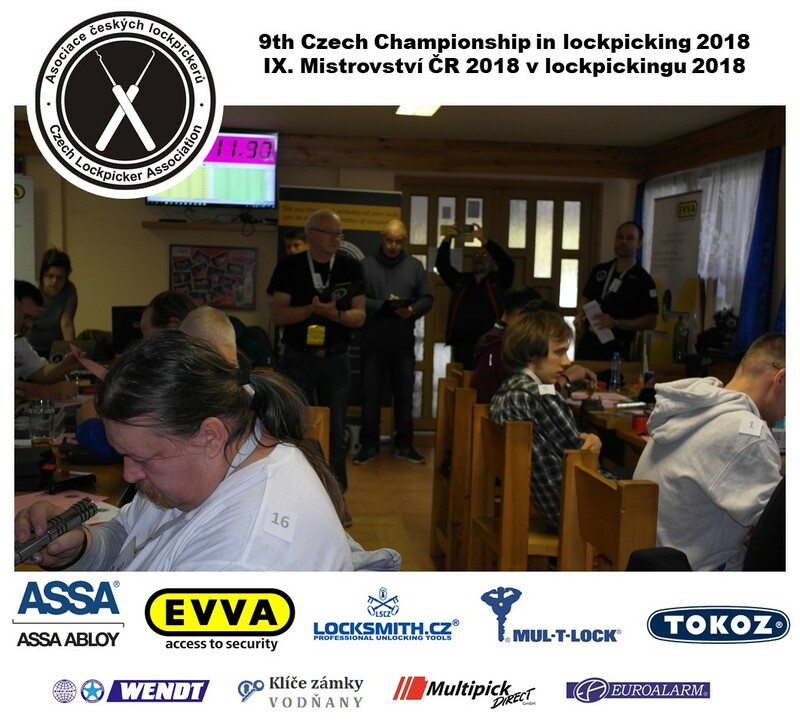 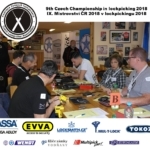 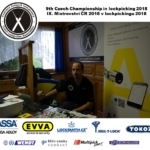 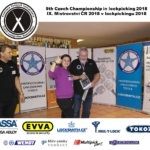 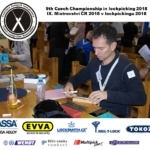 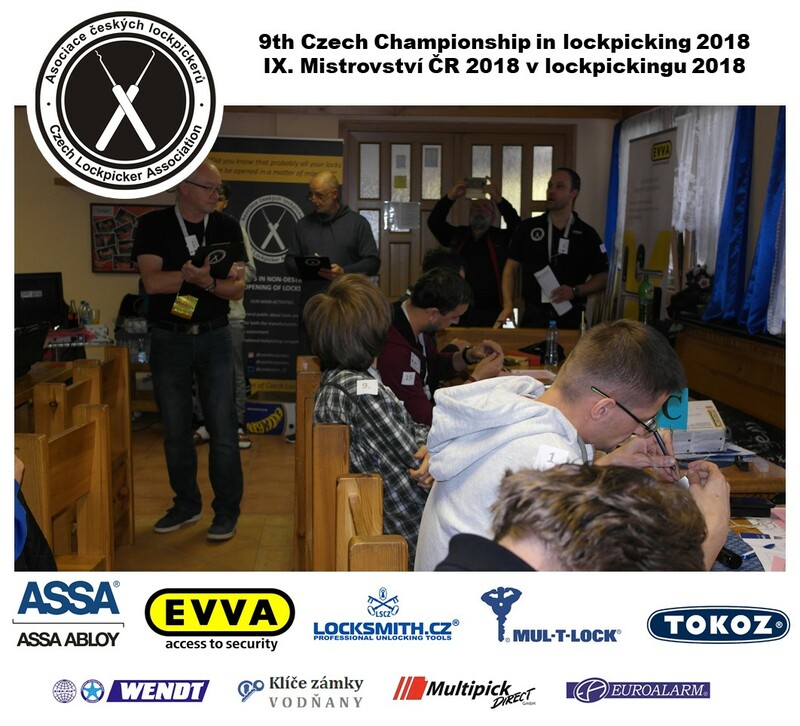 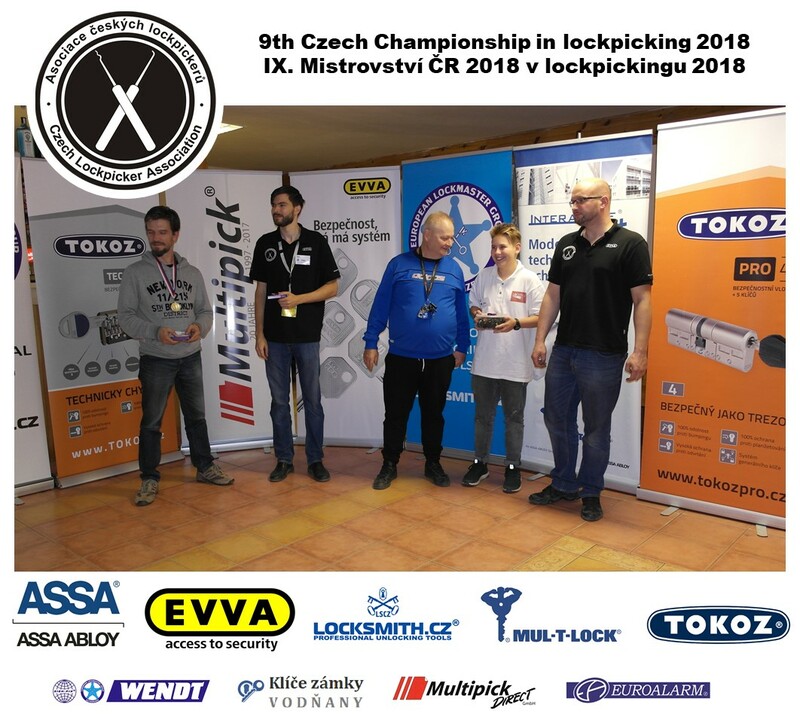 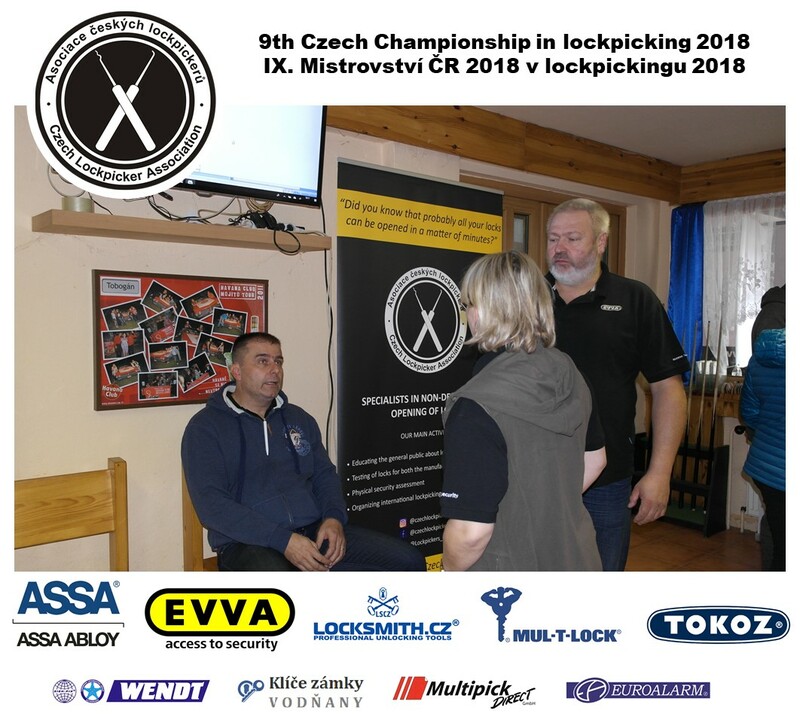 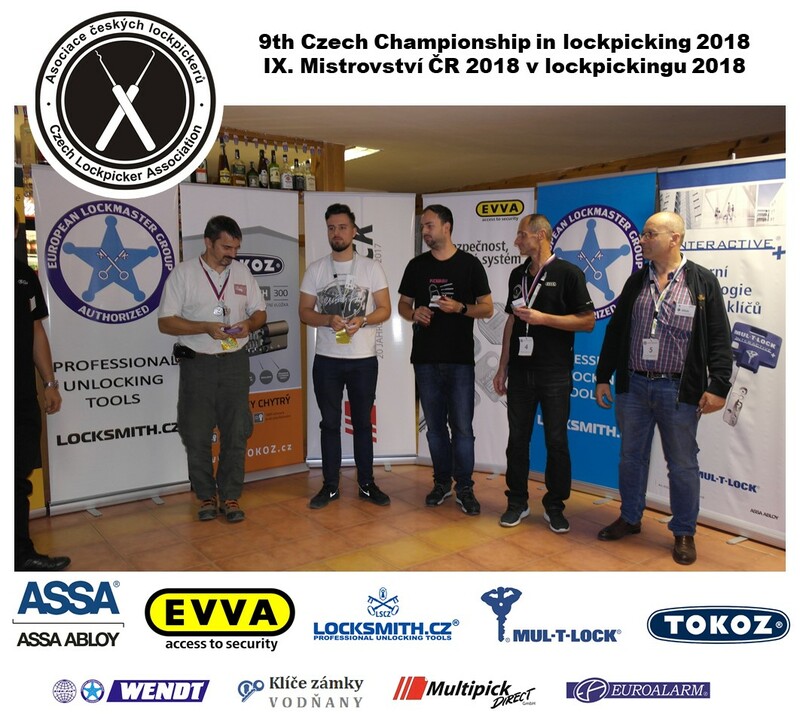 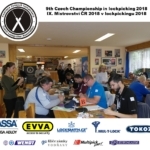 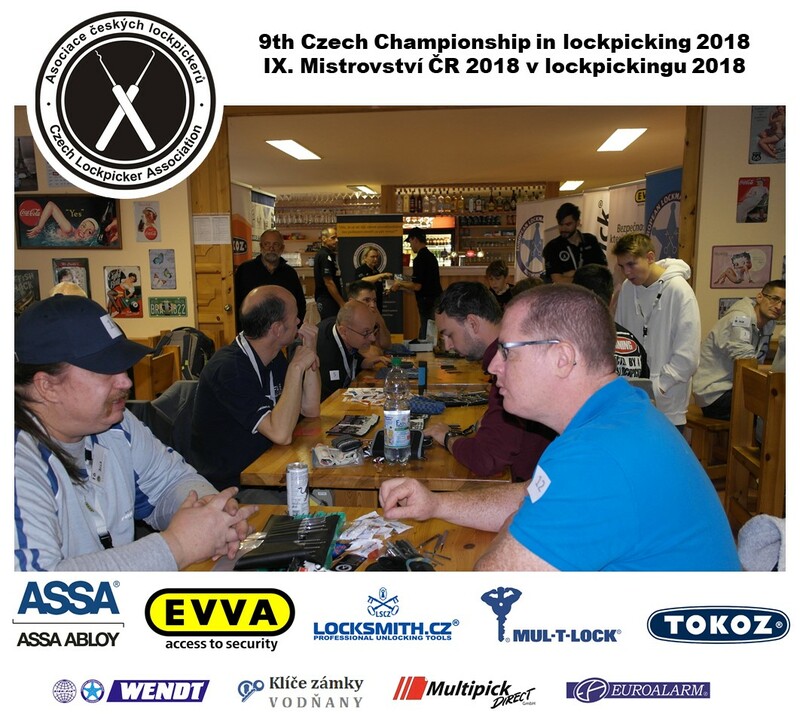 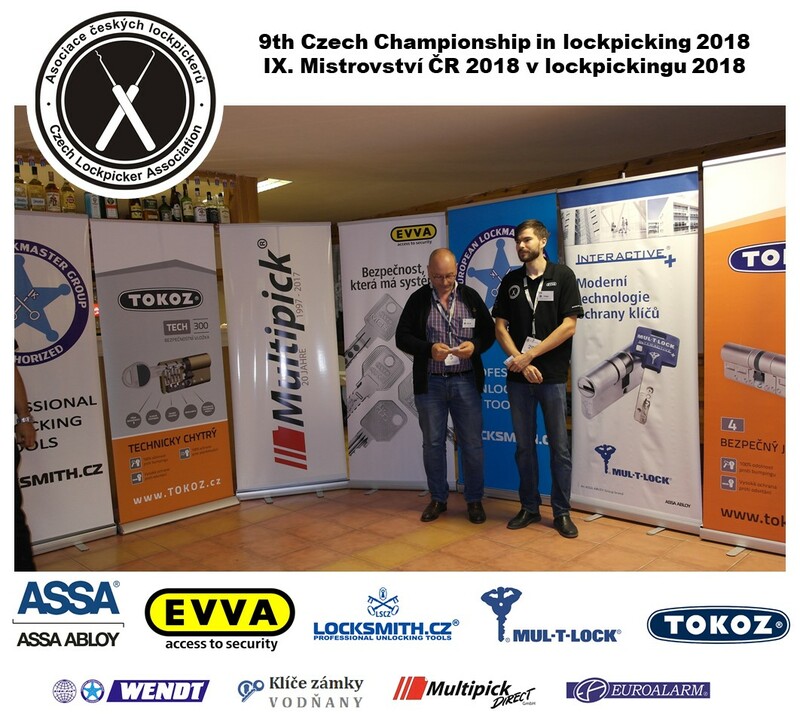 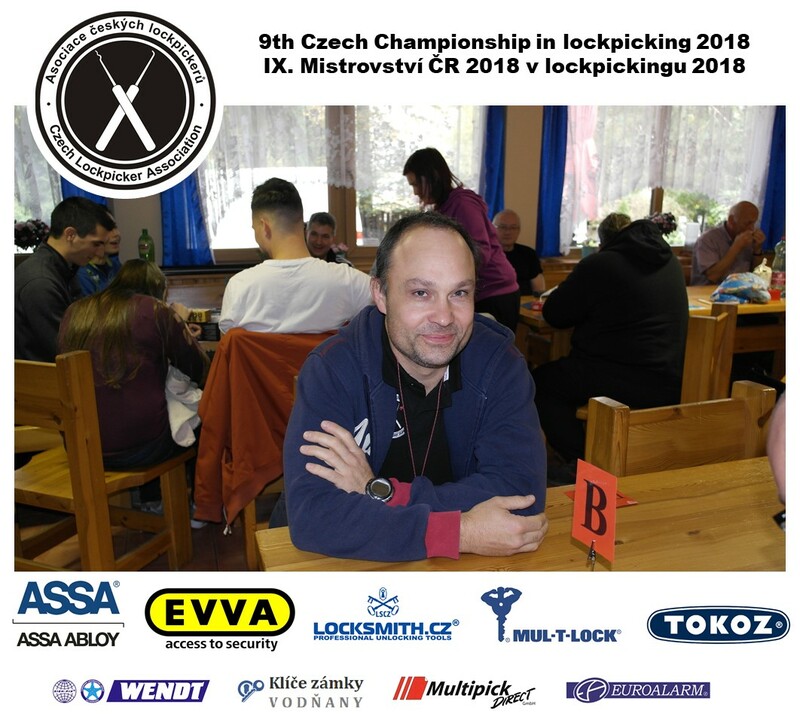 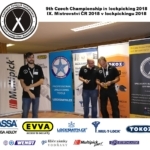 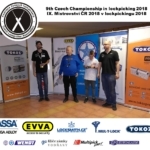 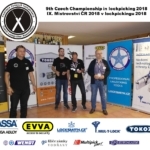 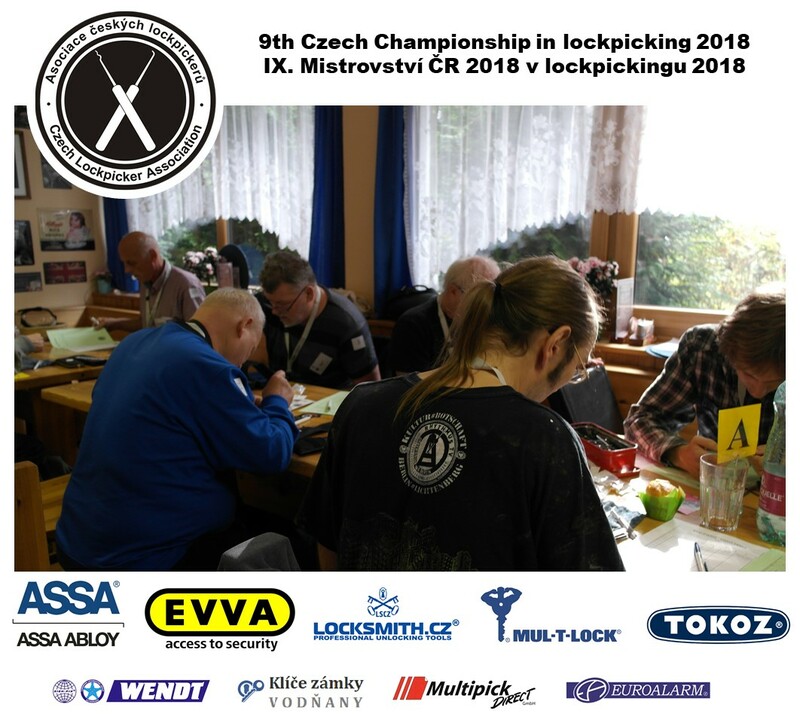 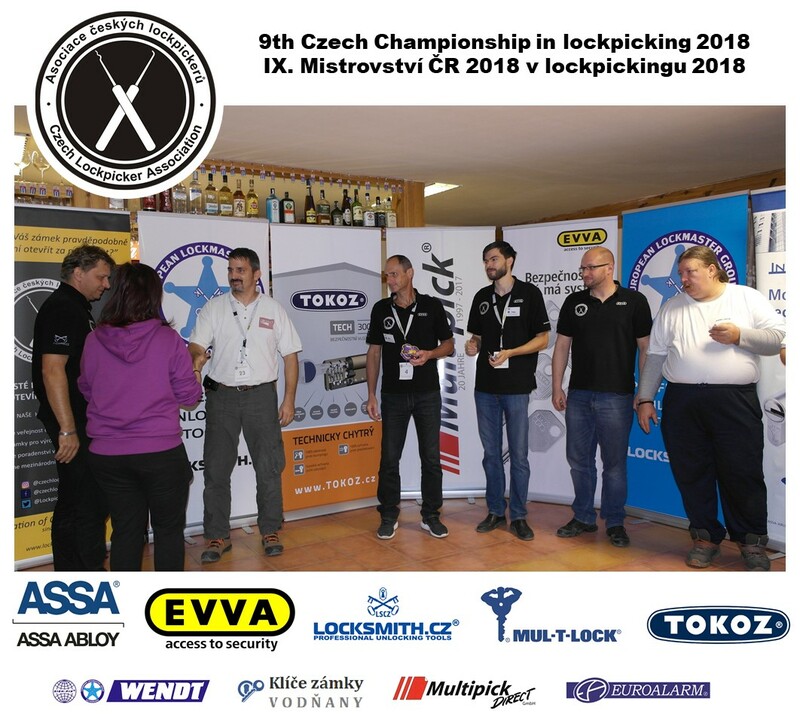 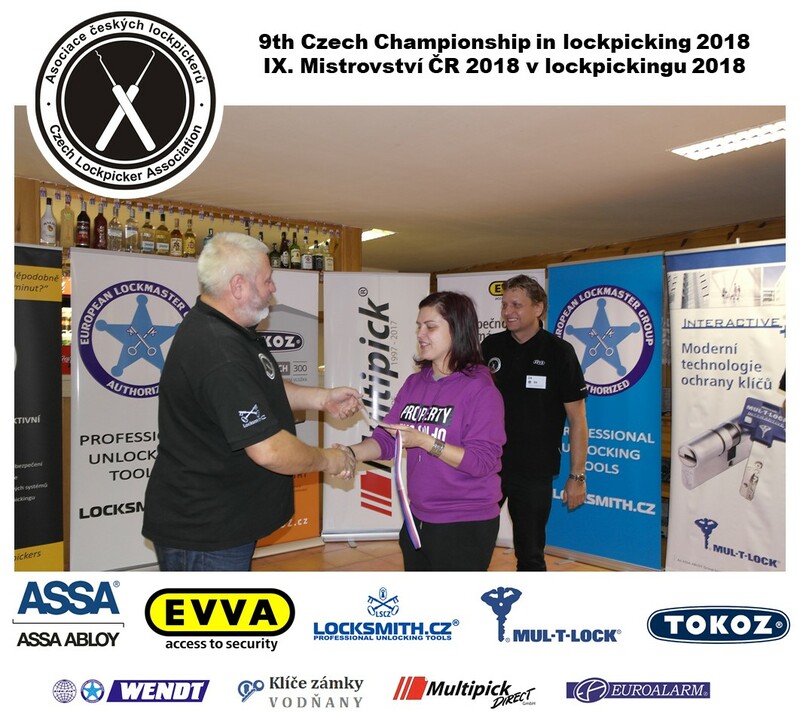 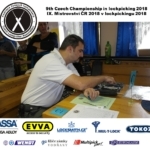 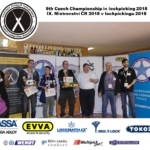 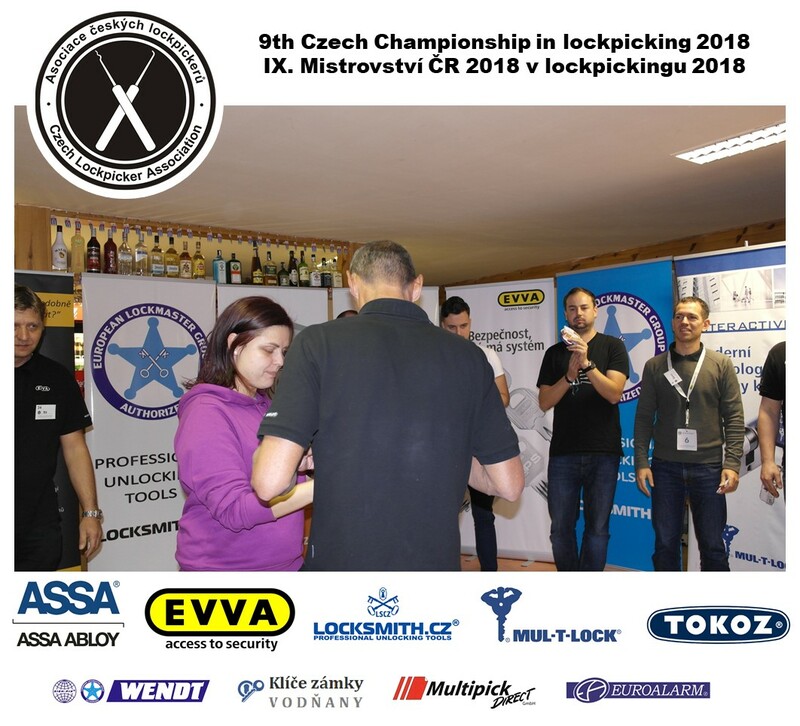 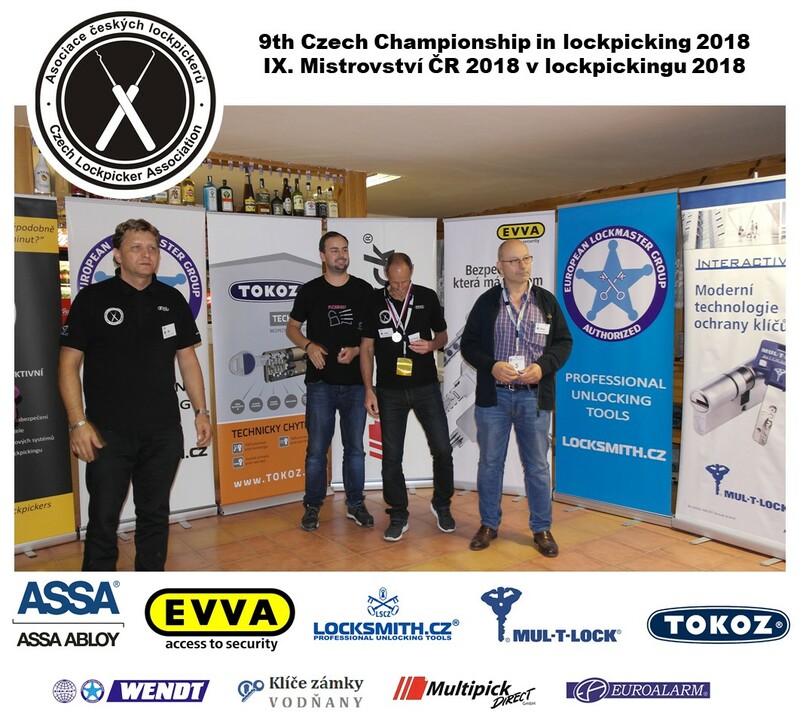 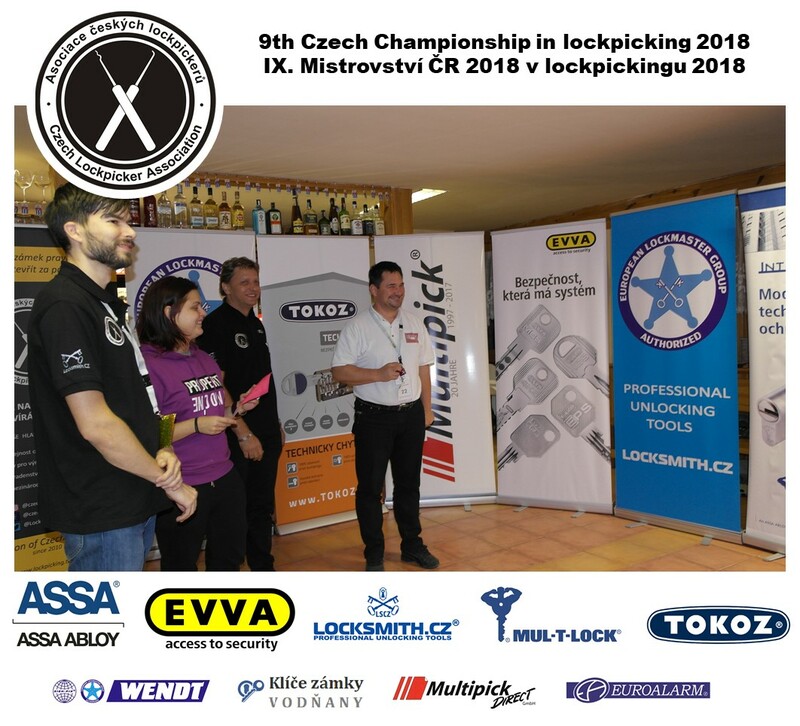 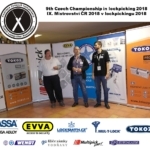 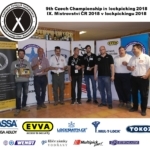 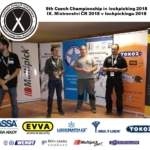 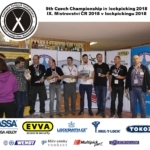 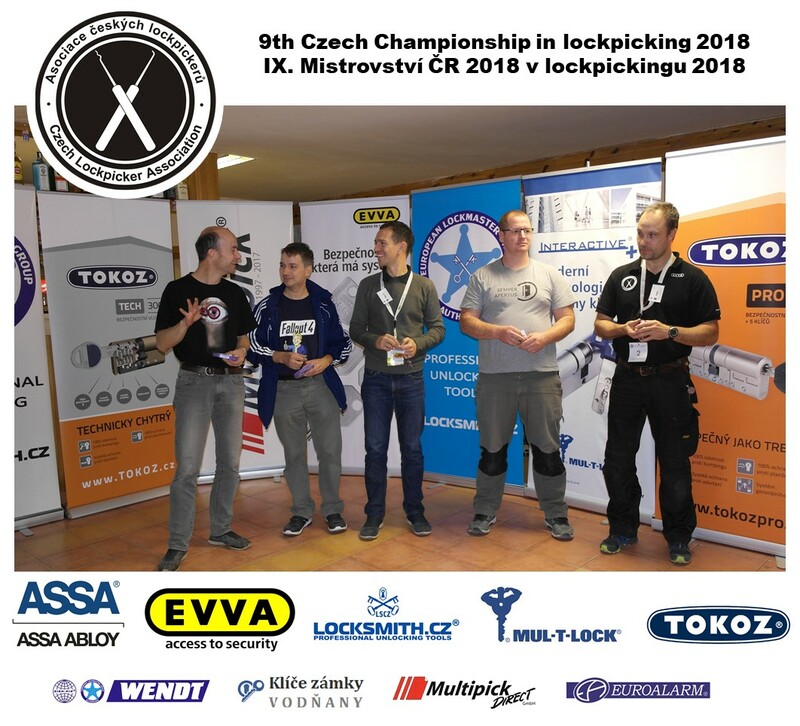 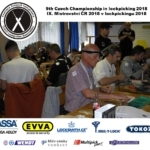 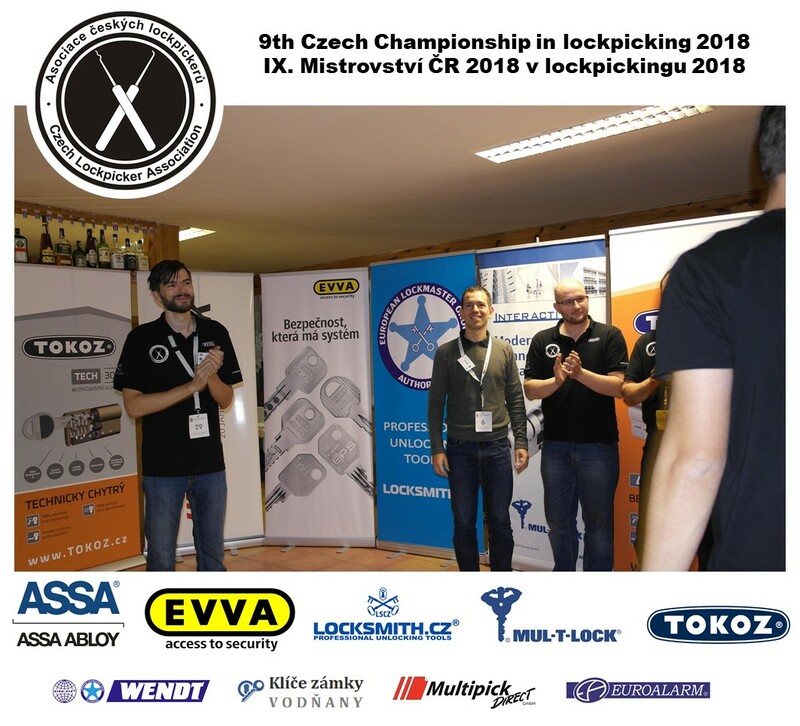 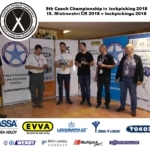 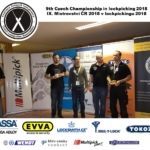 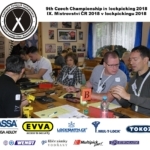 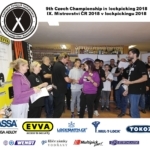 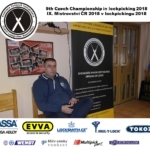 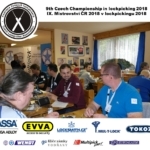 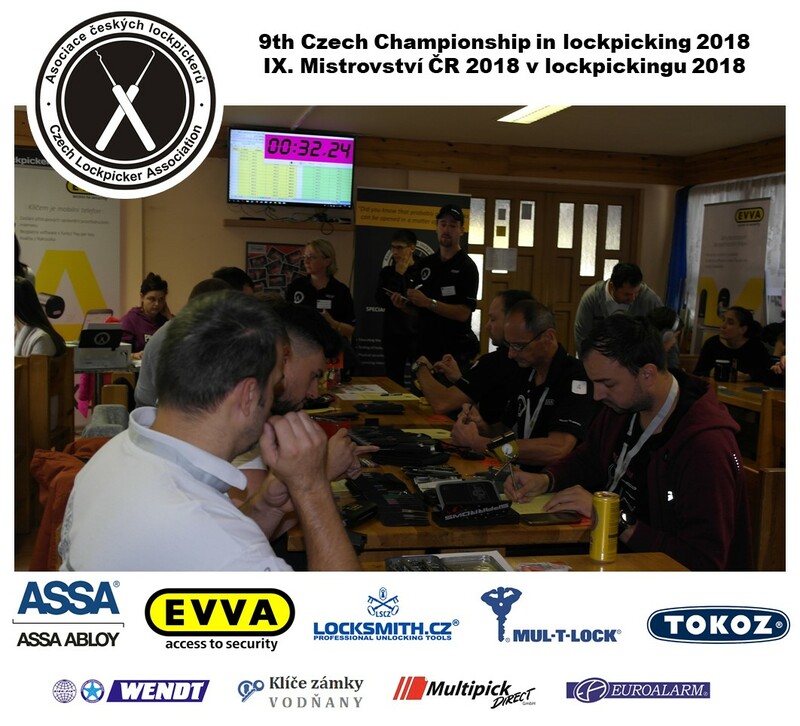 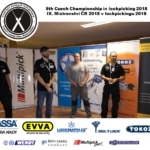 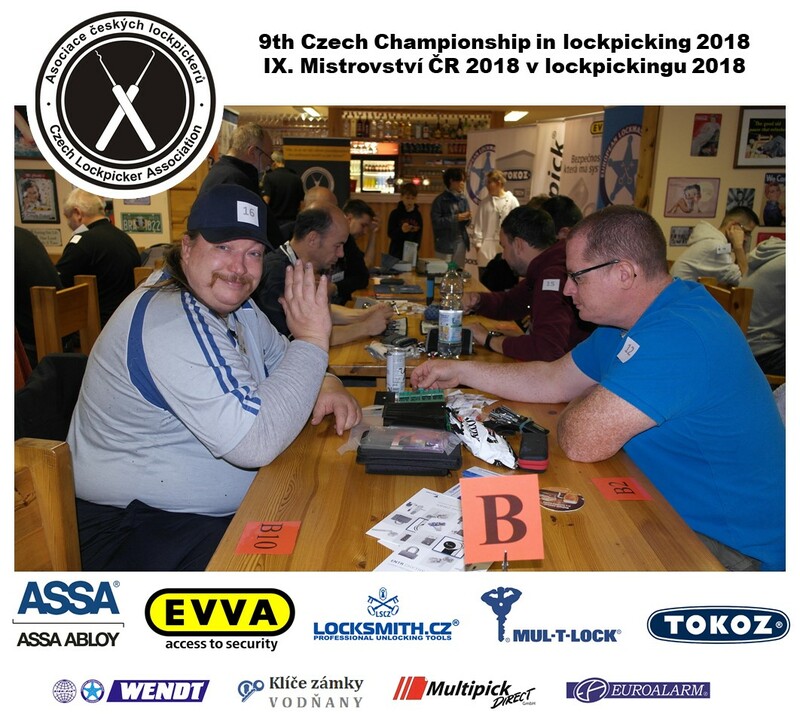 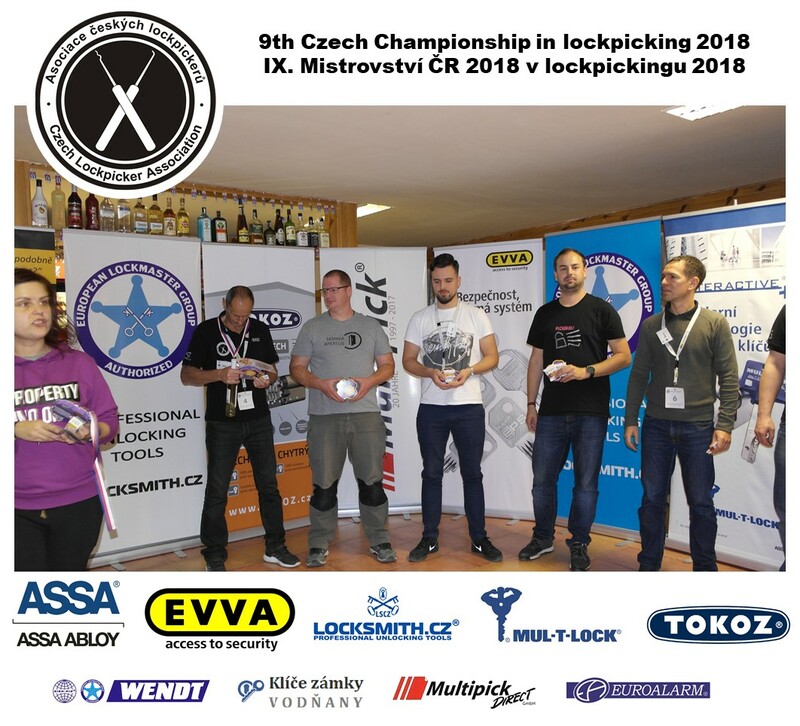 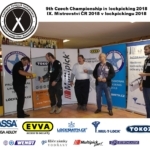 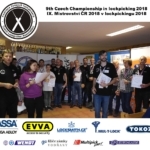 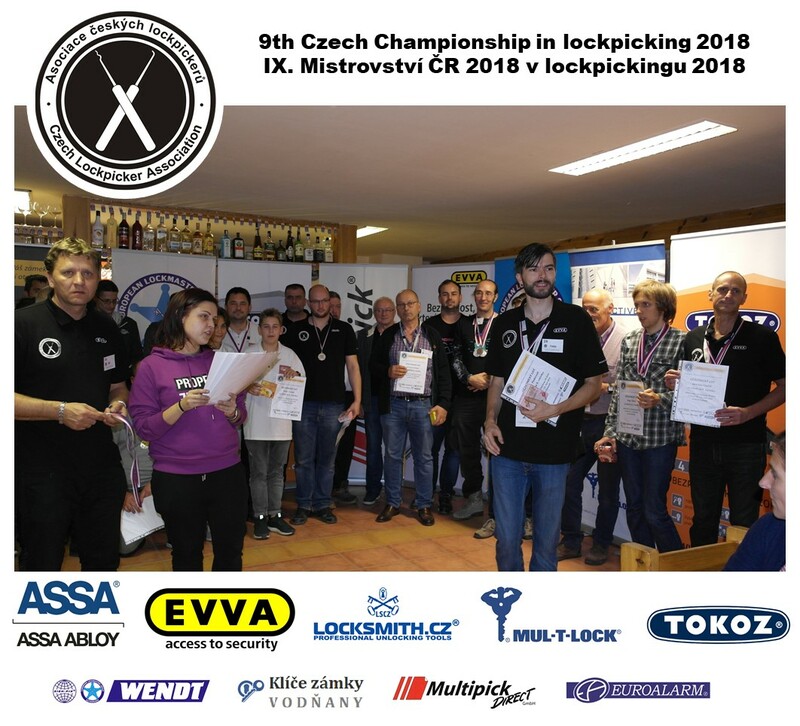 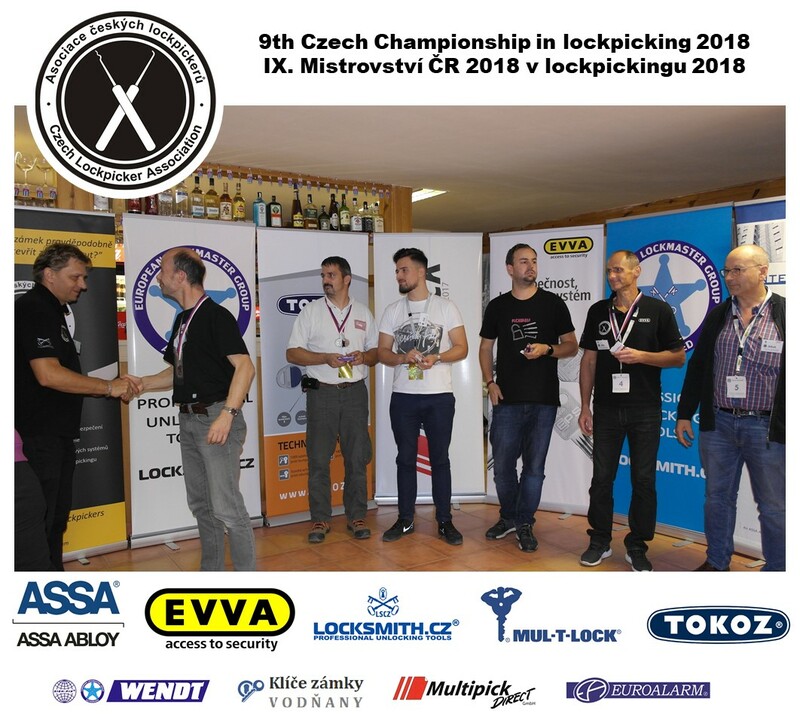 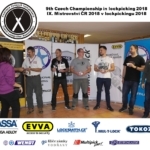 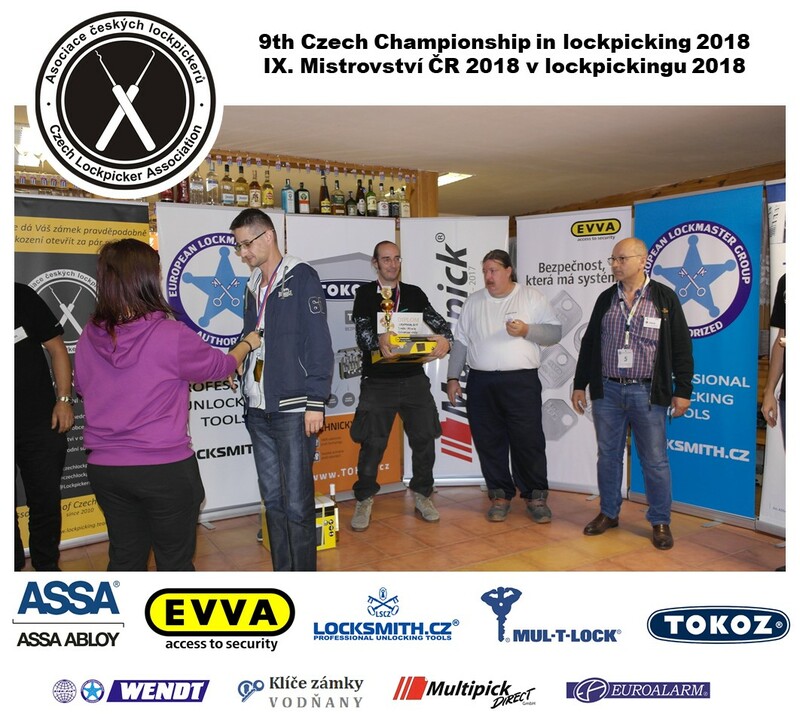 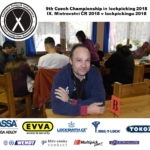 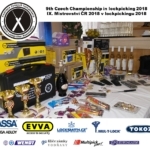 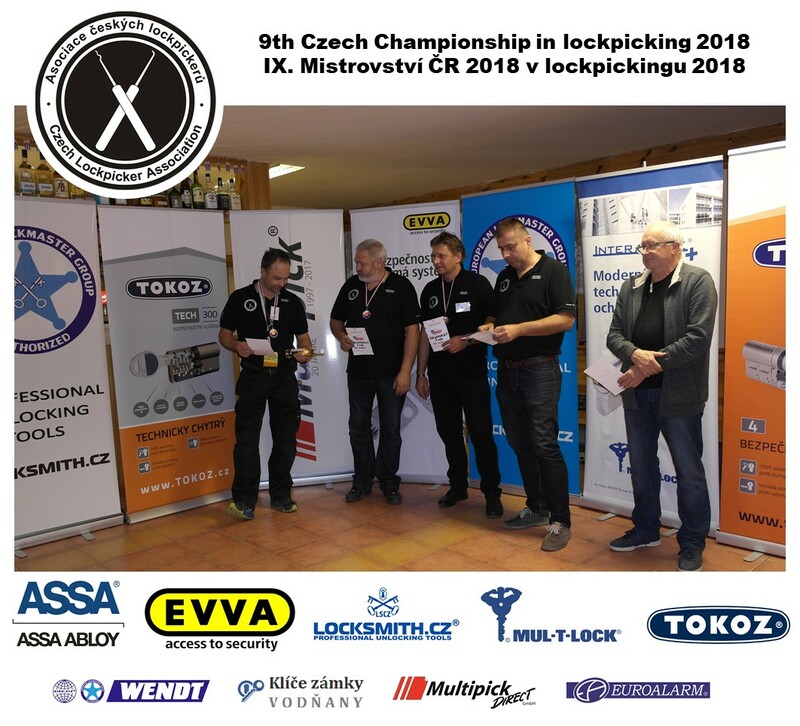 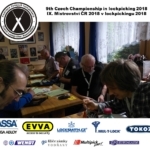 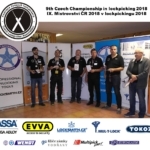 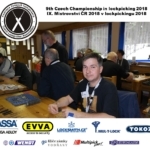 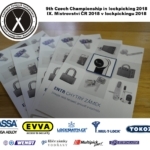 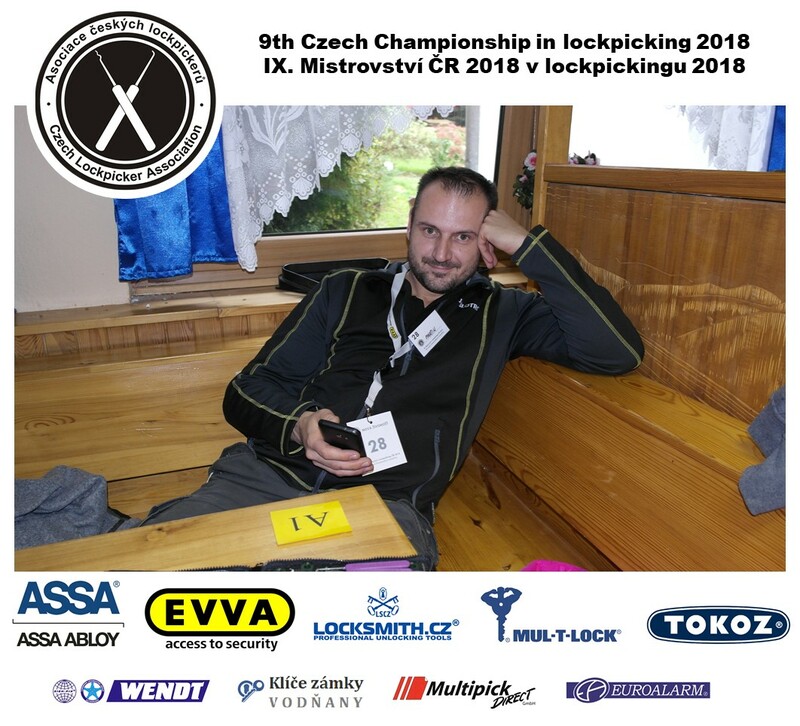 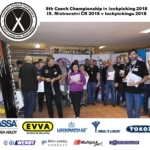 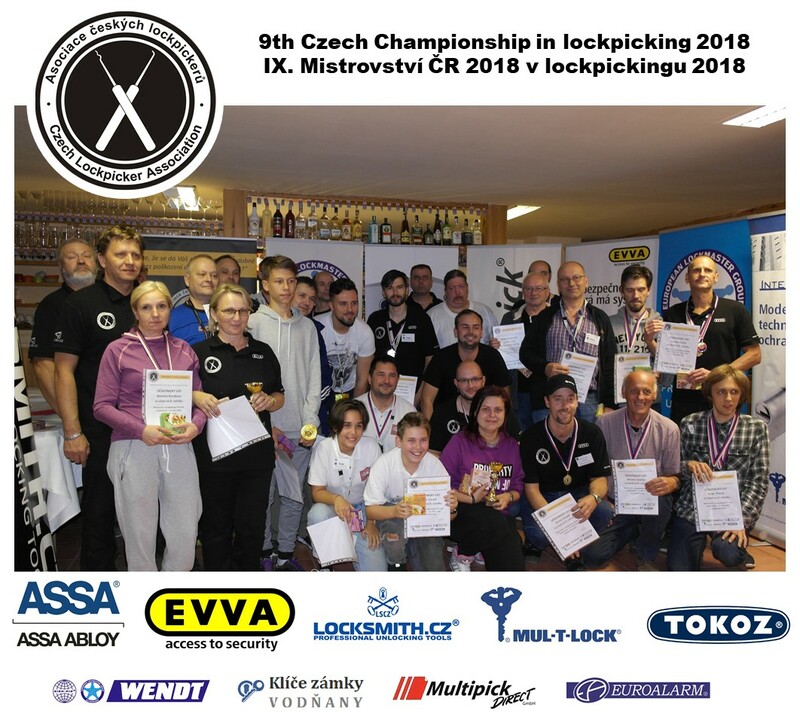 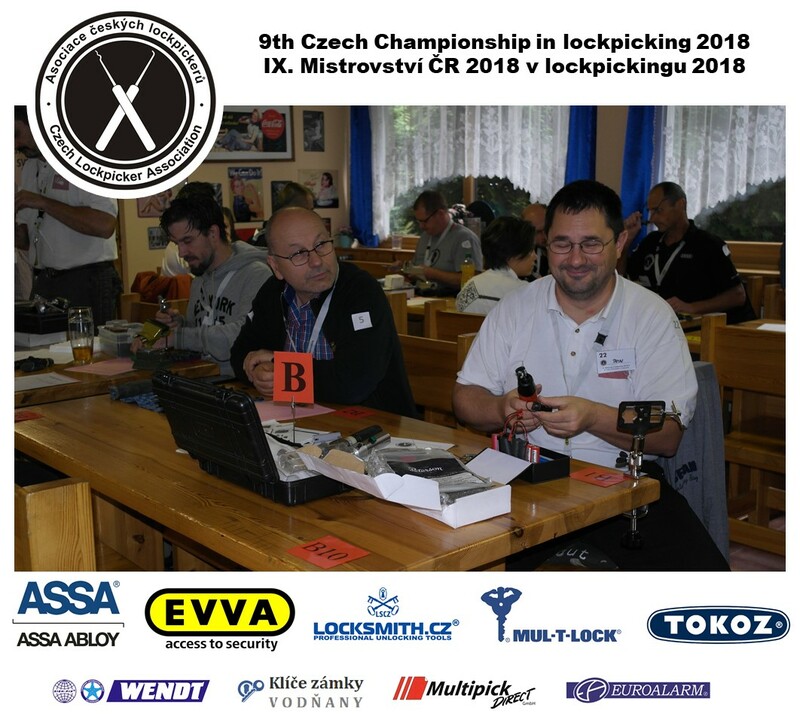 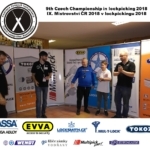 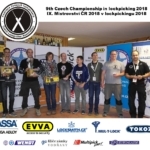 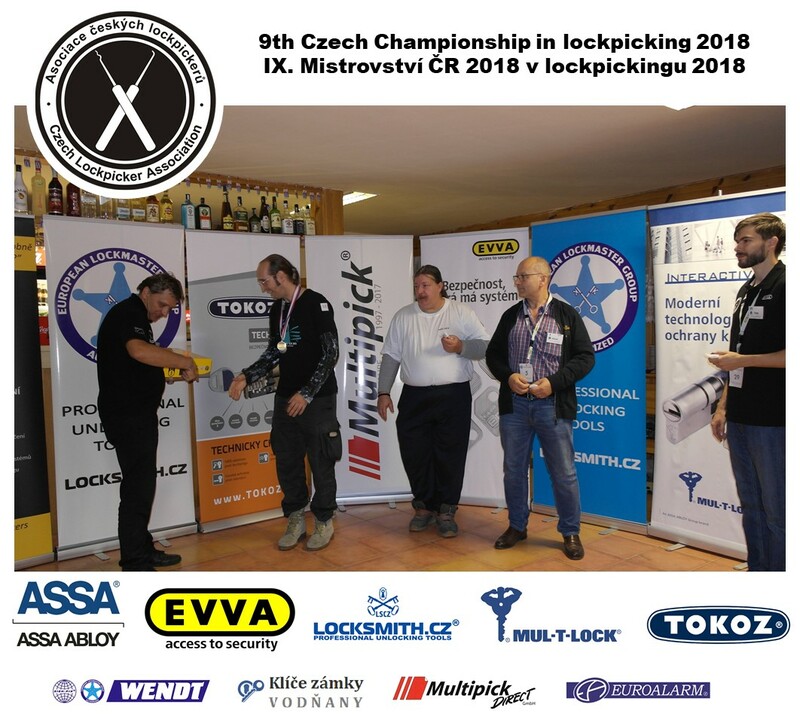 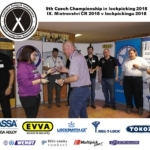 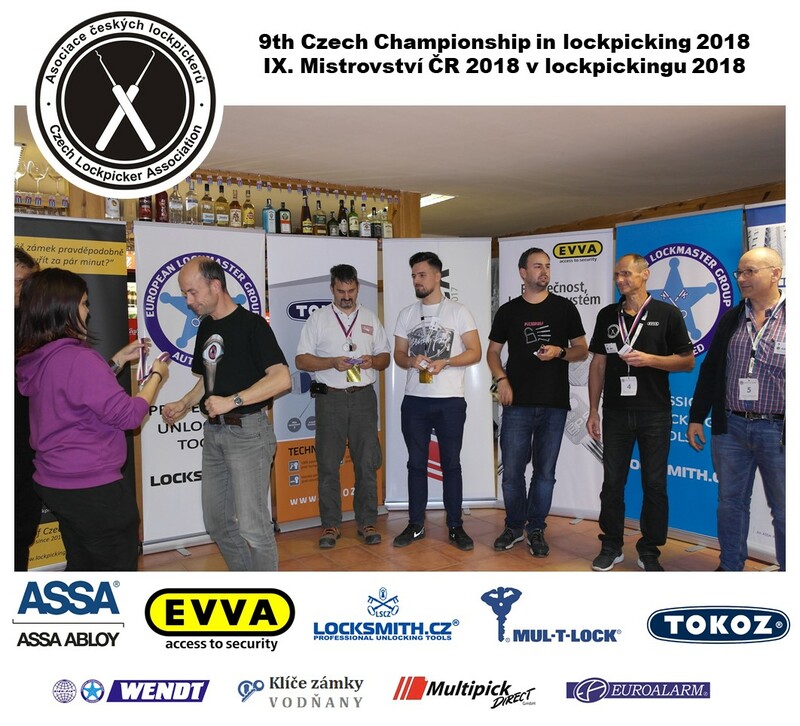 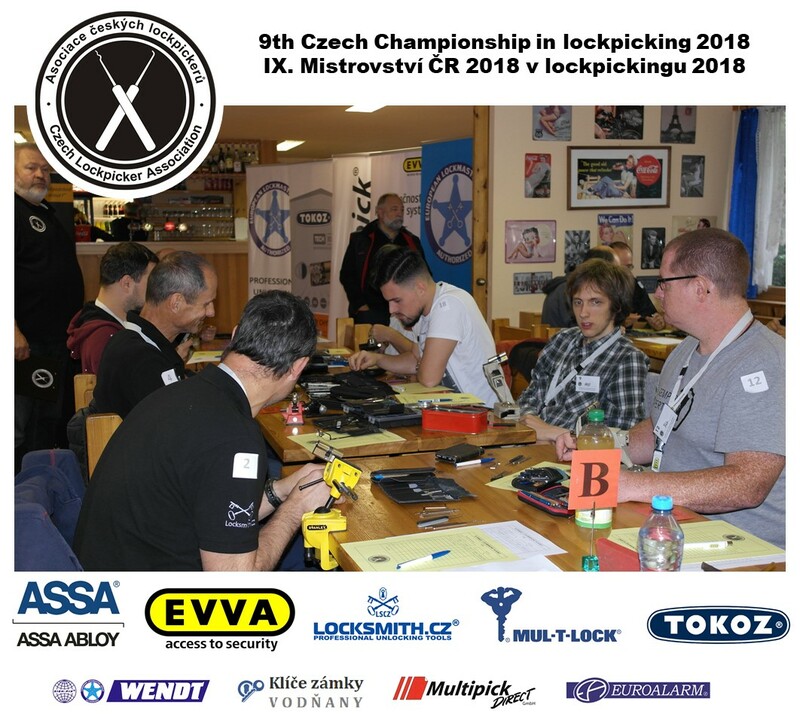 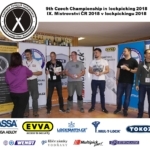 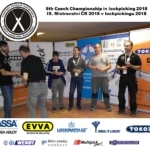 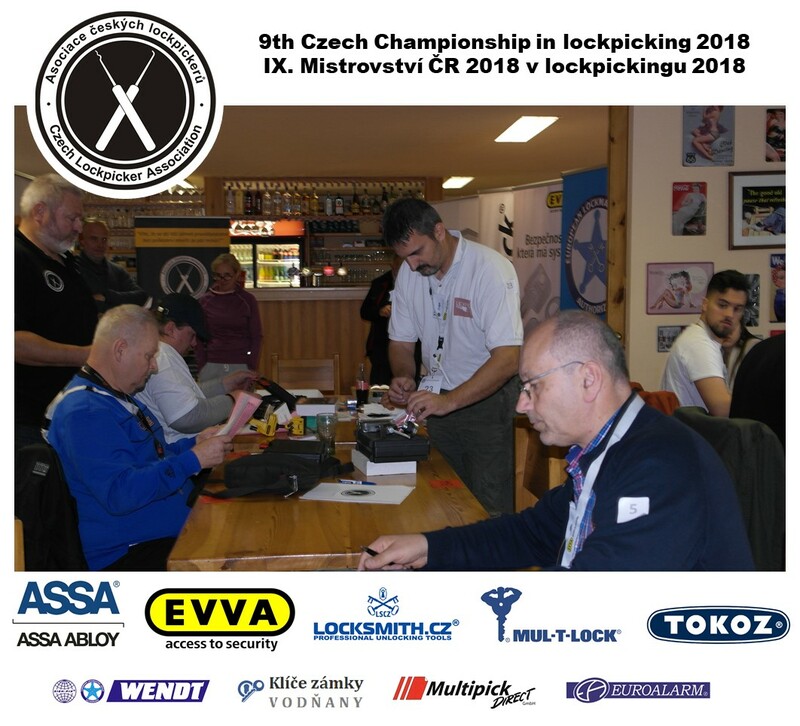 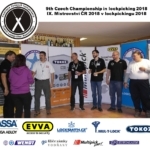 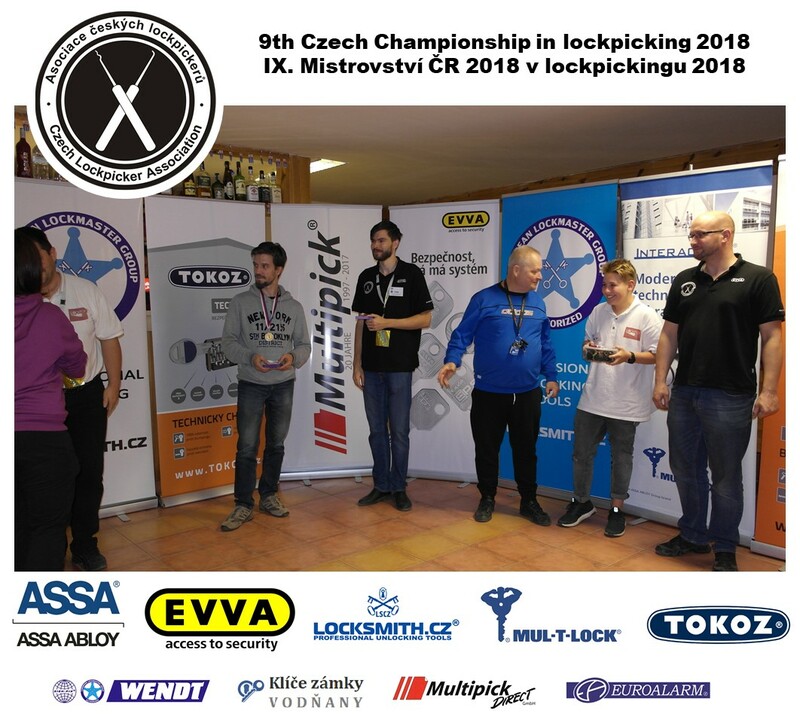 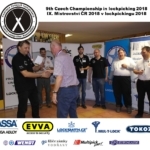 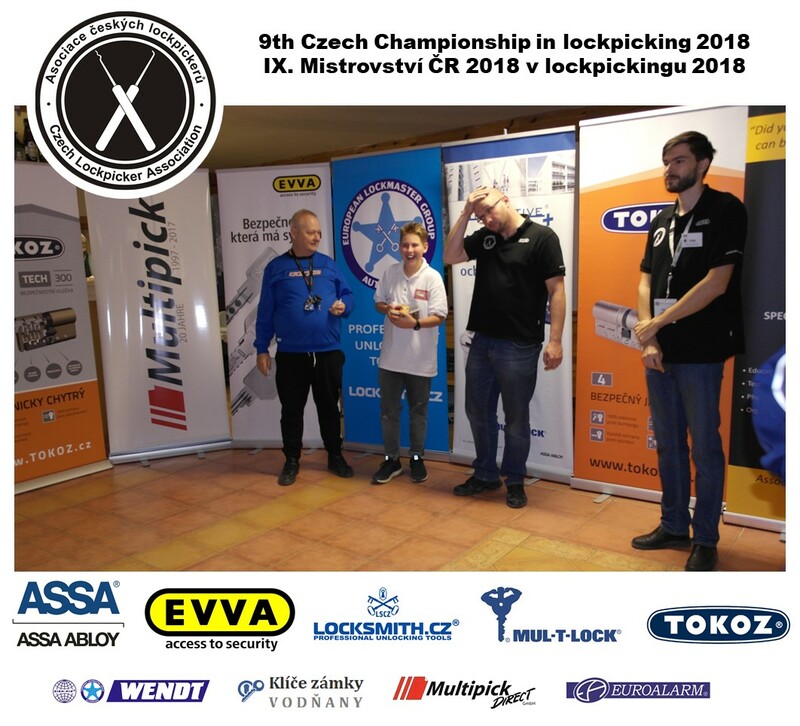 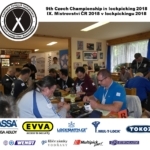 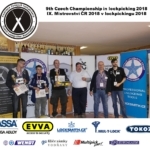 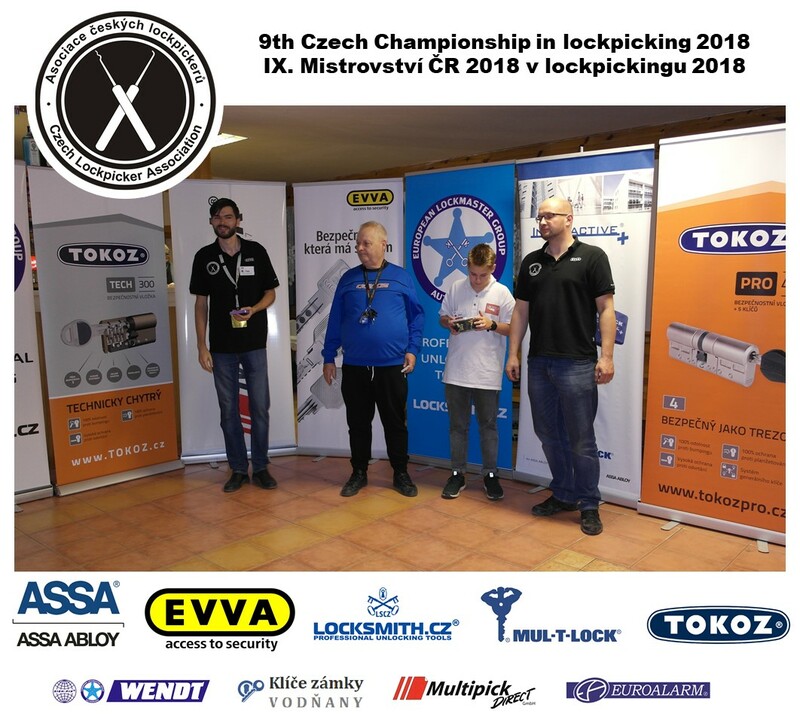 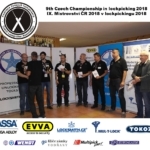 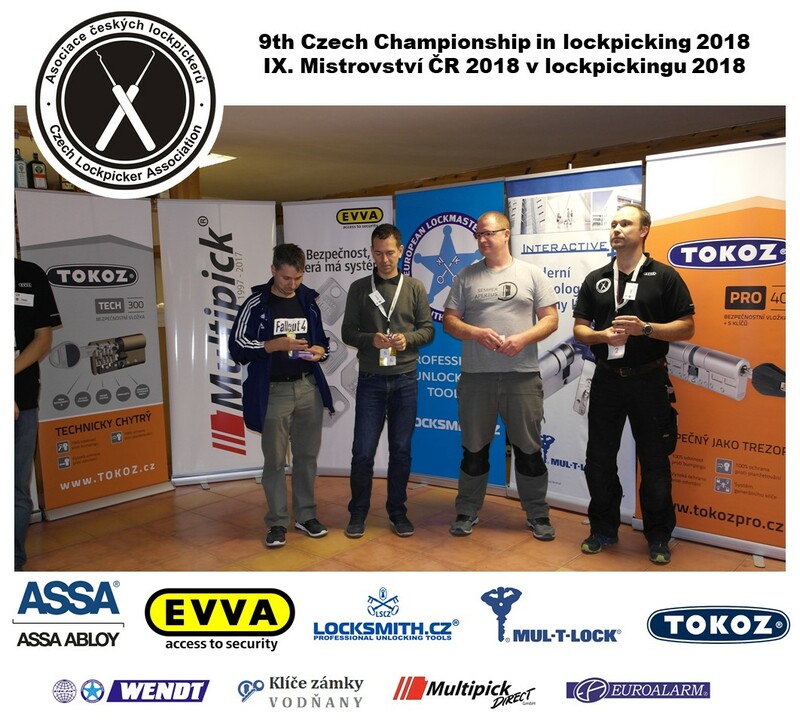 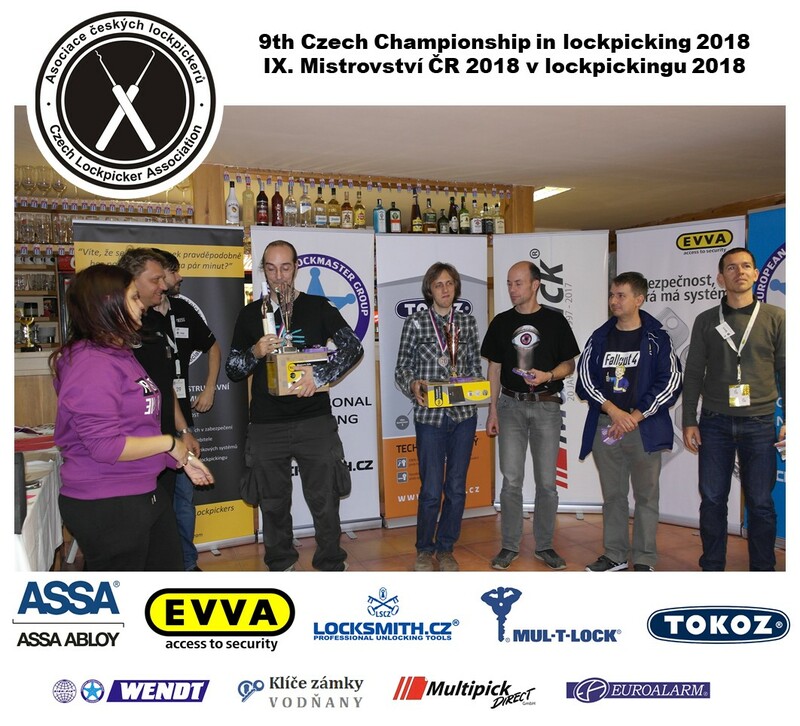 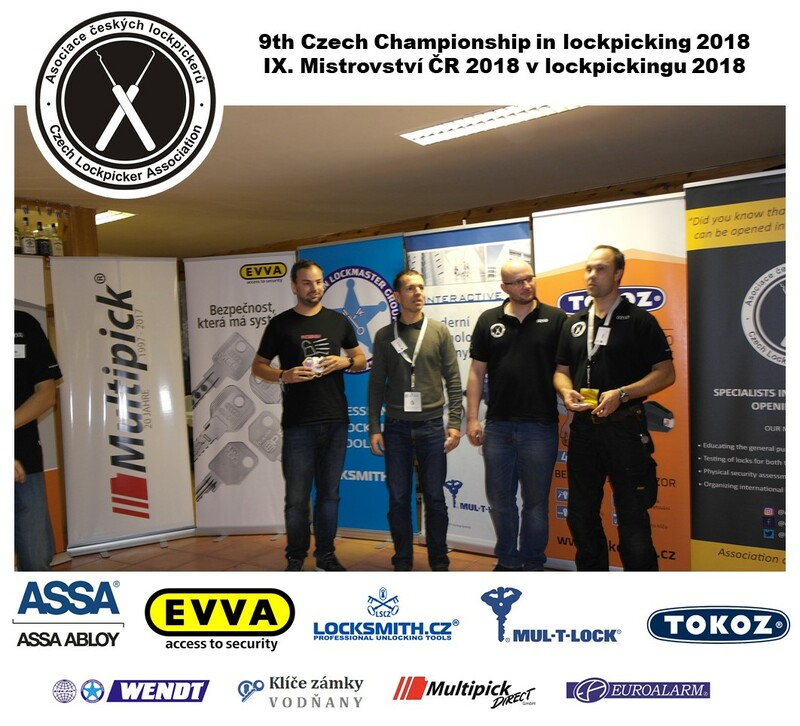 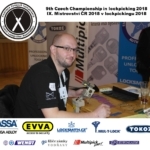 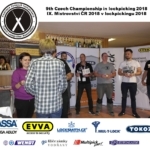 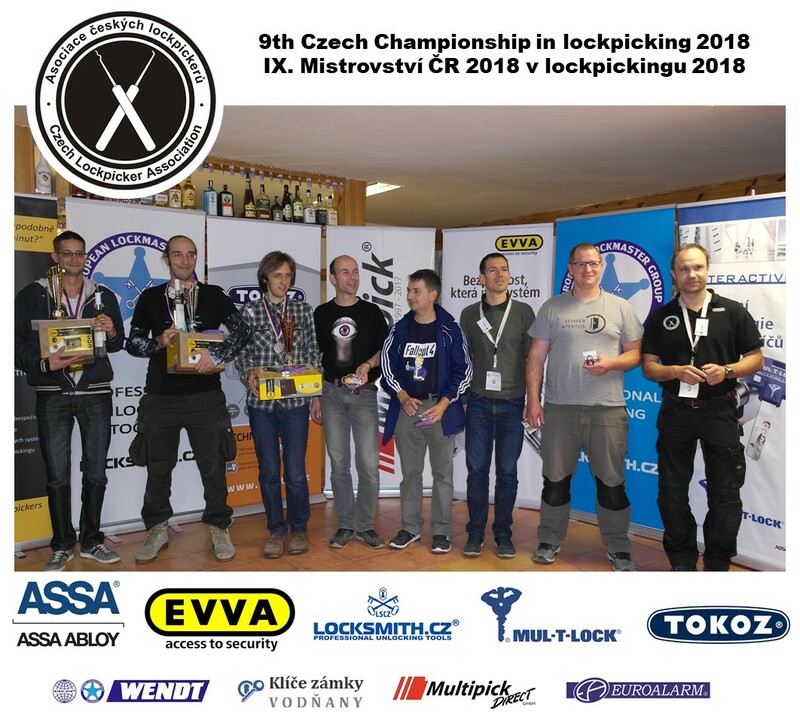 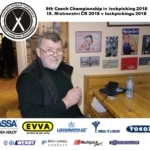 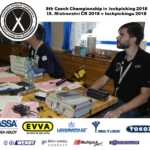 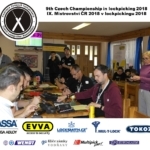 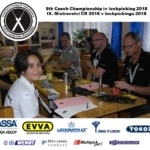 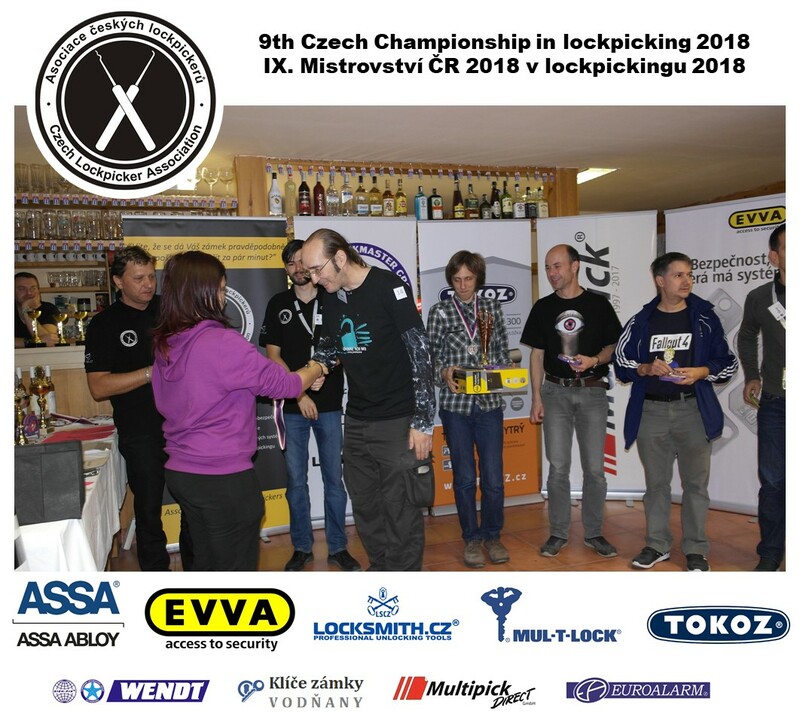 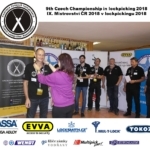 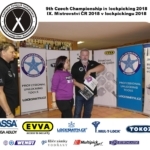 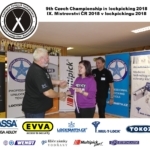 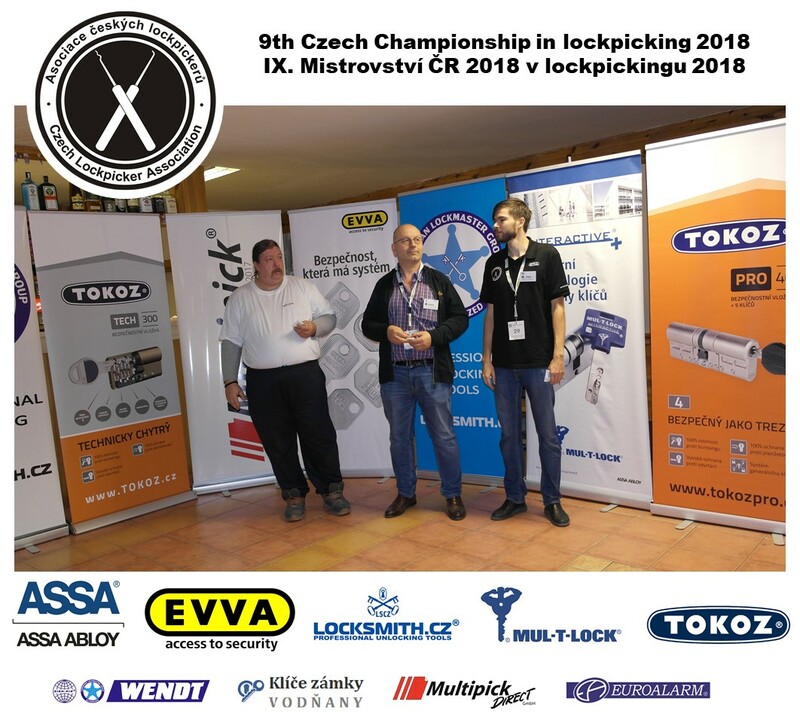 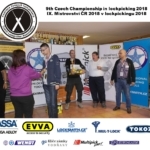 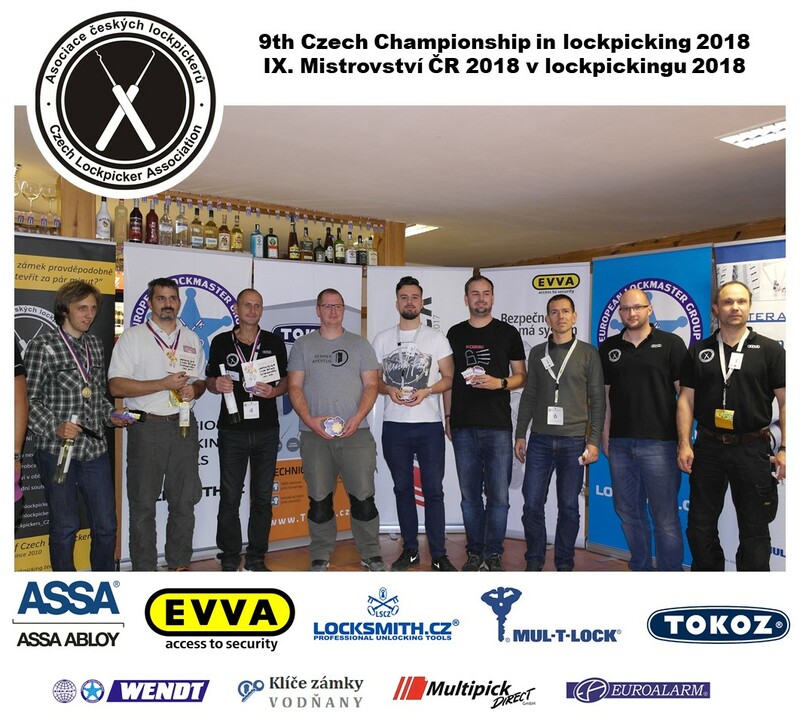 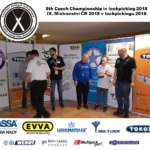 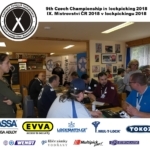 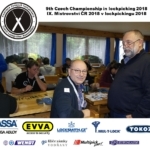 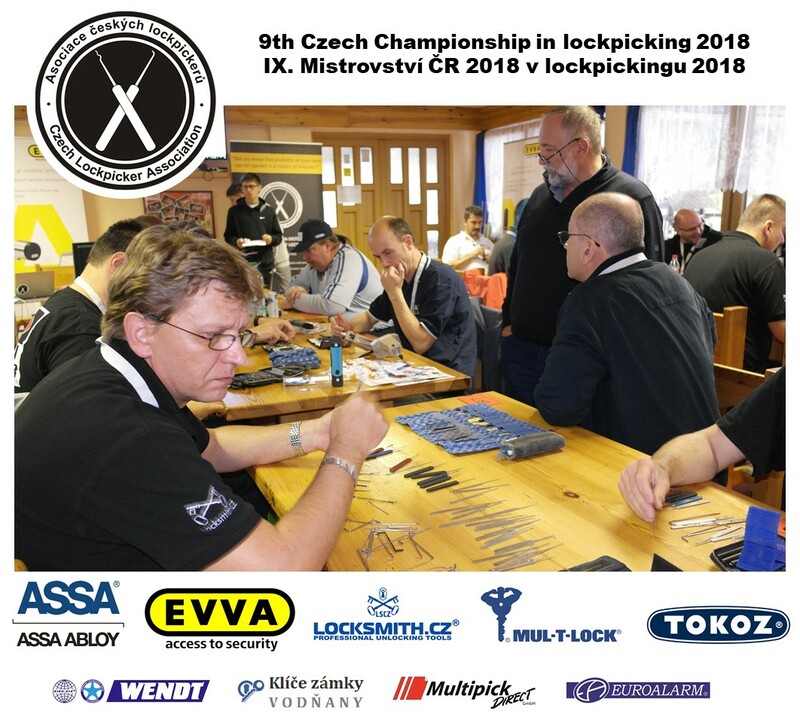 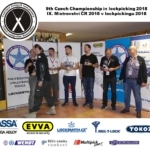 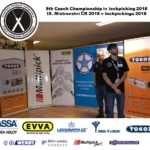 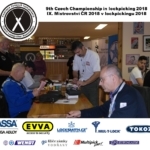 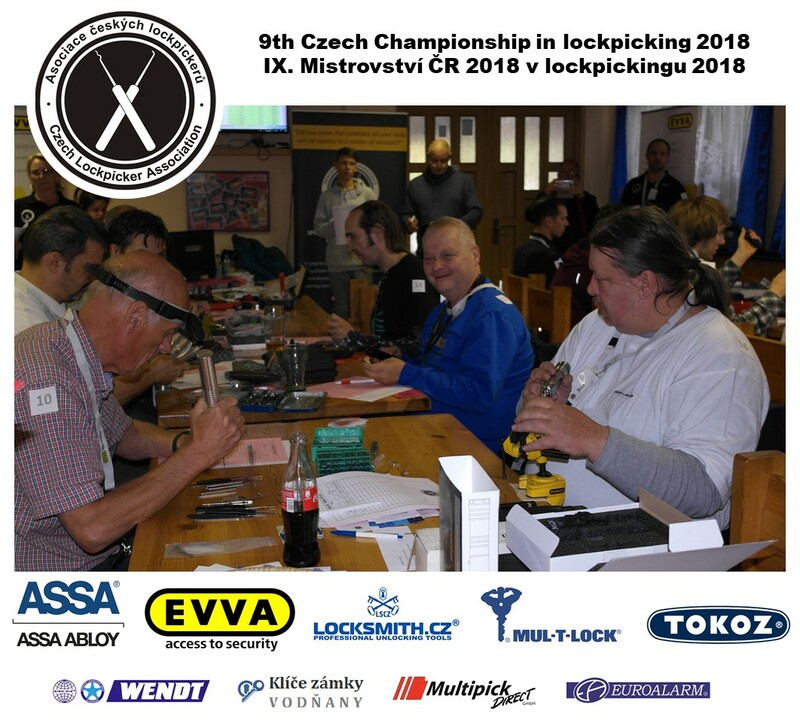 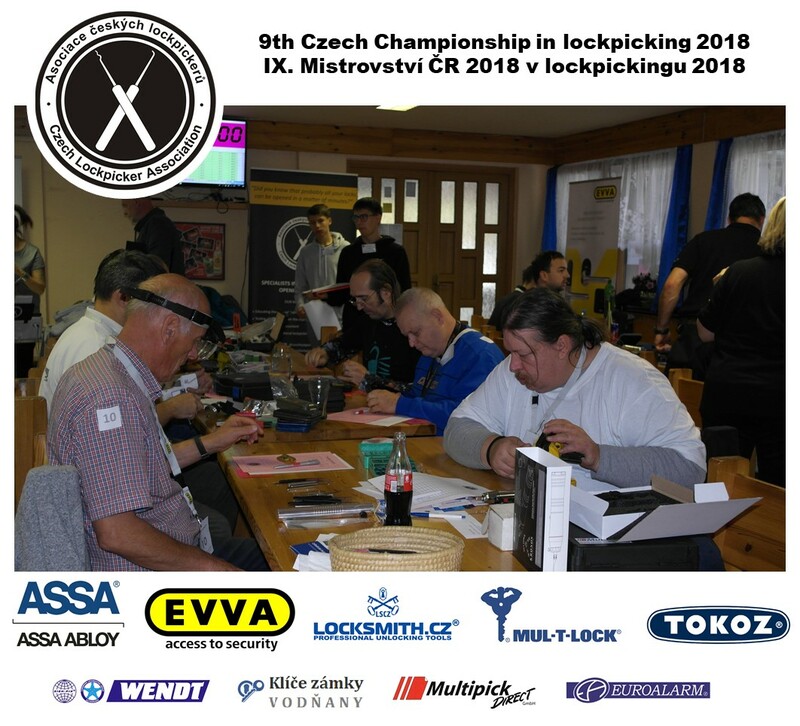 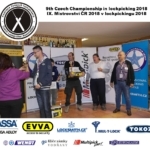 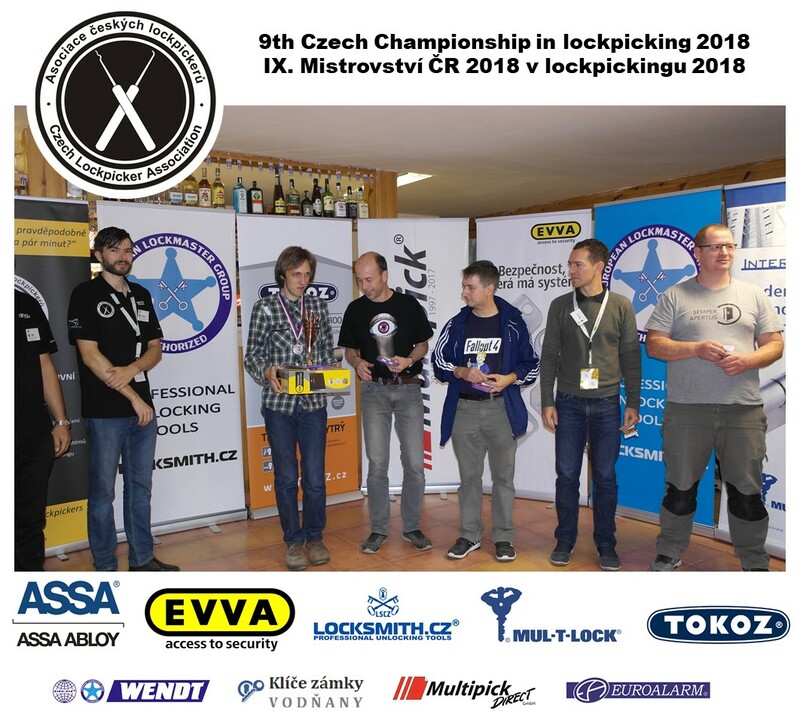 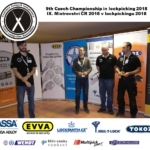 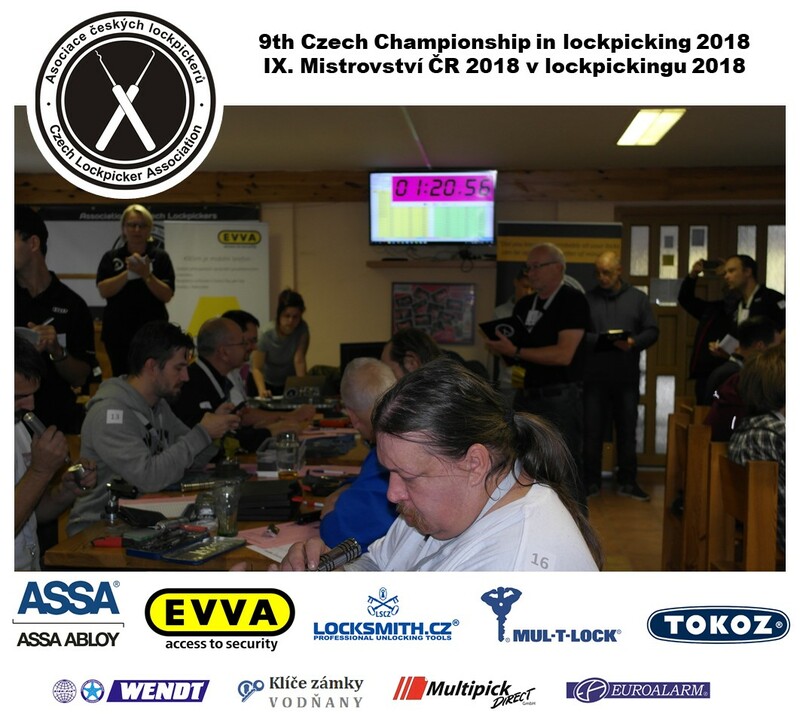 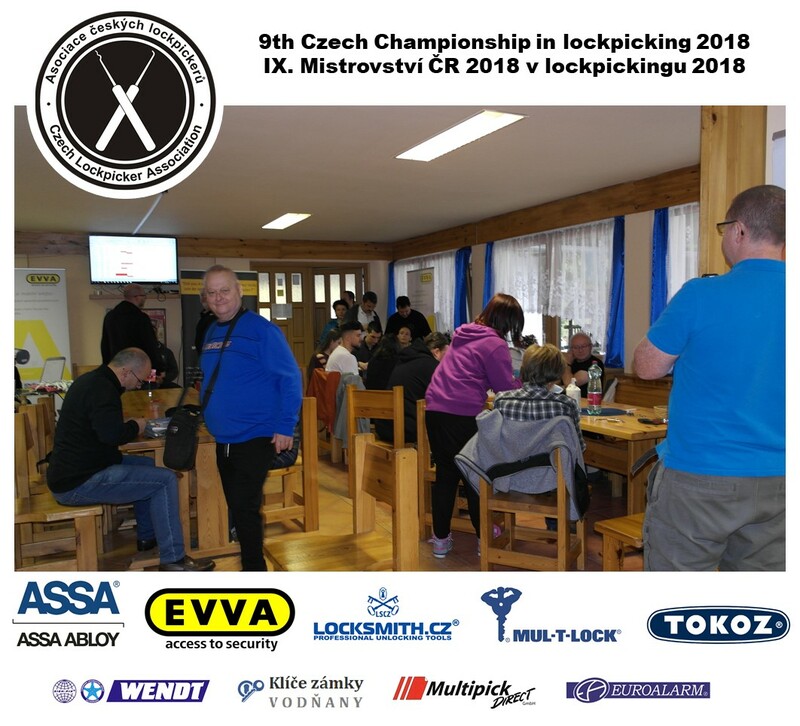 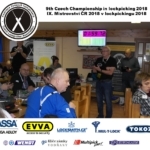 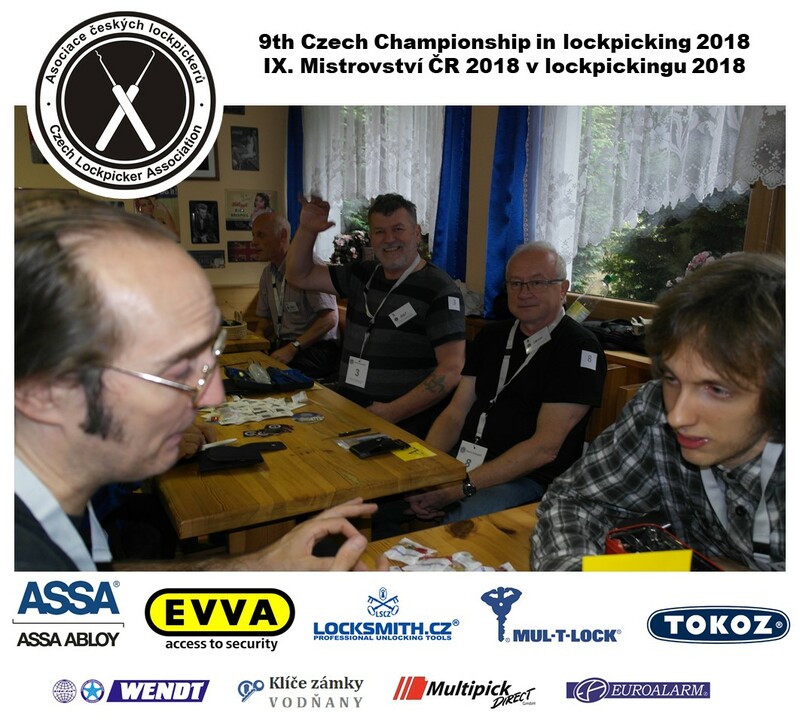 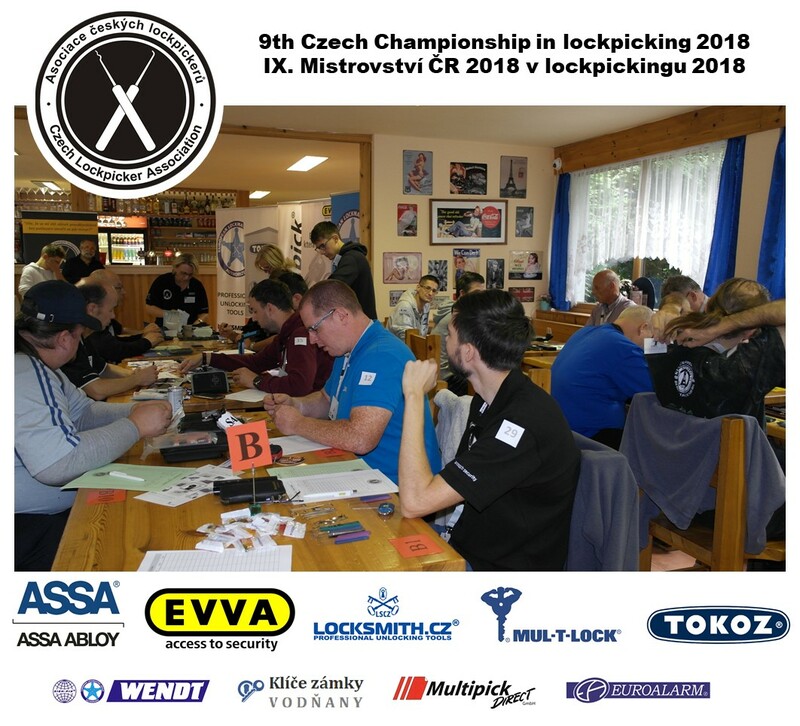 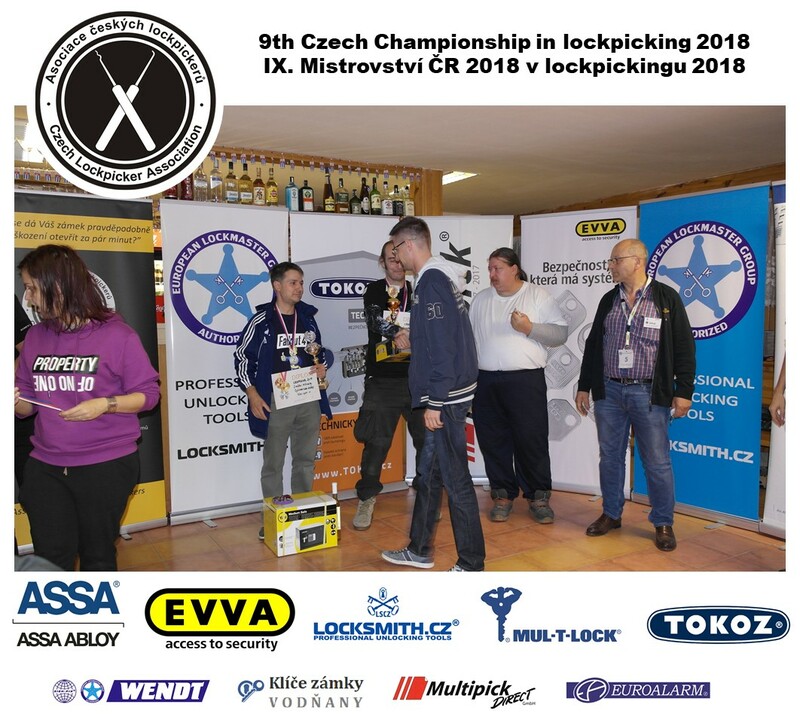 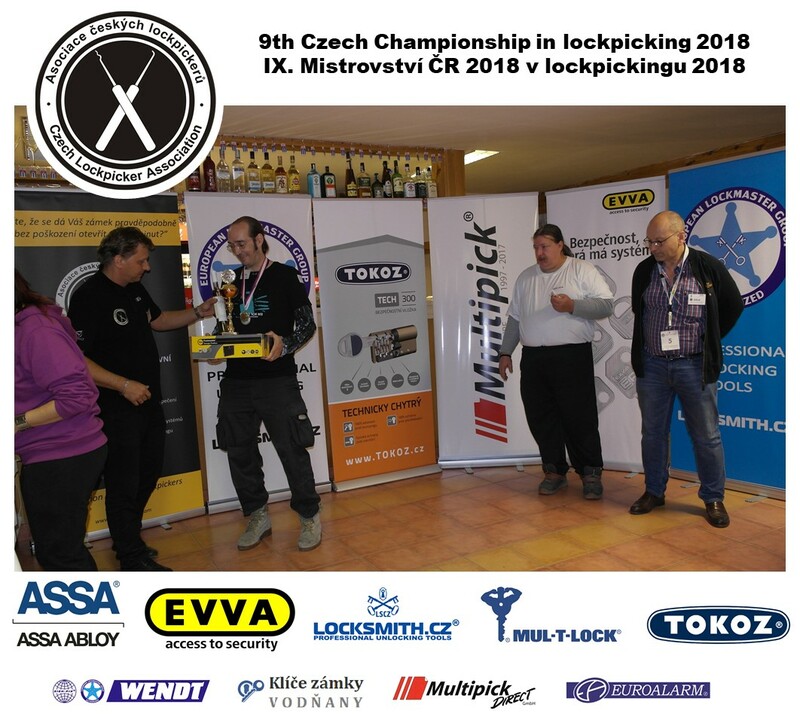 The title of Czech Lockpicker 2018 for best Czech lockpickers of the championship was also announced. 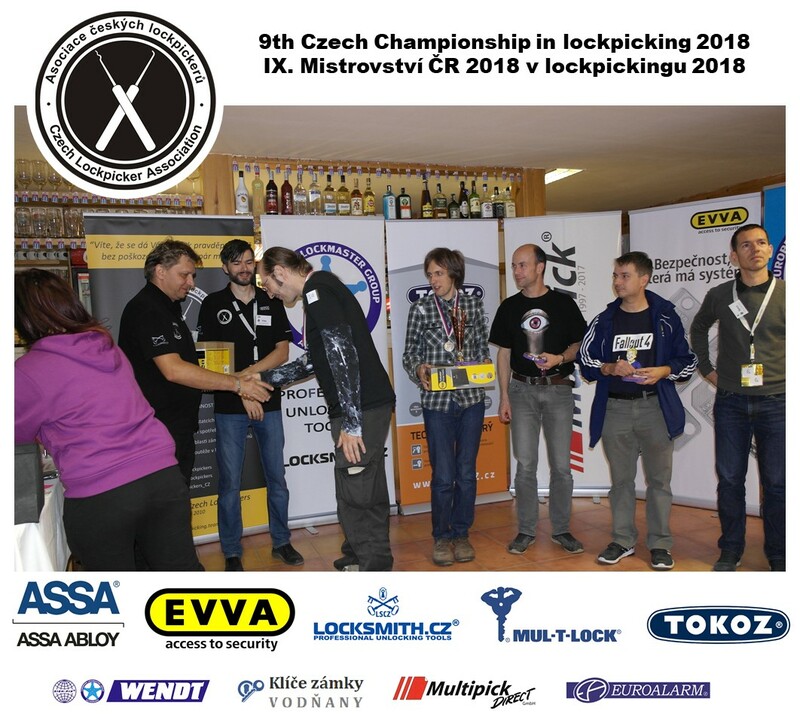 It was awarded to Jaroslav Coufal, who managed to open most locks during the championship. 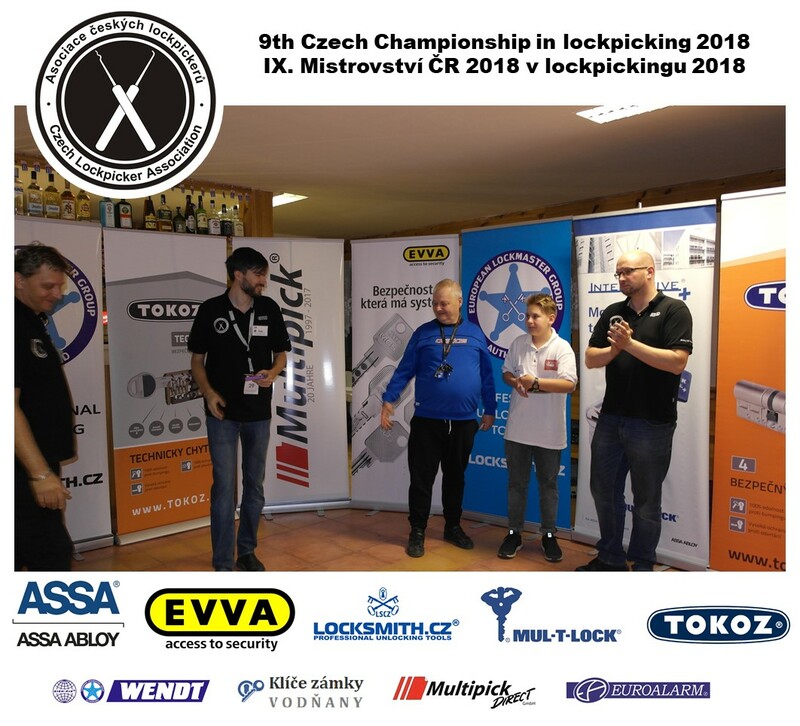 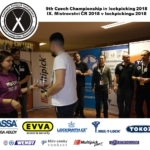 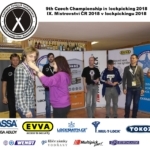 The title of the 1st vice-champion of the Czech Republic in lockpicking was given to Roman Hora, who defended it the same position from the previous year. 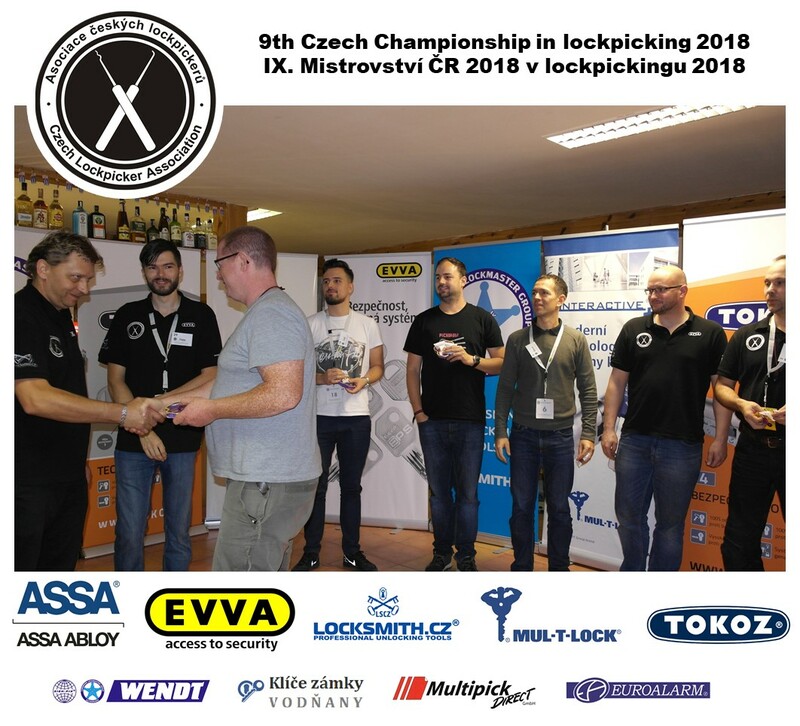 The 2nd vice-champion title was awarded to Marek Pederzoli. 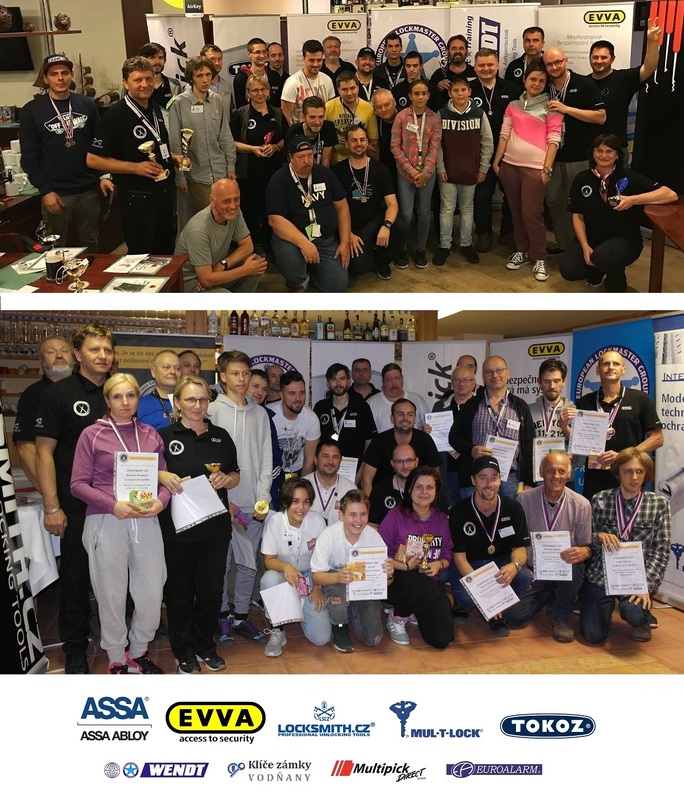 We are already looking forward to the 10th anniversary of our competition, which will take place in the first half of September 2019. 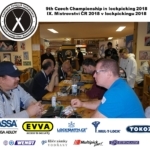 This championship will be a much bigger 3-day event (Friday to Sunday). 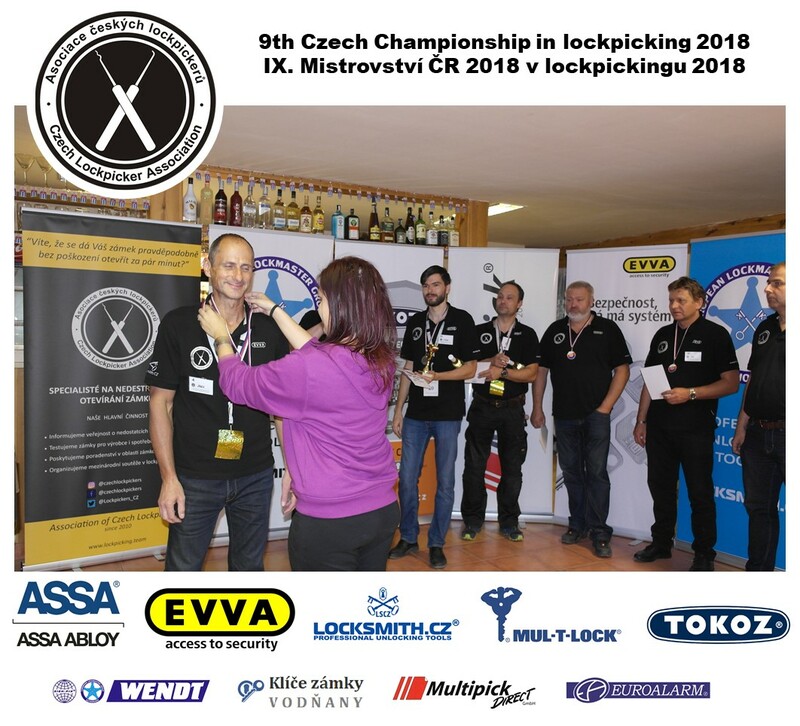 There will be at least 2 new disciplines (including the opening of safe locks), guests from all over the world and interesting accompanying program. 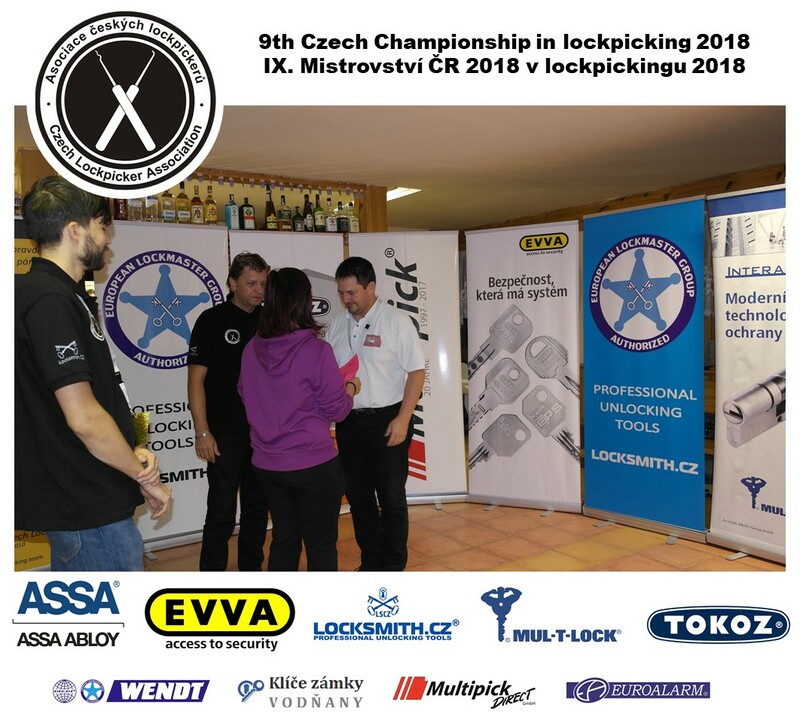 More information will be available soon on our website or facebook.